Does anyone even use the word dinette anymore? I haven’t heard it used in ages. Heck, I can’t even find it on google. 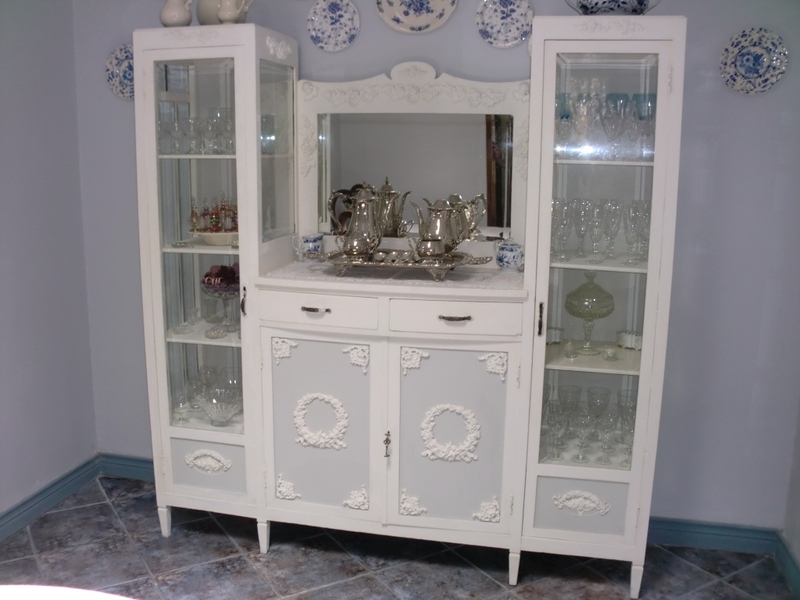 But back in the day, dinette sets were really popular for small apartments as well as for eat-in kitchens. 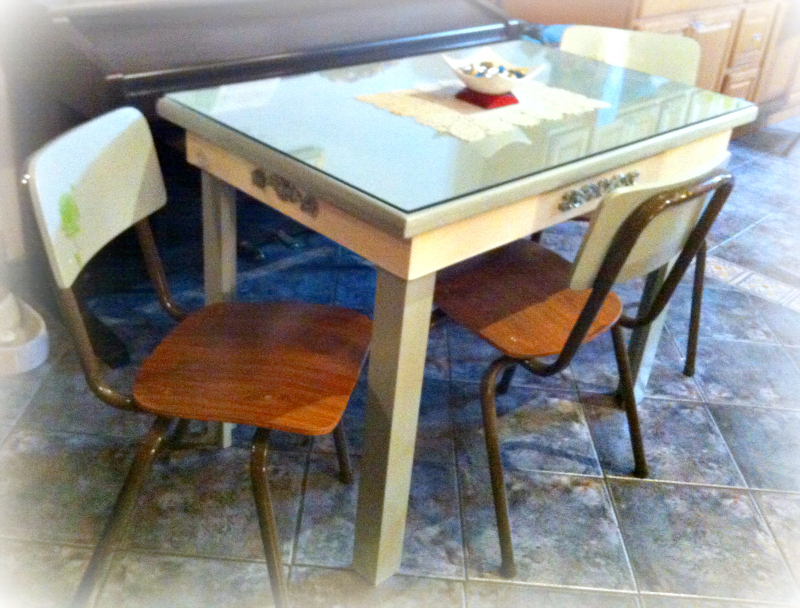 That’s what I had in mind when I put together a little table and four non matching chairs for my oldest daughter’s tiny dining room this past December. She rents a small house a few blocks away from us which is just the perfect size for her and a roommate. 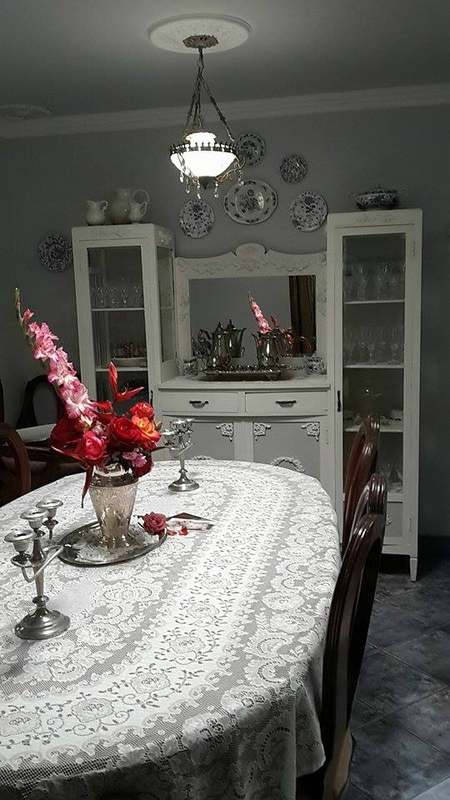 However, her roommate of many years moved out at the end of last year and because the dining set was hers, she took it with her. 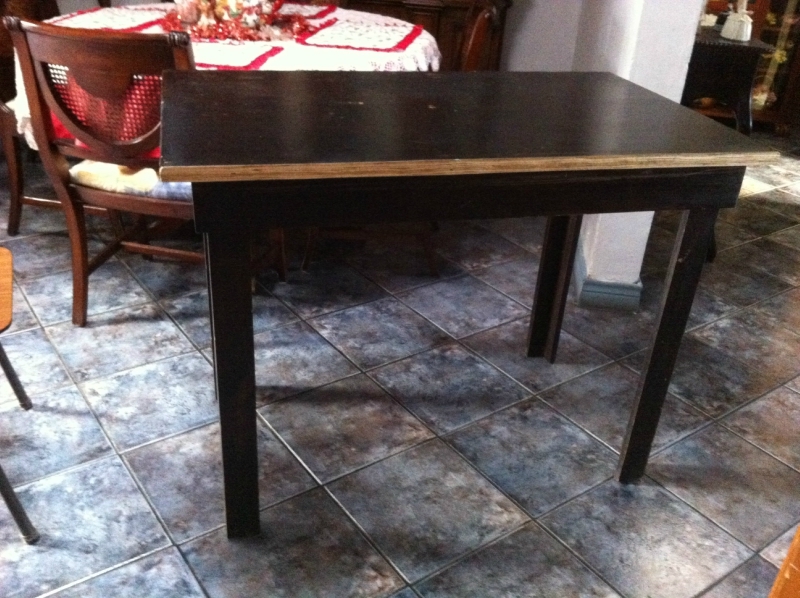 At around the same time, my daughter in law was getting rid of a little rustic sewing table that her mother no longer needed and I figured it would make a perfect temporary dining table for my daughter. At least until she got around to buying something nicer. 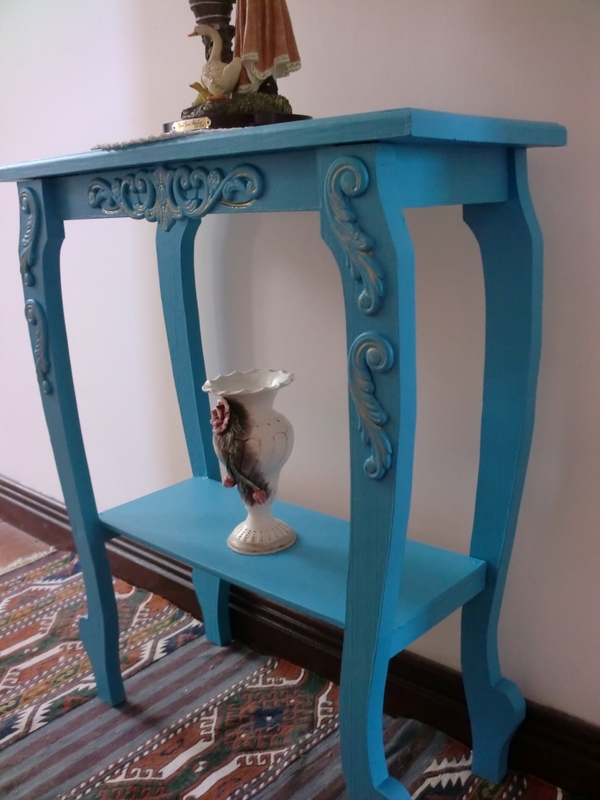 Even though it was a small table, it was unusually tall so I had to cut three inches off the legs to make it the right height. 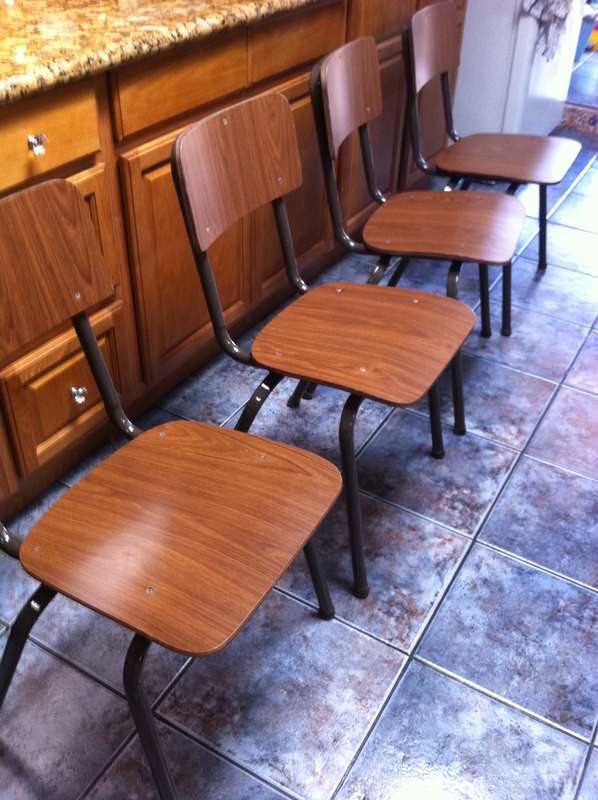 Next I had to find some inexpensive chairs that were not too large or too beat up. 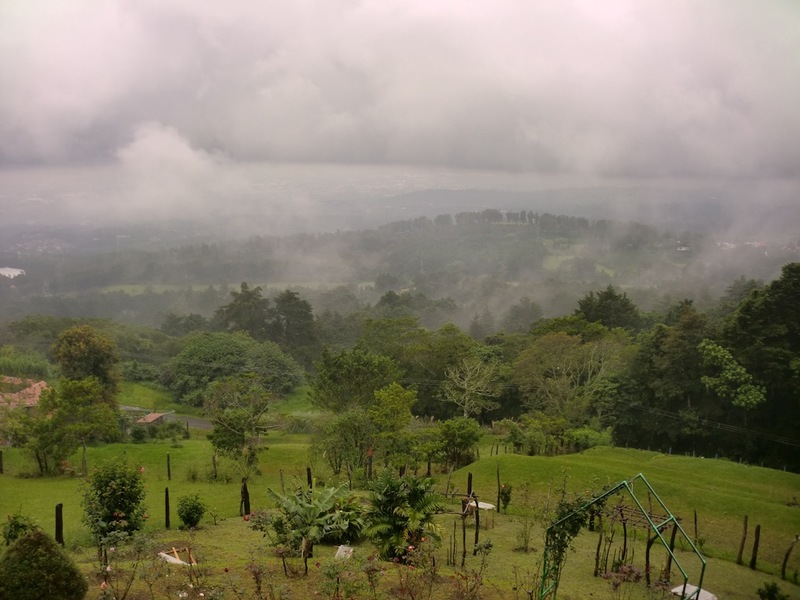 That was going to be challenging here in Costa Rica where used items in good condition are often just as expensive as new ones and old beat up items are just a tad less costly. The stars and planets must have been aligned in my favor because after just a quick check online I found someone (down the street from me!) 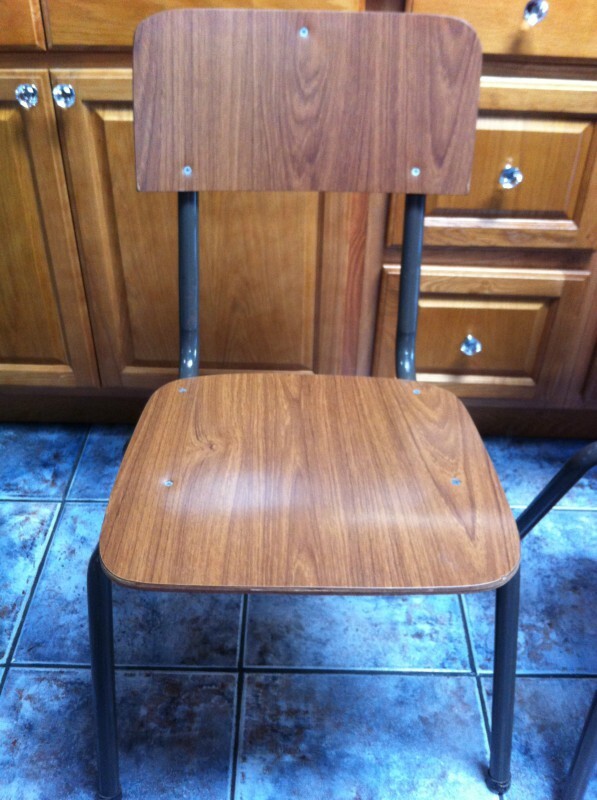 who had about 200 school chairs for sale in nearly new condition at $10 dollars each. 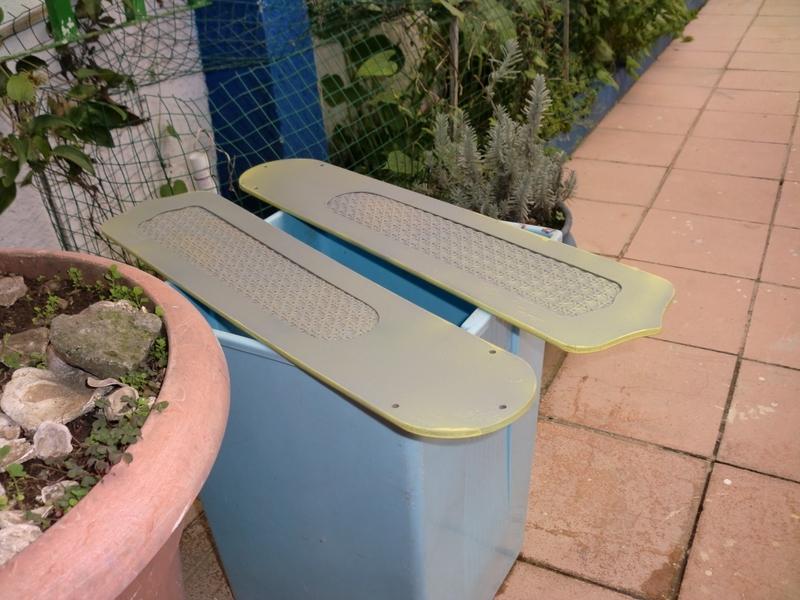 I purchased four of them and was delighted to see that they were strong and sturdy with metal frames and nice wooden seats and back rests. 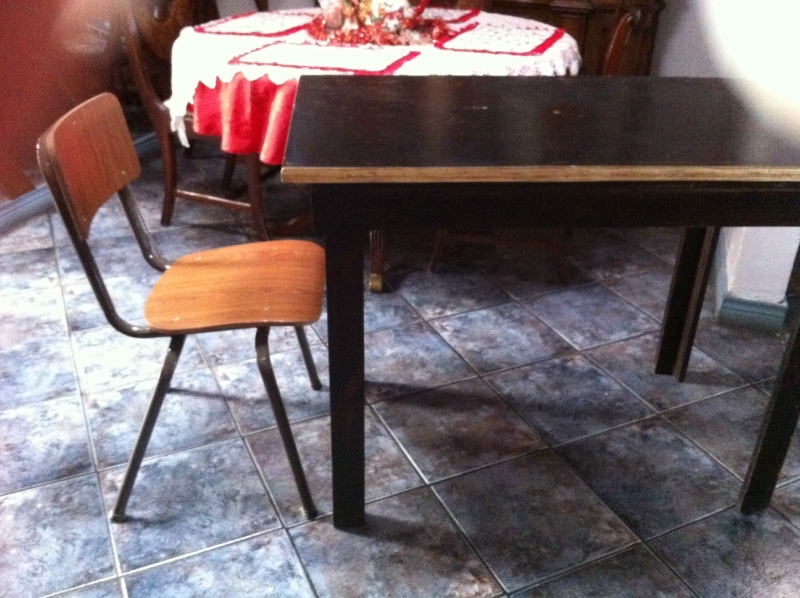 Now that I had the chairs, I turned my attention back to the table. 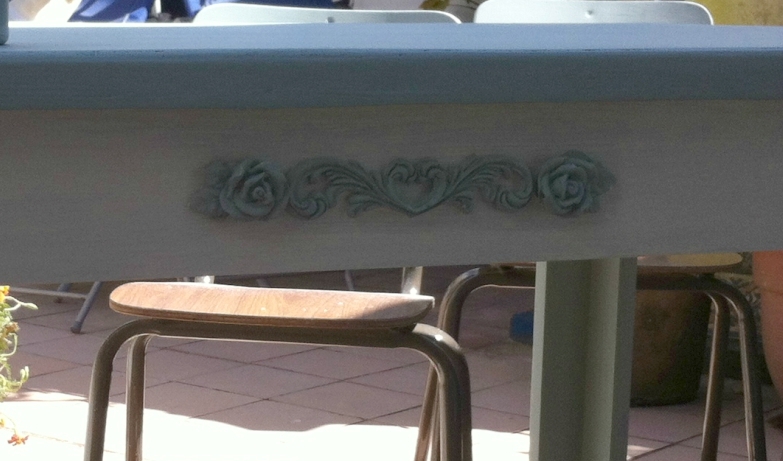 Some of the dark brown paint had started to chip and peel off in certain areas so I took it out to the backyard and sanded it to smooth down and even out the nicks. 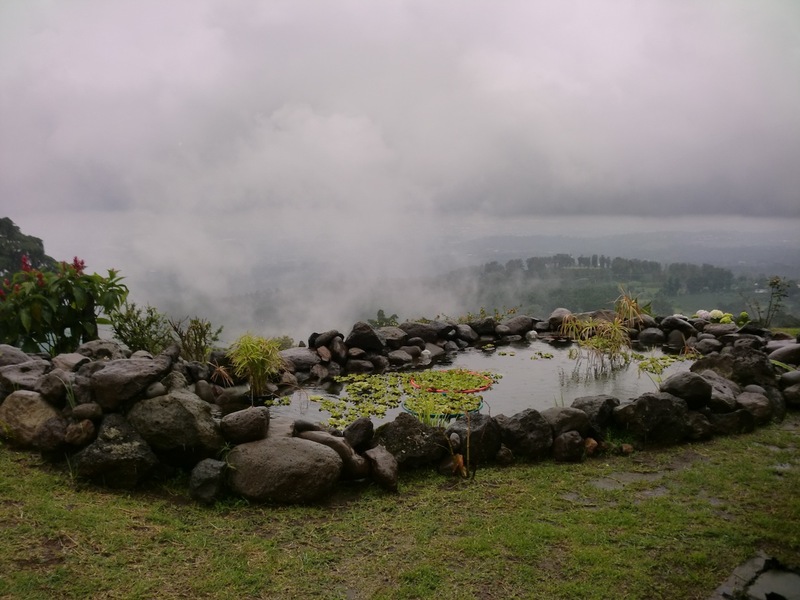 I was feeling quite pleased with myself and everything was going according to plan, until it rained. Athough I had carefully covered the table with plastic after I was done sanding, it rained so hard that afternoon that the wind lifted up the plastic and pushed rainwater beneath it, soaking the entire table. 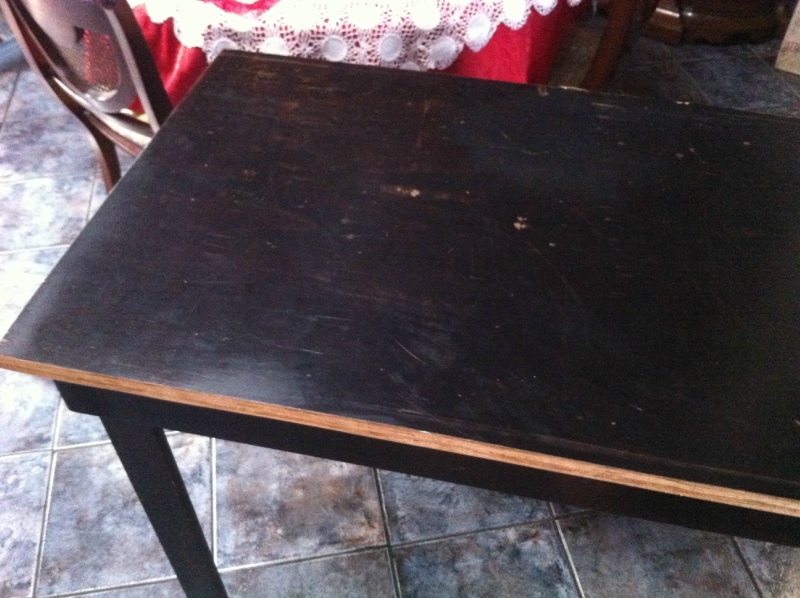 The next day I woke up to a seriously warped and blistered tabletop that I knew I wouldn’t be able to fix. Thankfully my next door neighbor Elmer is a carpenter so I asked him for help. 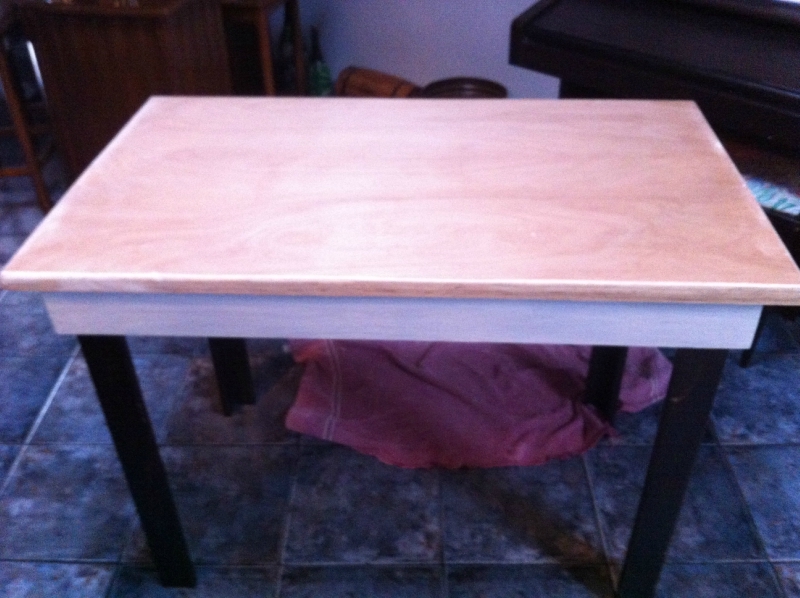 He was kind enough to nail/glue on a thin sheet of new plywood over the old tabletop and round off the edges for me. 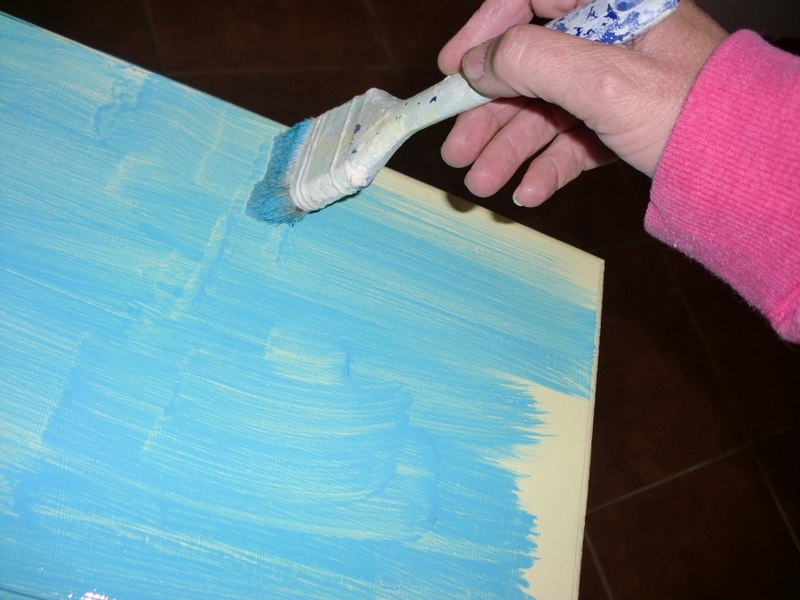 As I debated what color to paint it, my daughter in law again came to the rescue and offered me several unopened jars of Americana Chalk Paint that she no longer needed as she and my son were getting ready to move back to Colorado and were getting rid of all their stuff. I was doubtful about the color at first. It looked sort of grayish in the jar. But hey, never look a gift horse in the mouth, right? 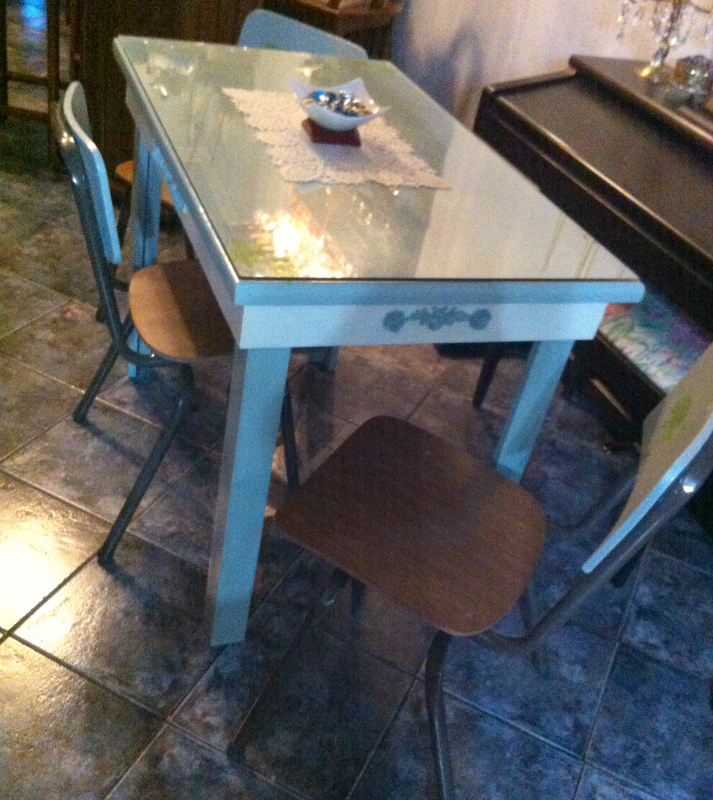 I ended up loving the color once it was on the table. It’s actually a soft bluish green. 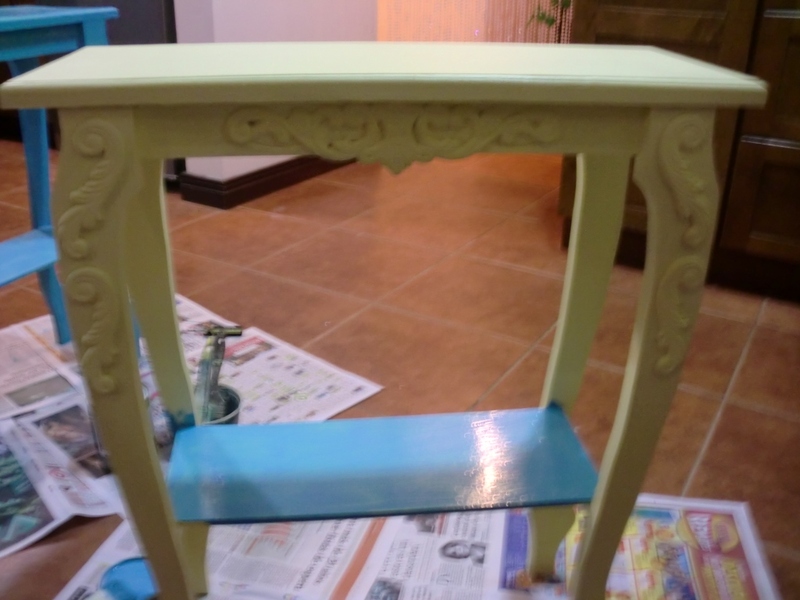 The table had an apron on all four sides that I decided to paint white, for contrast. 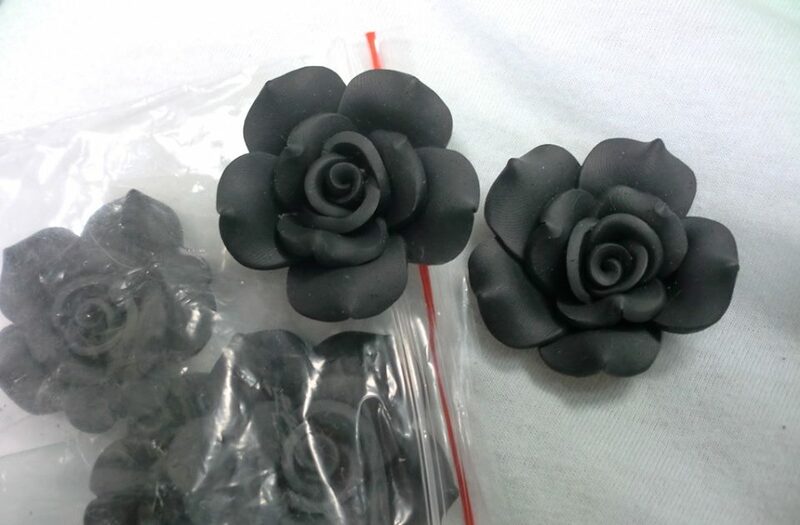 I also had a bag full of left over resin appliques that I had made last year which I thought might look nice on the apron. 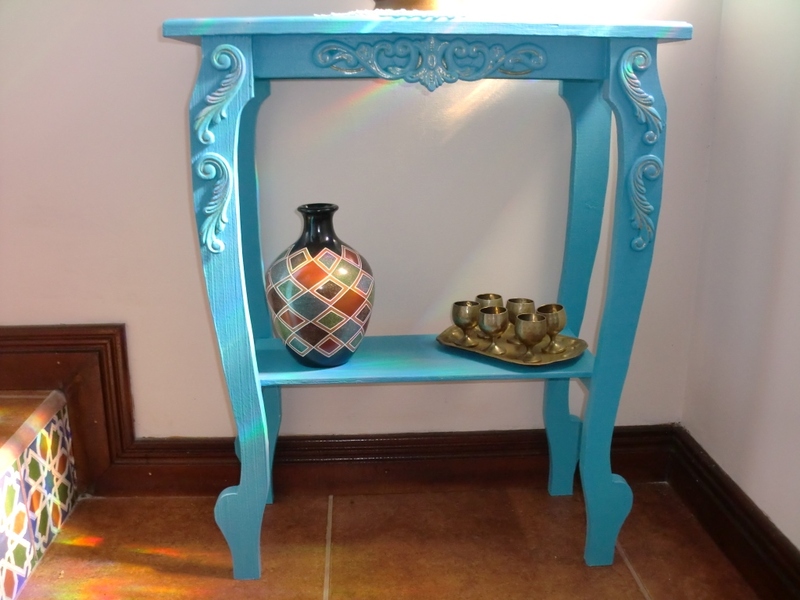 They were mostly odds and ends and I was unable to find four matching pieces so I used two smaller pieces for the two ends of the table and two larger pieces for the sides. 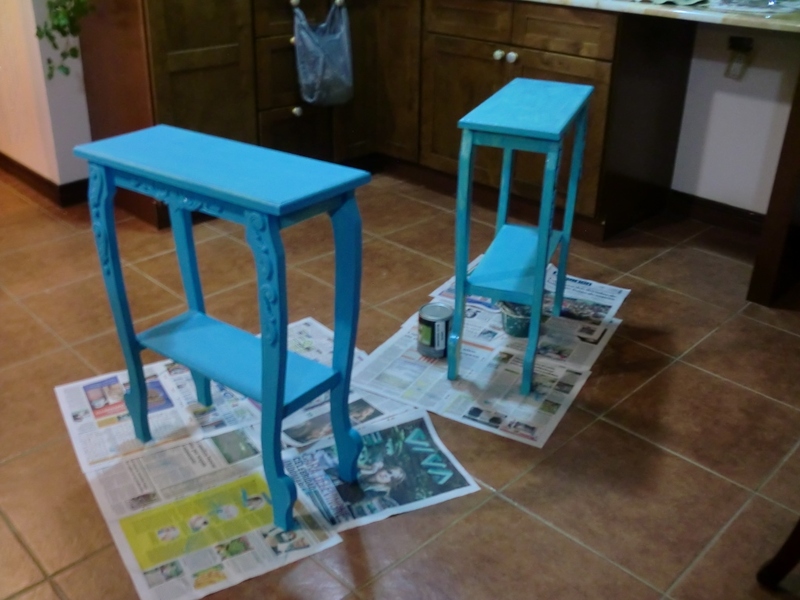 I was tempted to leave the chairs as they were because they really were in nice shape and didn’t need anything done to them, but unfortunately they clashed with the color of the table so I ended up just painting the backrest in the same bluegreen chalk paint and leaving the seat unpainted. 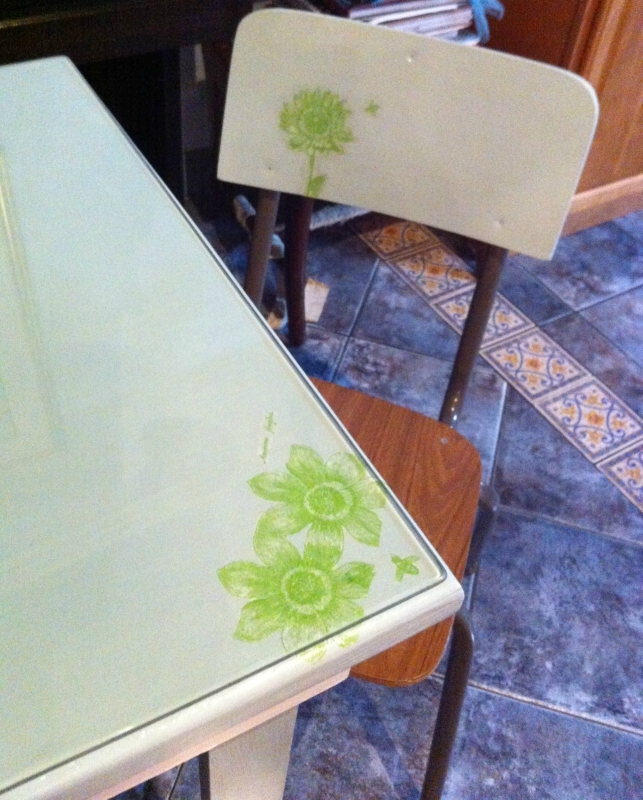 As a final touch I decoupaged a floral motif on the backrests and on opposite corners of the table with a bit of modpodge. Everything then got a protective topcoat of matte varnish. I also bought a piece of thick glass for the tabletop to protect it in case of spills. I loaded it up in the car and took it over to her house a couple of days before Christmas while she was at work to surprise her. 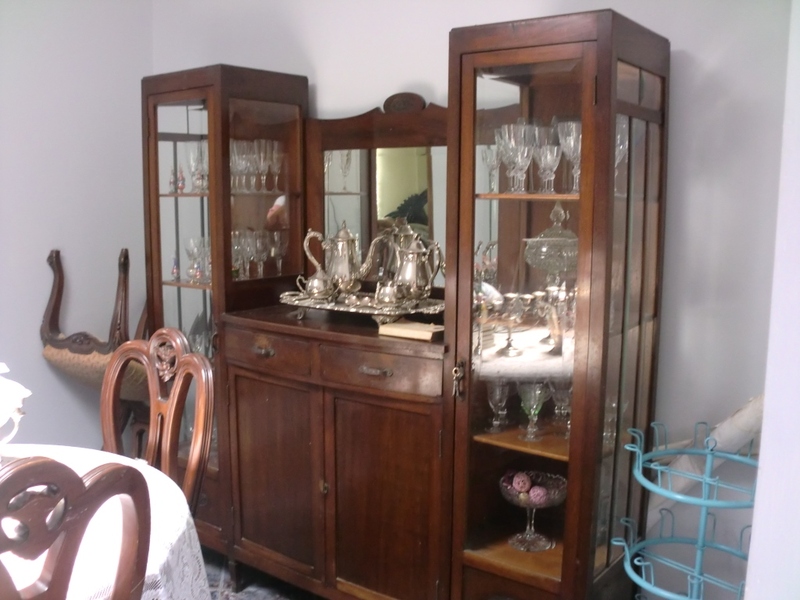 I was so excited about setting it up at her place that I completely forgot to take pictures of it in situ. So the only photos I have were snapped at my house. Thankfully she liked it…you never know with kids. Yay. 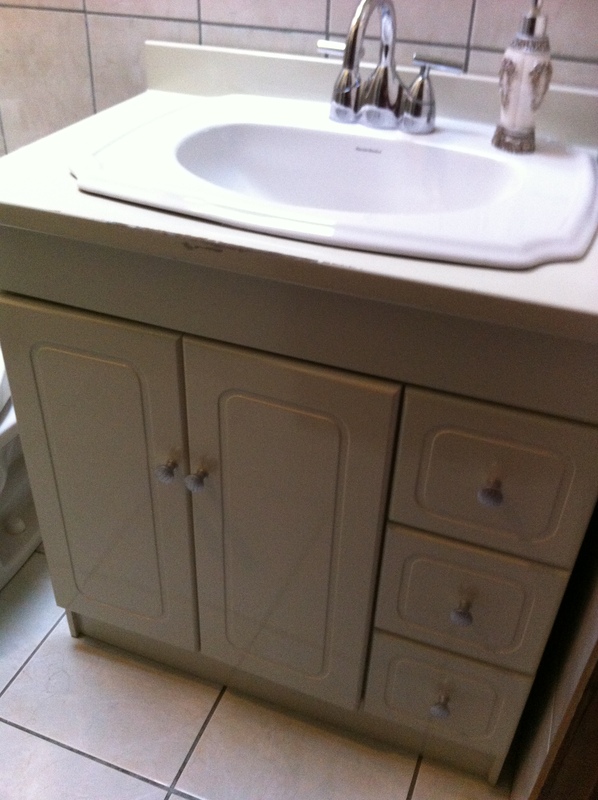 I had searched high and low for a solid wood vanity small enough to fit into the space where the pedestal sink had been but I was unable to find anything in real wood. 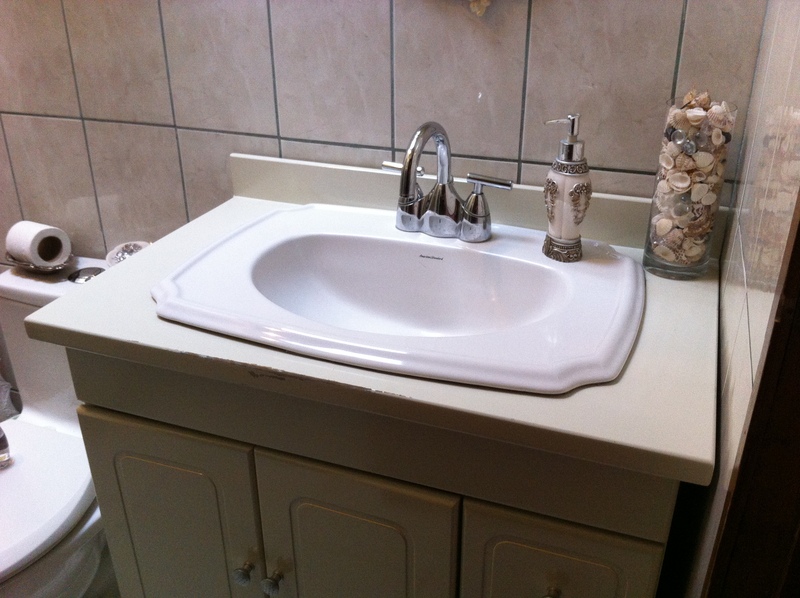 There were plenty of vanities made of laminate covered particle board that were just the right size but I was hesitant to buy anything made of laminate because it’s not very durable, particularly in humid conditions like a bathroom. 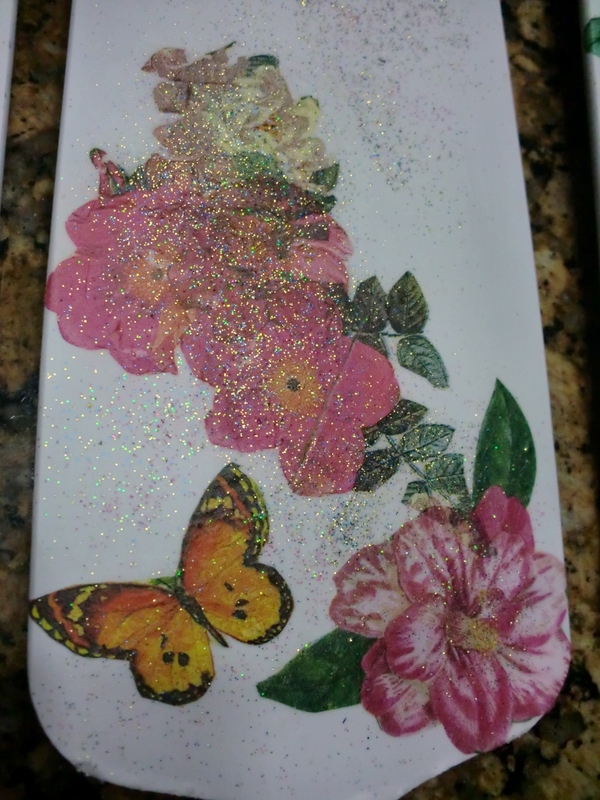 I’ve had several items made of melamine covered particle board and eventually have had to throw them out. 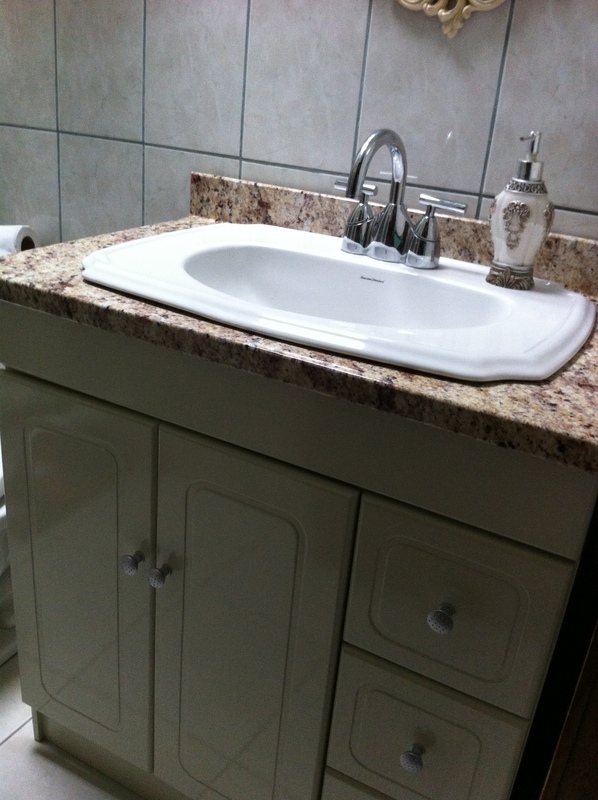 I was sure this laminate vanity wouldn’t last too long but I had to settle for what was available to fit the tiny space so I went ahead and bought it. Just as I predicted, not even two months later my housekeeper accidentally knocked down a small wall shelf in the bathroom with the end of the broomstick as she was cleaning. 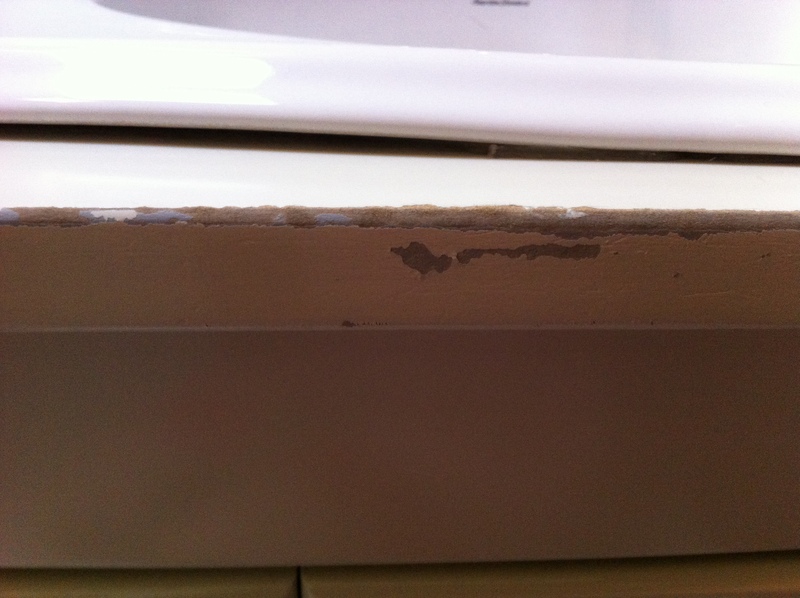 Naturally the shelf hit the edge of the vanity and cracked the laminate in three different spots. 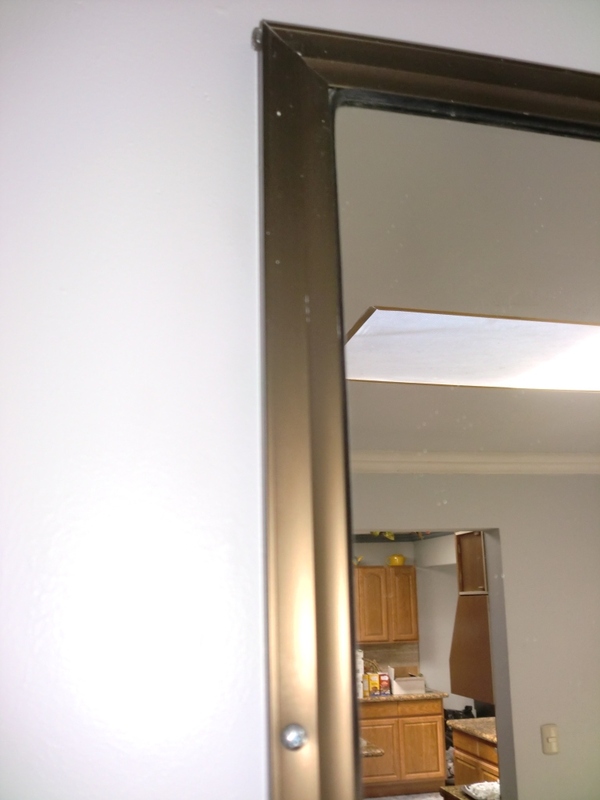 I tried to paint the cracked spots so as to protect the now exposed interior particle board but the paint didn’t last long and the cracks became larger and more unsightly as the months went by. 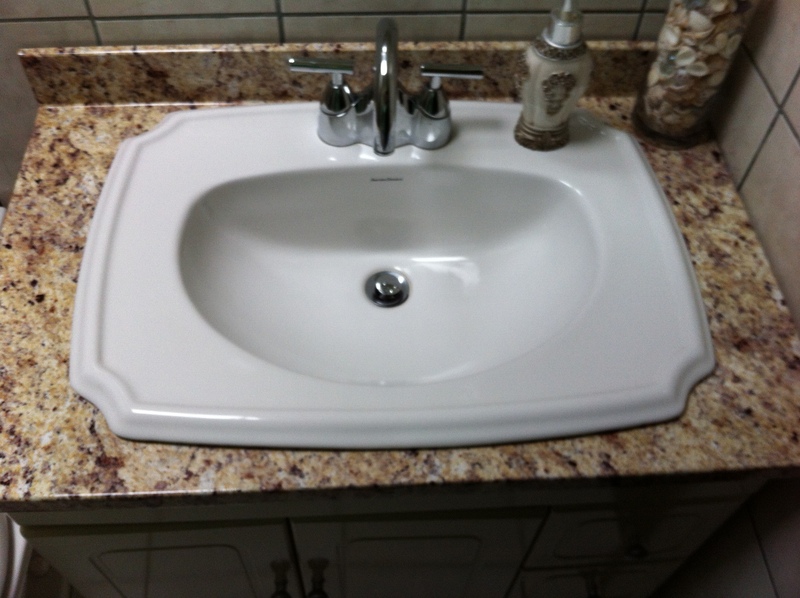 I was bummed out thinking that I’d have to replace the entire vanity after less than a year but after a quick online search for possible solutions, I came across a product called Instant Granite. 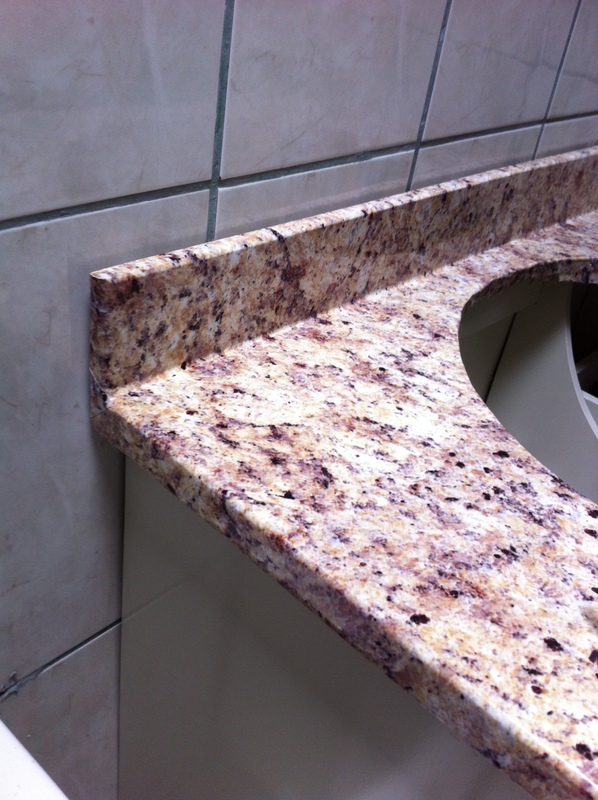 Instant Granite??? Of course I snickered and rolled my eyes at the mere thought of such a thing but after weighing all the options I figured this stuff would probably be the quickest and cheapest fix at around $39 dollars for a 6 ft roll plus $8 dollars shipping. I went ahead and ordered a roll on Amazon which arrived within two days. Talk about quick shipping! It’s a very thick self adhesive vinyl that you just measure, peel and stick. It comes with a little squeegy to get all the air bubbles out. Before attempting to install it, I watched every Youtube video and tutorial that I could find. 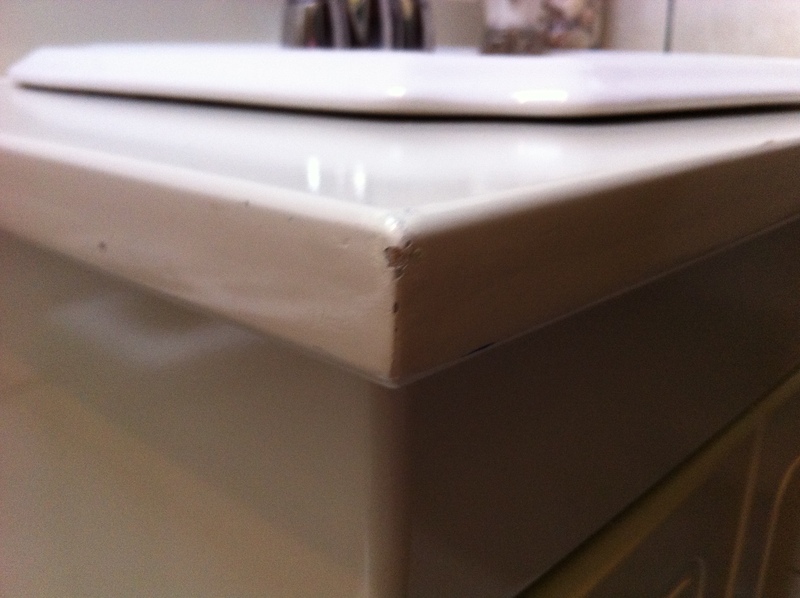 Apparently people have had great success with this stuff and they report that it’s held up quite well even on kitchen countertops. And supposedly it’s so real looking that it’s difficult to distinguish from the real thing. 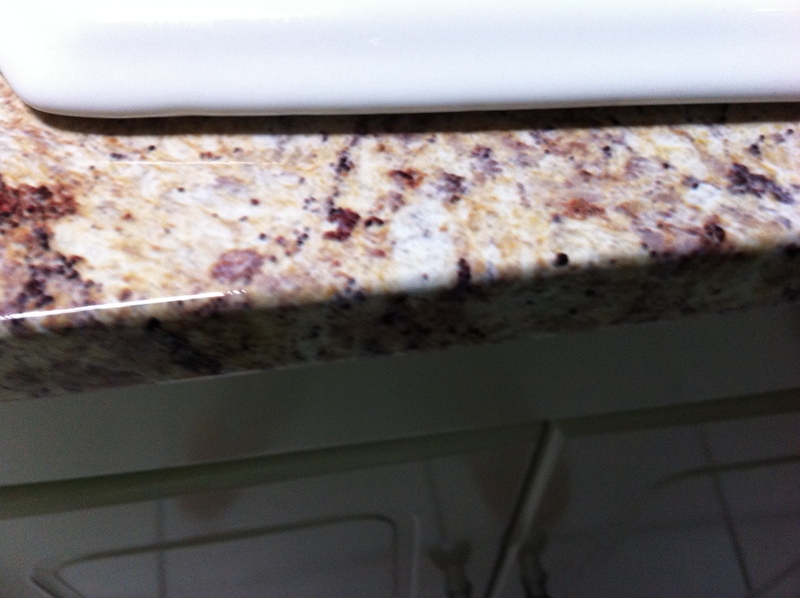 Although it can be cut around sinks and faucets, hubby was patient enough to remove the sink for me because I didn’t want to risk leaving any space for water or moisture to seep in between the laminate top and the instant granite. 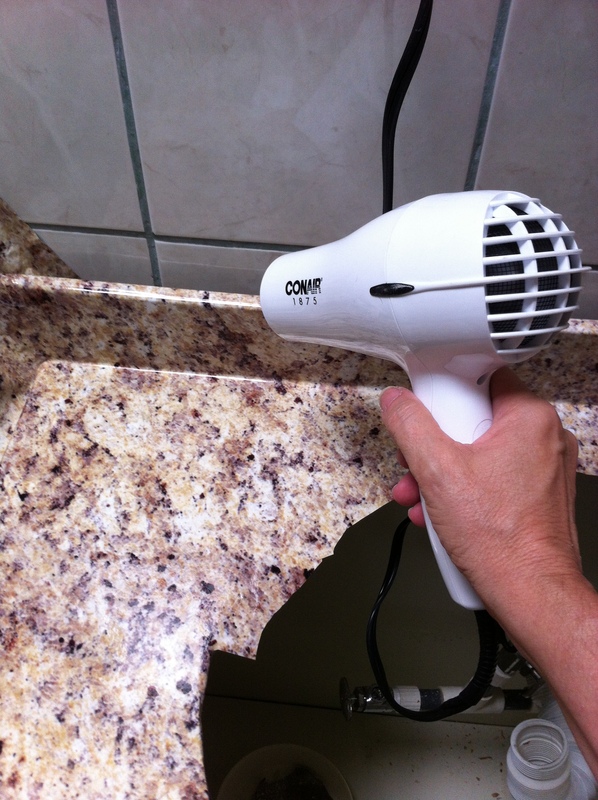 To get sharp tight fitting edges, you can heat the instant granite a little bit with the blow dryer. I was actually quite pleased with the result even though it’s not as simple as most of the Youtube videos make it out to be. I had problems getting the corners to look smooth and seamless but maybe that was just me. 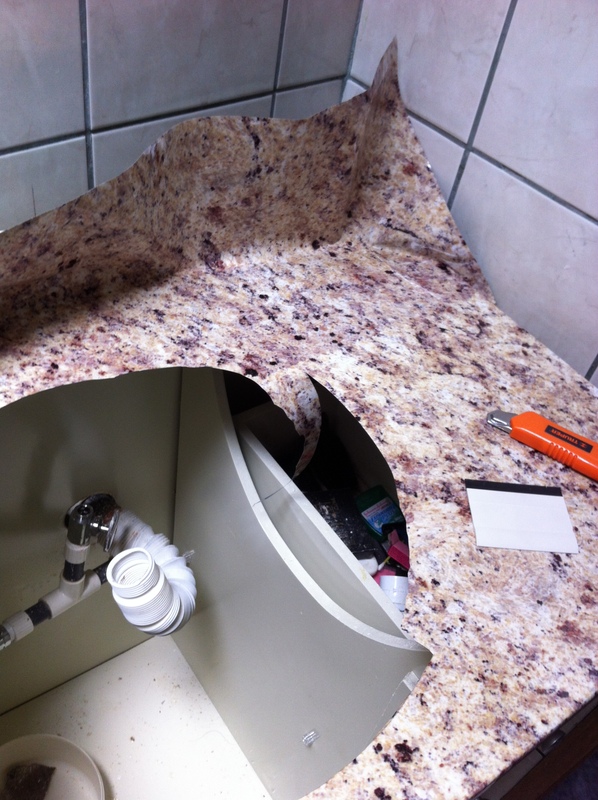 It took me about an hour to install it (I spent most of that time trying to get those pesky corners just right) As far as the claims that it looks like real granite, well I can tell you that my son and my daughter in law came over in the evening and used the guest bath and neither one of them noticed a thing. 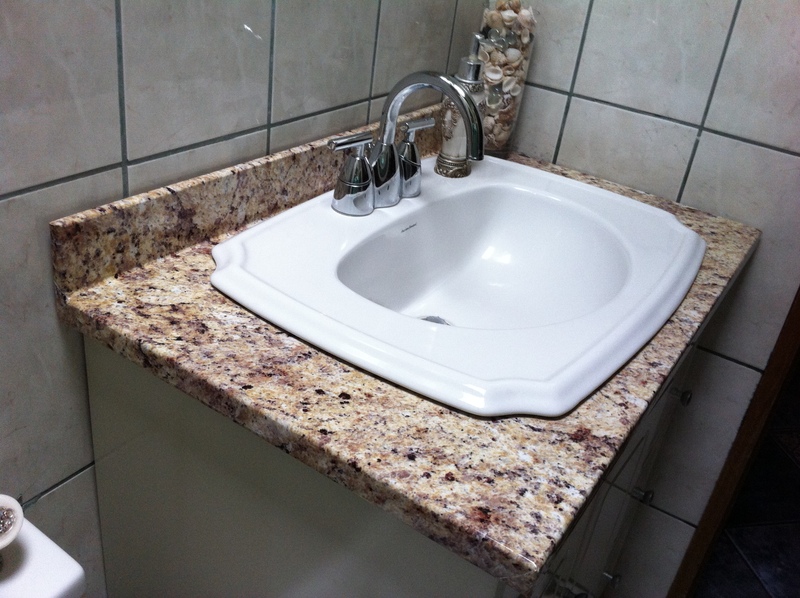 They just assumed it was granite. When I told them that it was vinyl, they were so shocked that they went back and ran their hands over it and examined it carefully because they didn’t believe me. 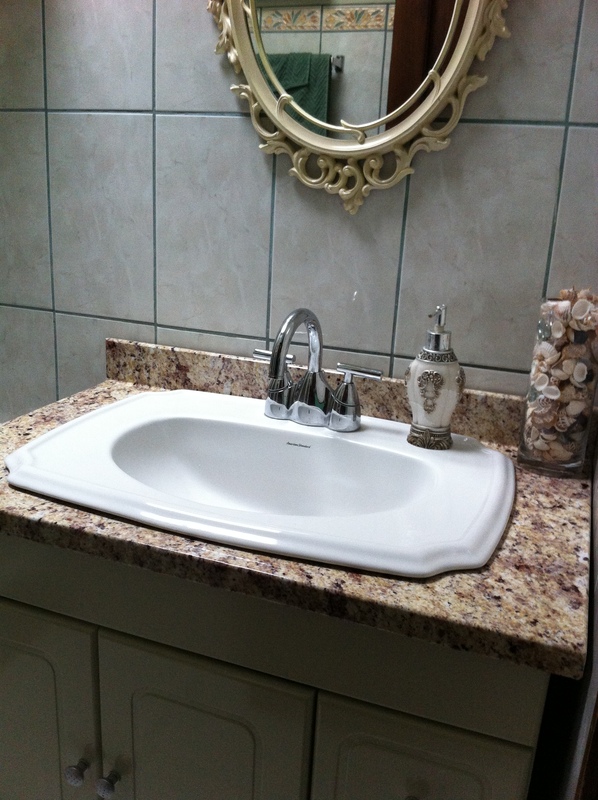 Now I will have to wait and see if it will hold up well to the everyday bathroom use, but so far so good. When I stopped teaching dance a couple of years ago, I converted the little dance studio behind our house into a guest bedroom. 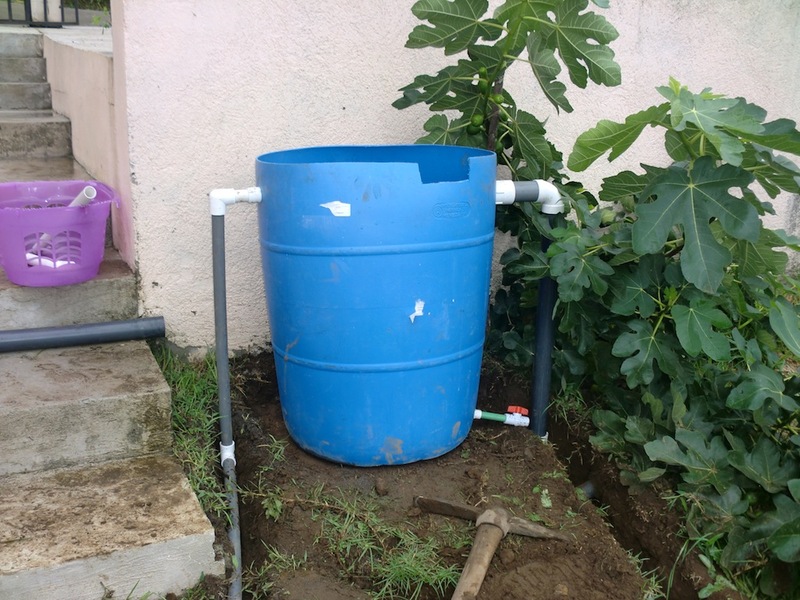 It came in pretty handy because we often have visitors who stay with us when they come down to Costa Rica on vacation. 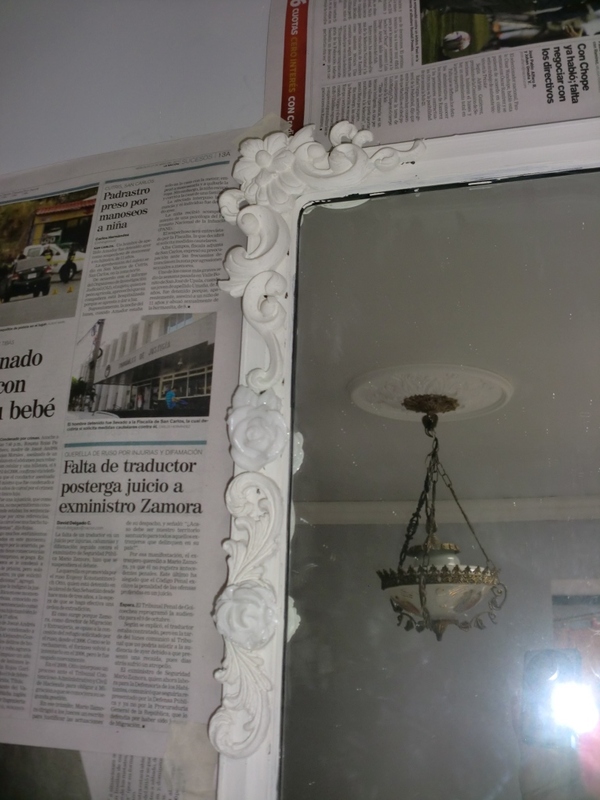 However, I didn’t really know what to do with all the mirrors that still hung on the studio walls. 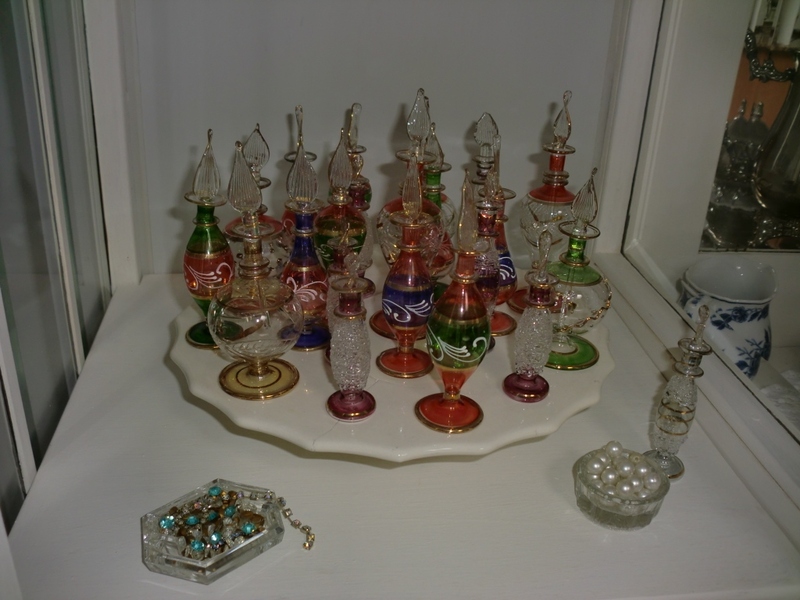 Although they had been a necessity in the dance studio, they now looked odd and out of place in a bedroom. They weren’t even pretty. 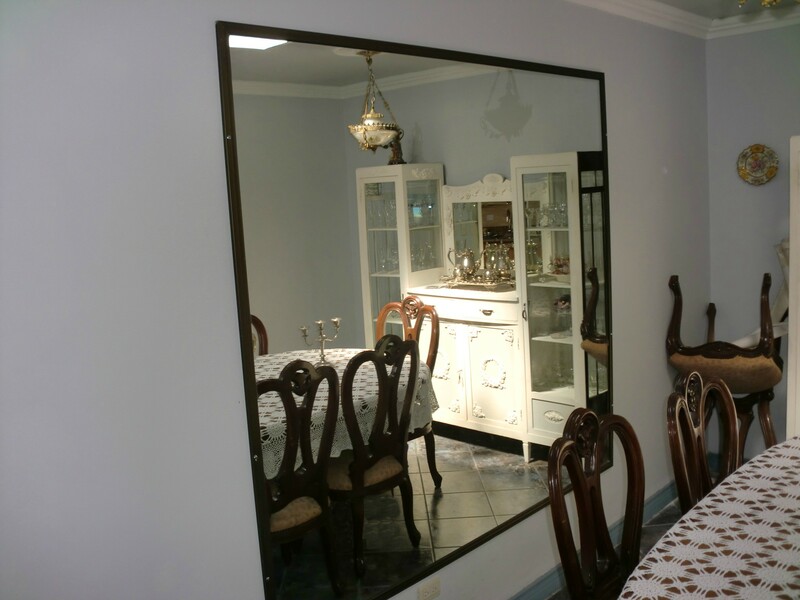 They were just plain ordinary aluminum framed mirrors quite large in size, the kind you might find in a gym. 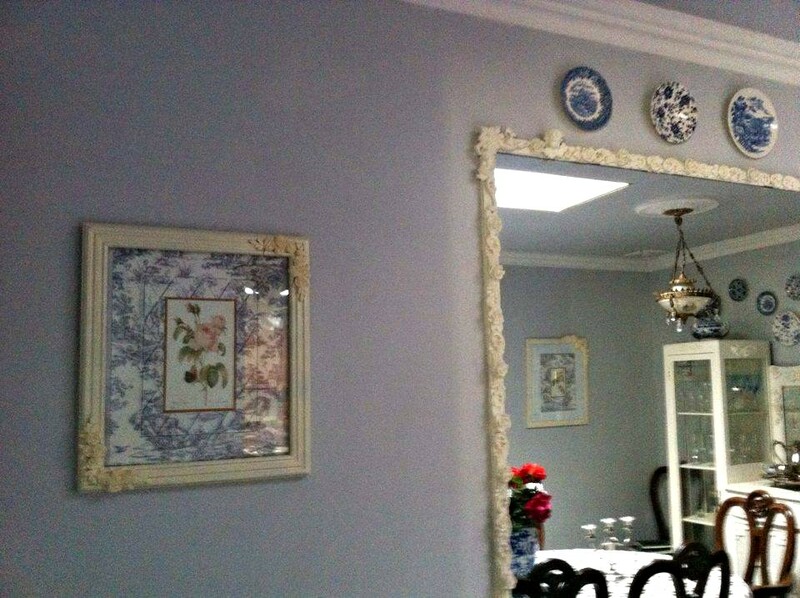 Last year, after we renovated our kitchen and dining room I ended up with a large empty wall that I couldn’t think of anything to put on. 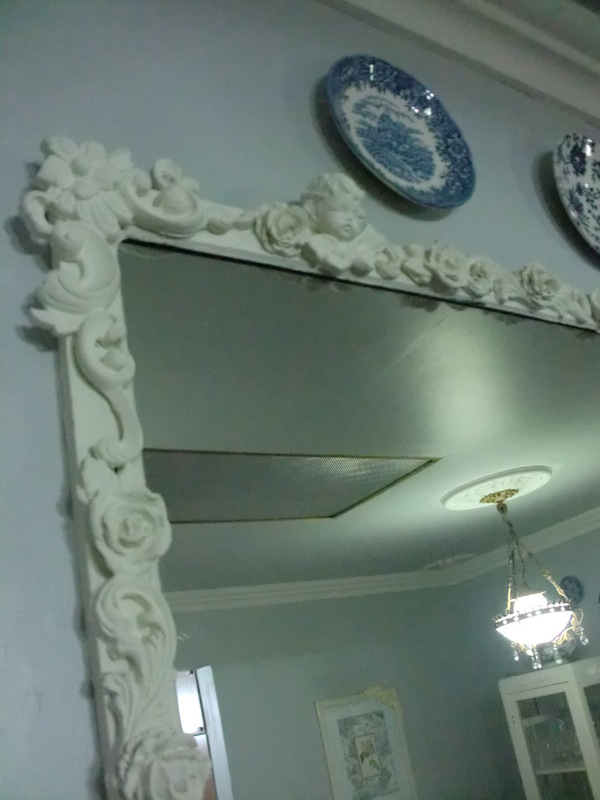 Then I remembered the aluminum mirrors that were still hanging in the guest bedroom and decided to bring one of them into the house and hang it on that bare wall. 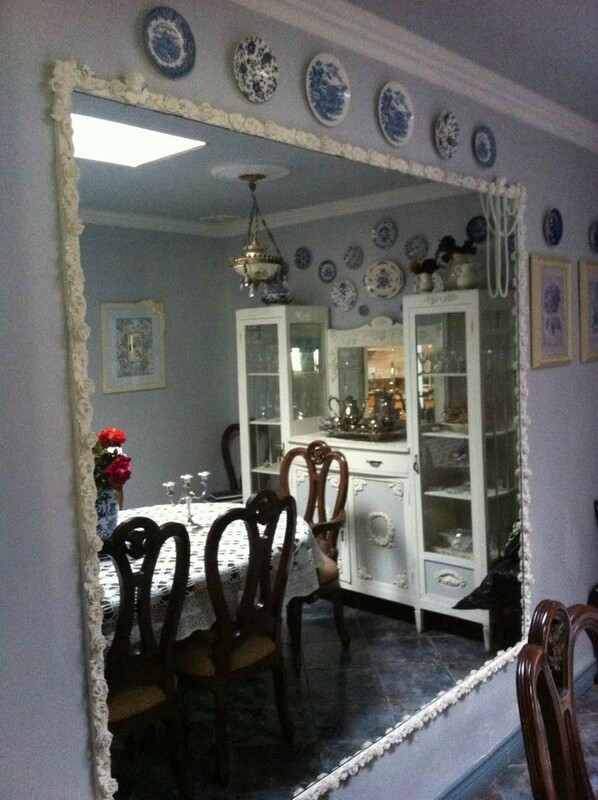 It was a good fit and it filled most of the space, but it looked just as unattractive there as it had looked in the guest room. 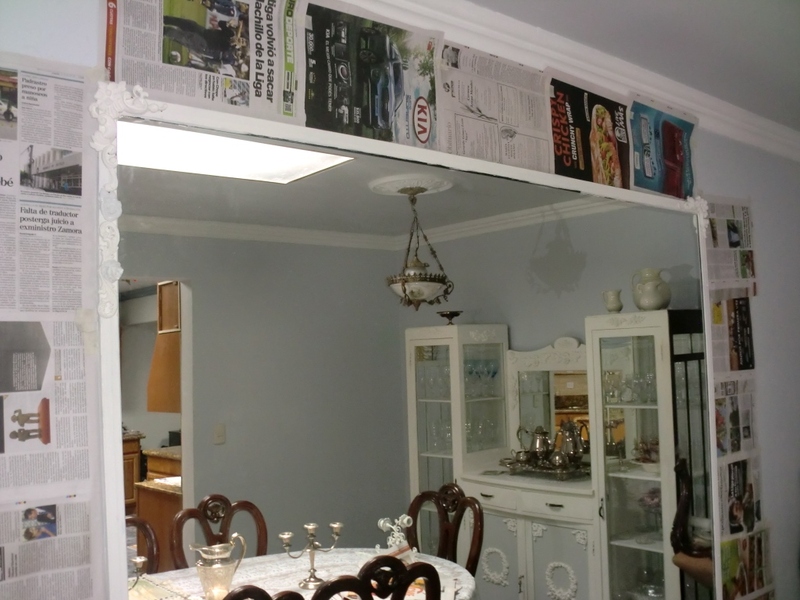 The frame was very narrow so there weren’t alot of options as far as updating it. 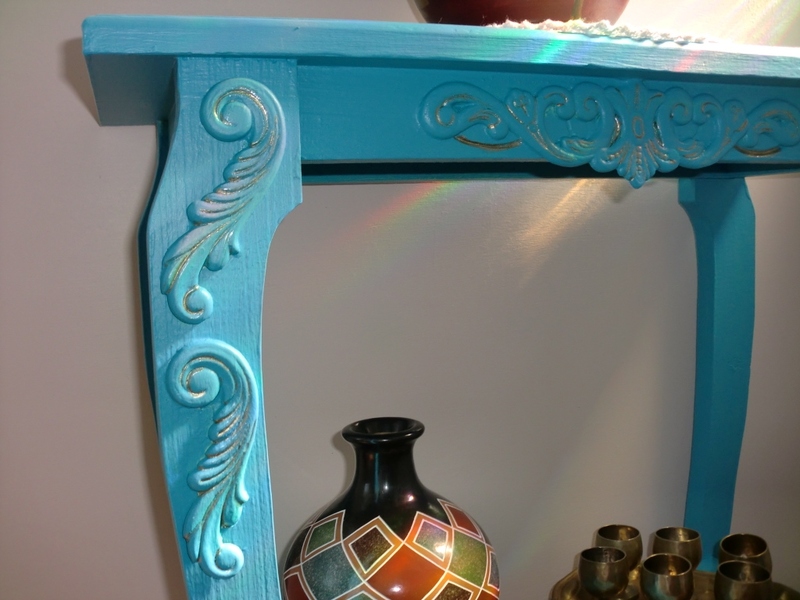 I wondered if perhaps it would be possible to glue some appliques on it and then paint the whole thing a different color to hide the aluminum. 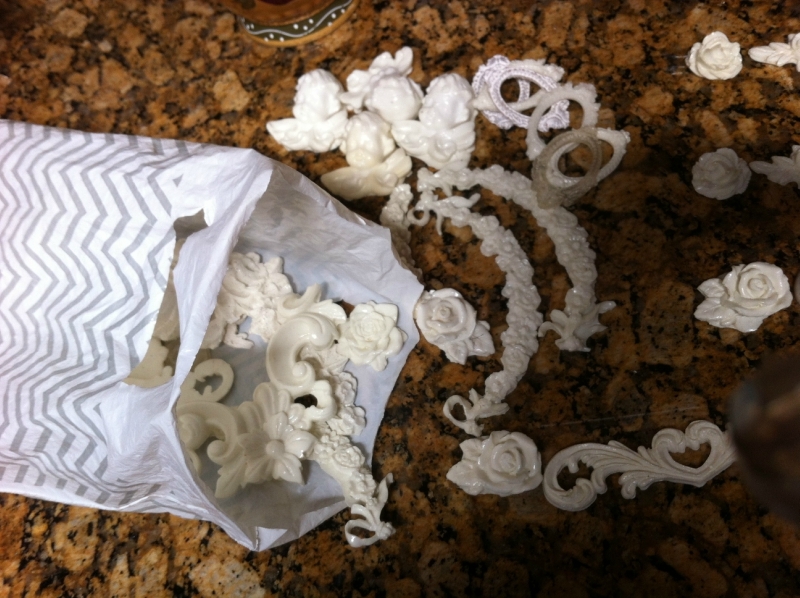 I had a few left over appliques from a previous furniture project as well as an assortment of silicone molds and a huge bottle of resin in the tool shed. So after a couple of months of thinking about it I figured it was worth a try and surely it wouldn’t look any worse. 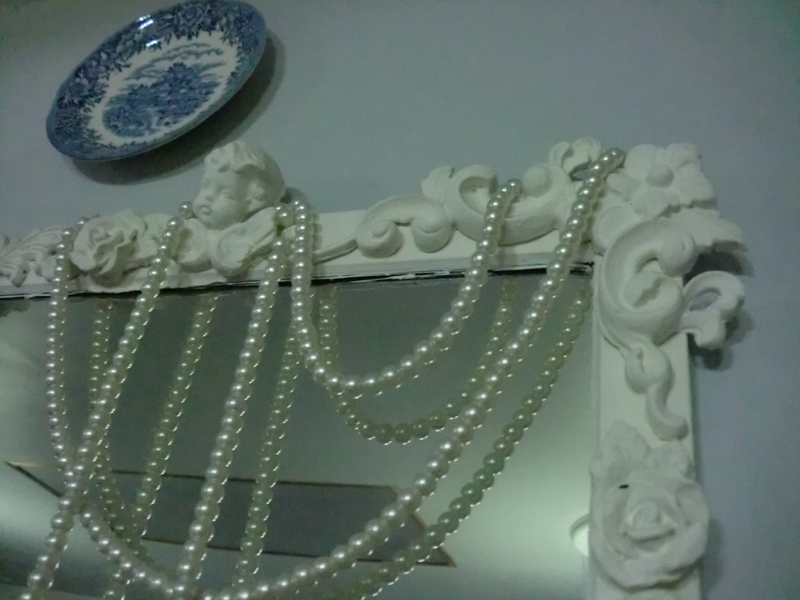 It took me several days to make enough appliques to cover the entire mirror. 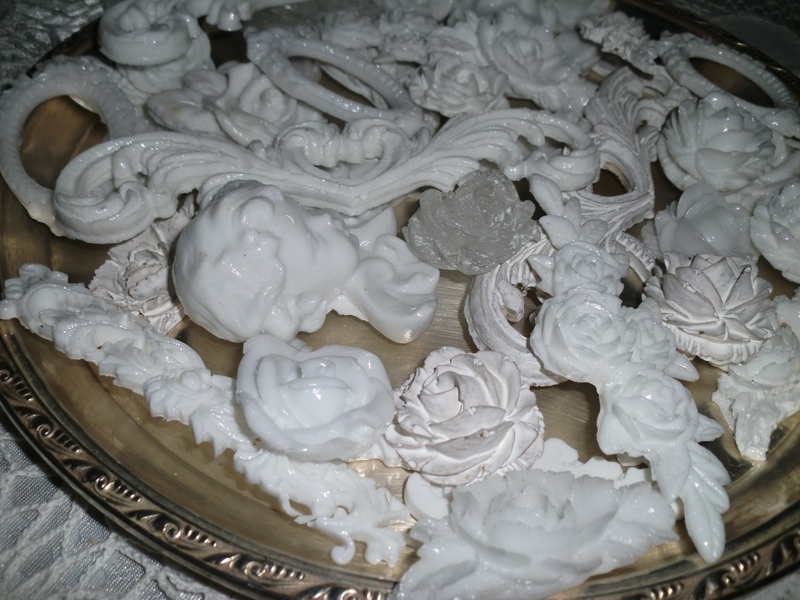 I made roses and curlicues and cherubs until I was bleary-eyed. 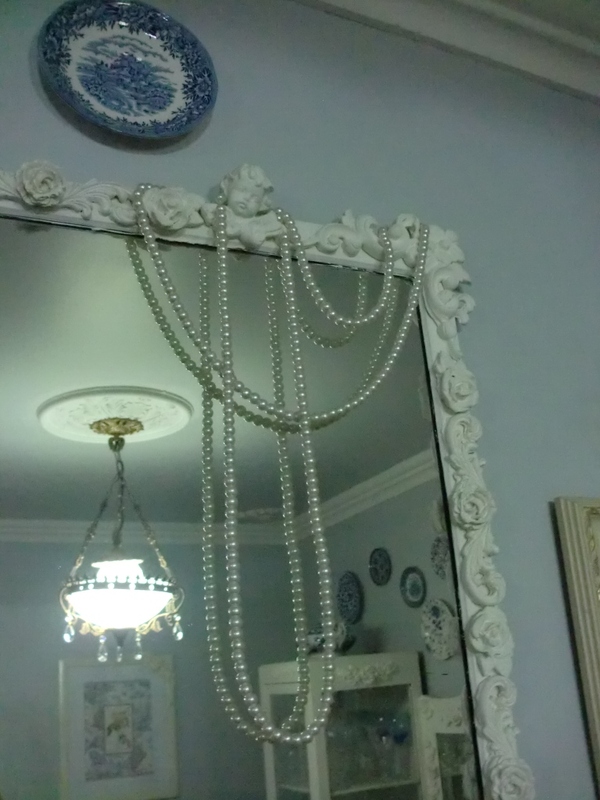 Then I began to glue them on with No more Nails, crossing my fingers that they wouldn’t fall off the slippery narrow frame. I think I used about four tubes of No more nails and thankfully they held fast. That stuff is good! 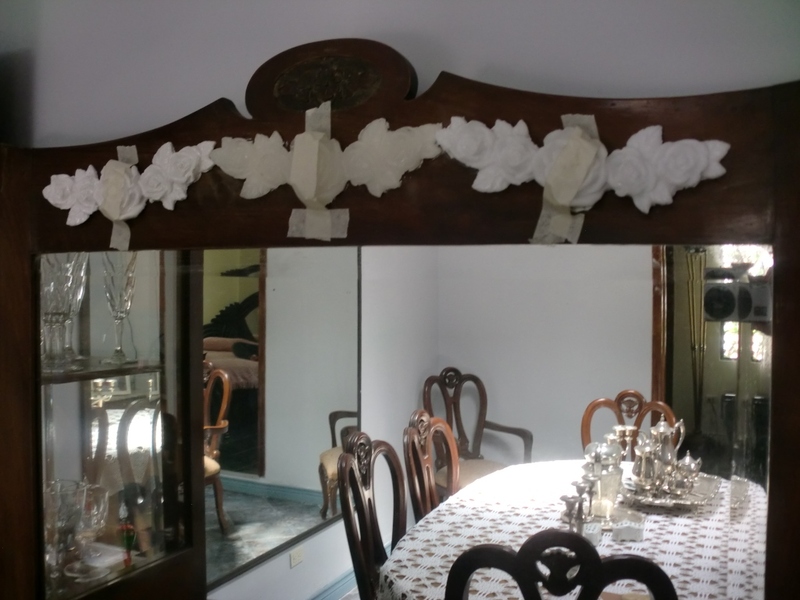 I had given the frame a couple of coats of white paint before putting on the appliques because I knew that it would be very difficult, if not impossible to get into all the nooks and crannies with the paintbrush after the appliques were glued on. 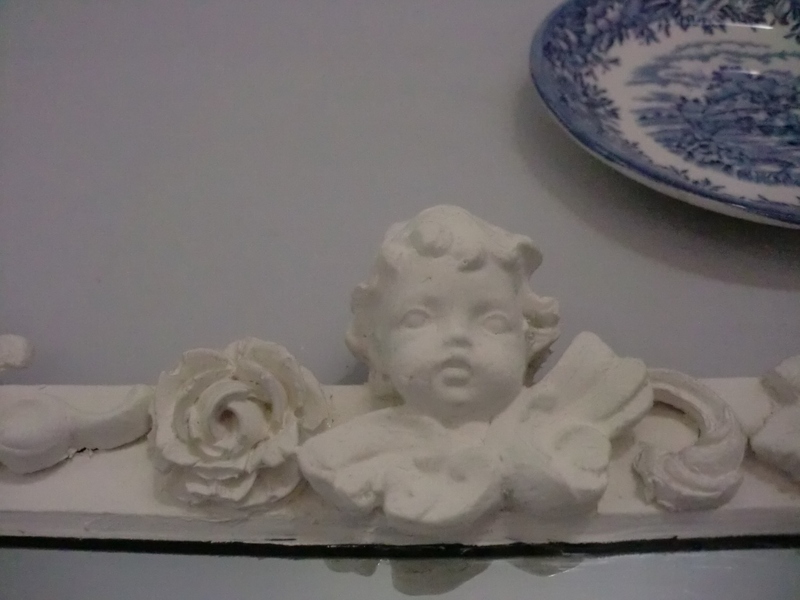 Two sweet little cherubs quietly watch over the dining room from the top of the mirror. I placed one on either end. 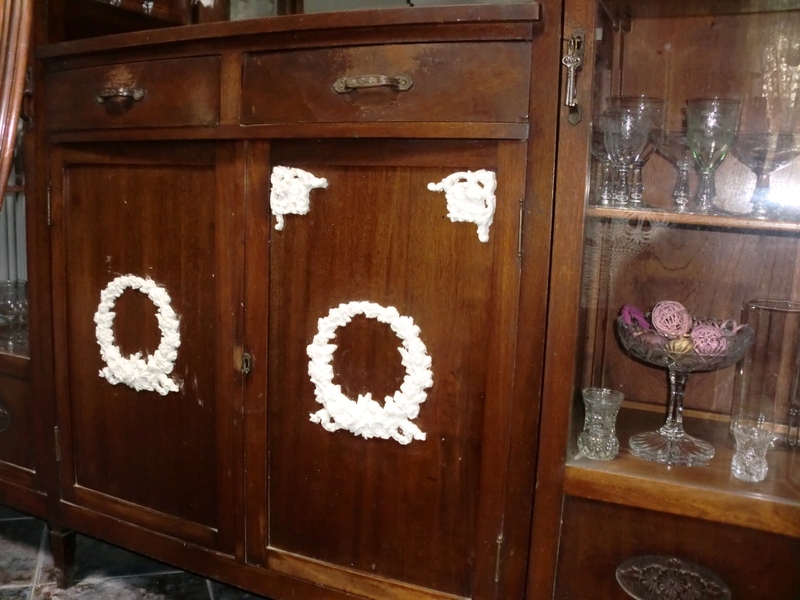 After the appliques were set in place I allowed them to dry completely for a couple of days before applying a final coat of white paint. 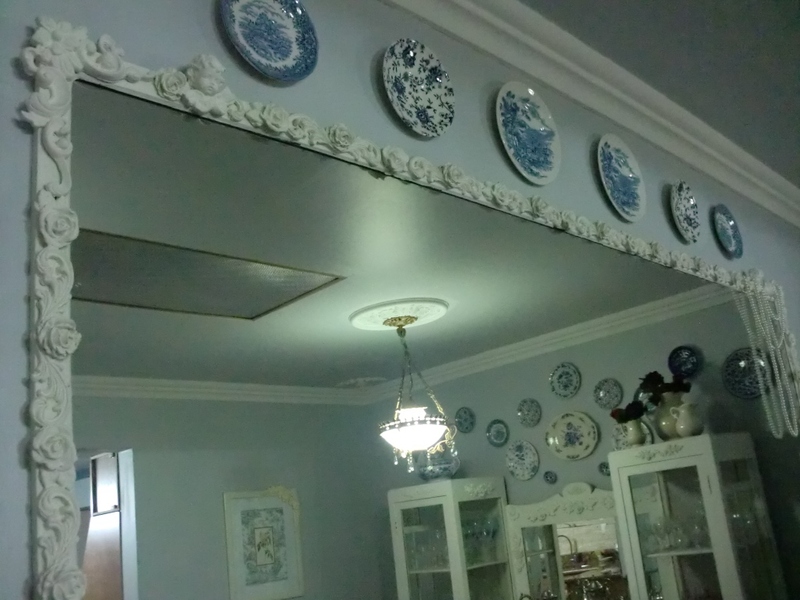 In the empty space between the top of the mirror and the molding I hung a few blue and white plates that I had stored away which matched the blue and white plate collection on the other wall. 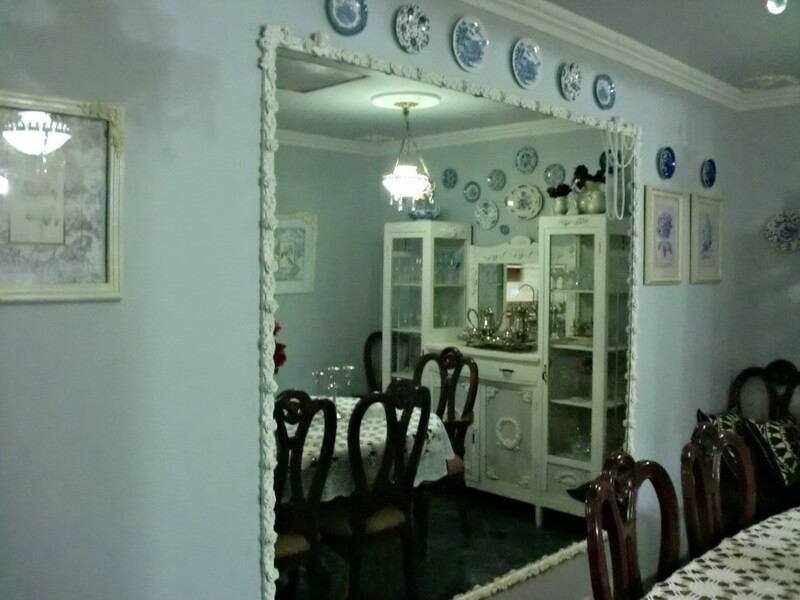 It’s a very tiny dining room, it actually used to be my daughter’s bedroom right off the kitchen. That was a sort of weird Costa Rican floorplan. Or lack of floorplan, I should say. The previous owners of the house had added on rooms wherever they had fancied a new room without giving any thought to the logic of the layout. So there was this fourth bedroom that could only be accessed through the kitchen. How weird is that. 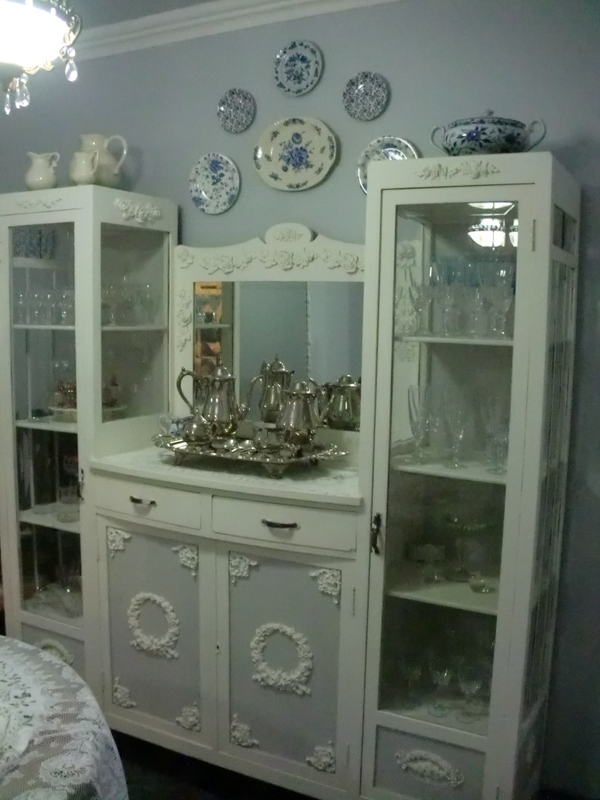 When my oldest daughter moved out last year, my youngest daughter moved into her bedroom and I turned her “kitchen bedroom” into a little secondary dining room, which made so much more sense. 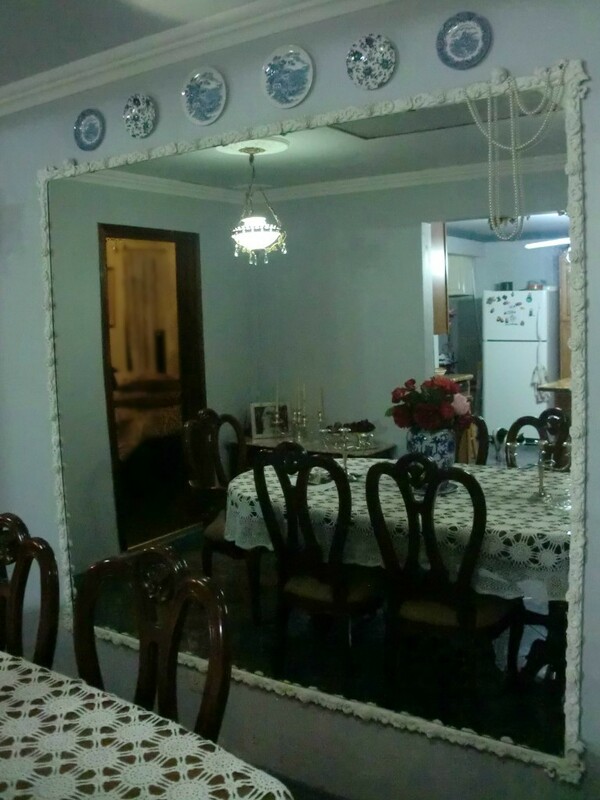 I think the mirror helps make the dining room look a little larger than it really is. 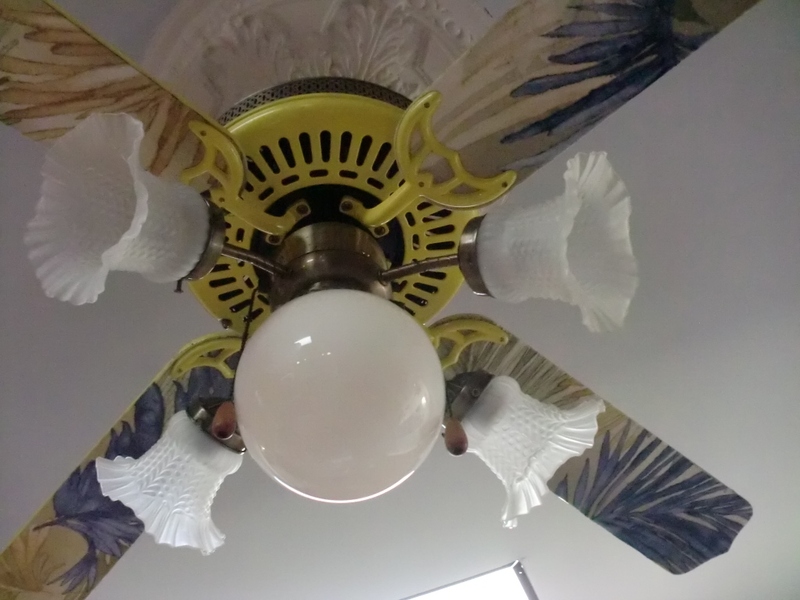 In the 1980’s when we lived in Ecuador I bought two ceiling fans for a house that we were building at the time. 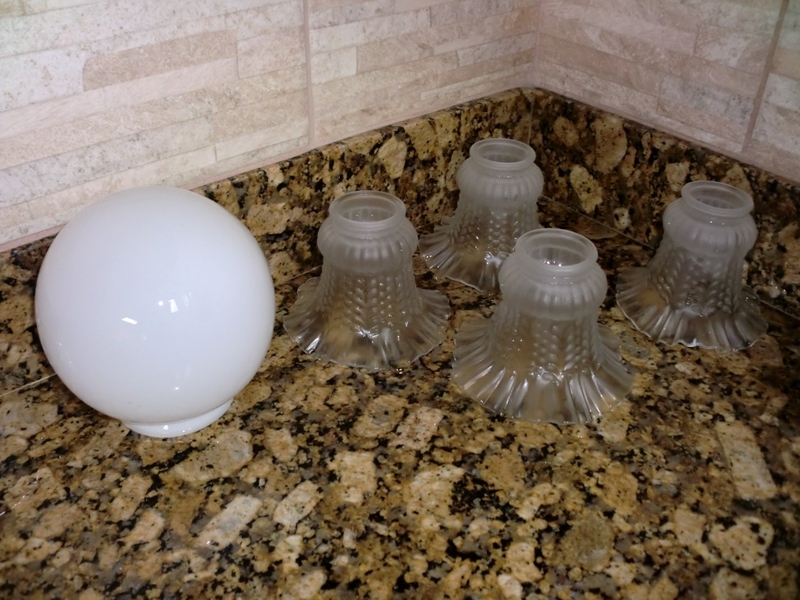 They were considered fashionable in those days and I was happy to have fixtures that were not only stylish but also functional. The temperature often got quite high in the tropical port city of Guayaquil and they provided much needed relief from the stifling heat . Fast forward 28 years. I’m sad to admit that now my little fans are considered tacky, dated and downright ugly. 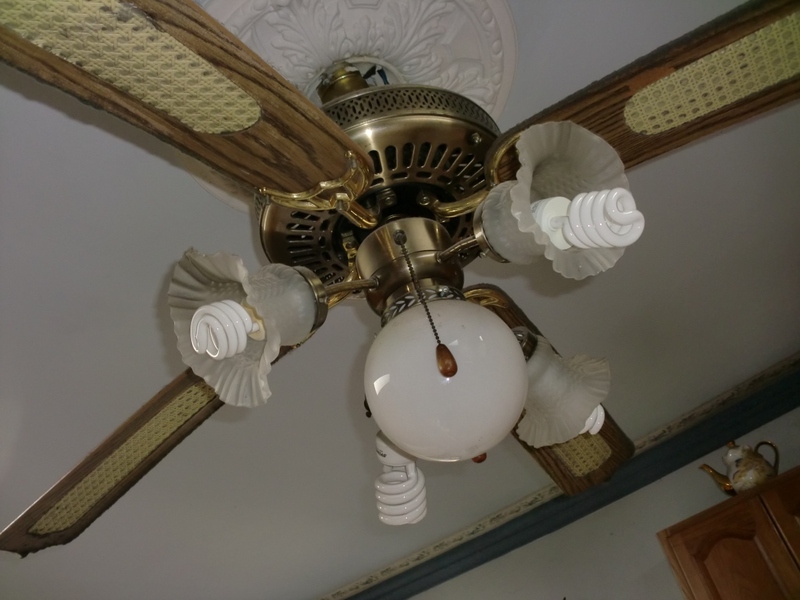 One of them stopped working long ago and only the lights portion was still functioning, but the other fan still works perfectly. That’s pretty amazing after 28 years. 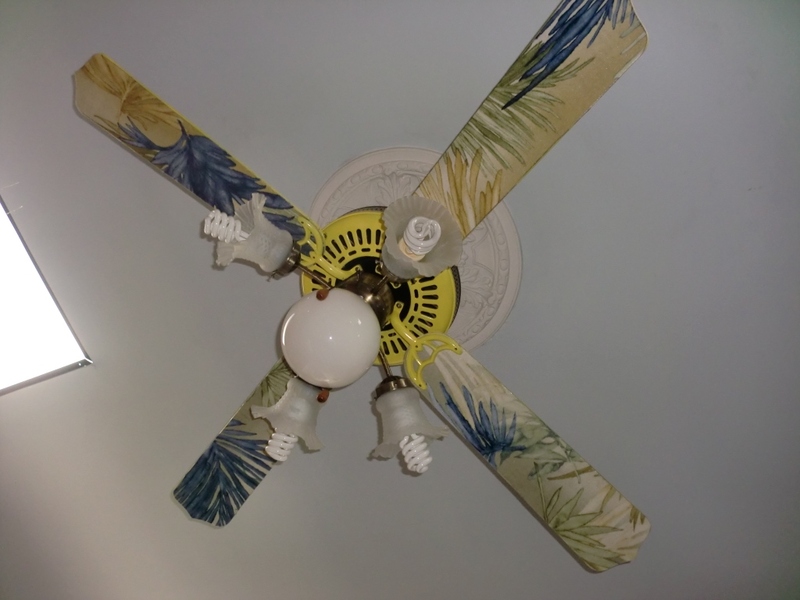 I actually like ceiling fans and I was reluctant to throw away the one that still worked. 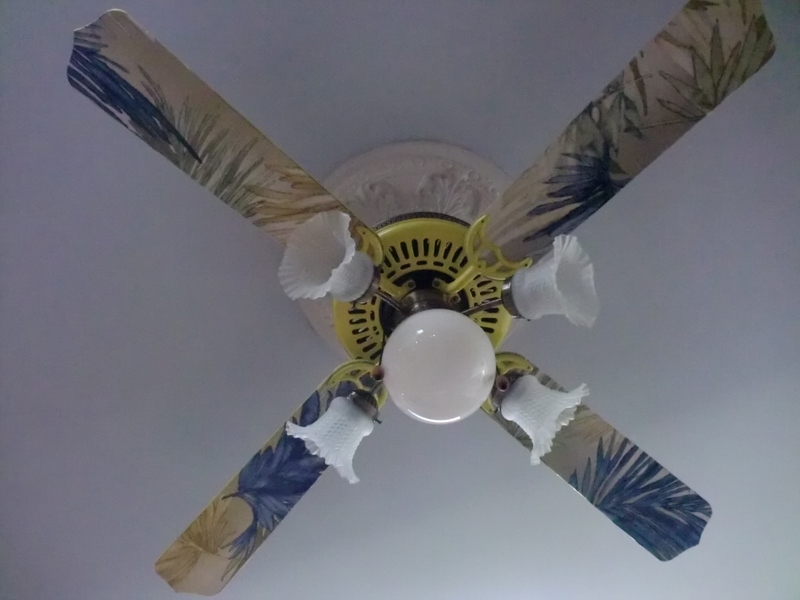 We don’t live in such a hot country anymore but it can sometimes get into the 80 to 85 degree range so I still use the fan quite often. 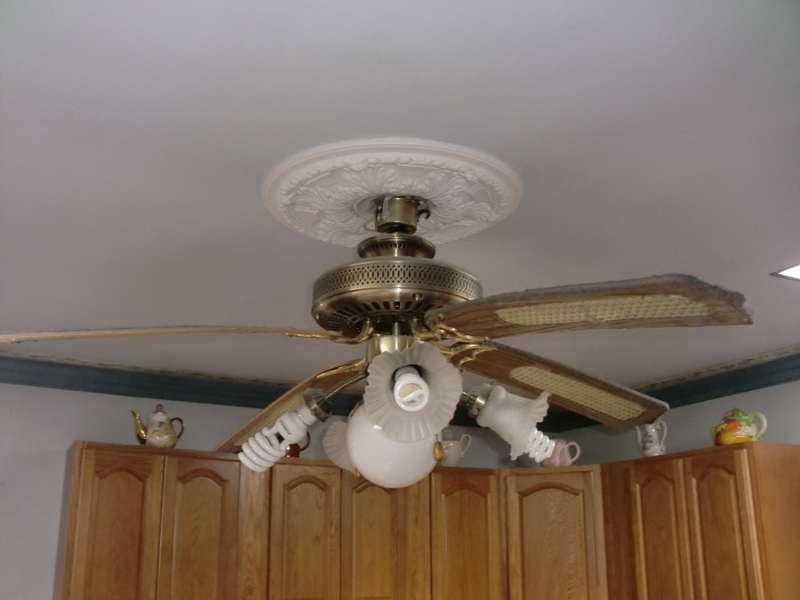 I have it installed in the kitchen. The only problem is that it just looked outdated and boring. I decided to at least try and give it a facelift. 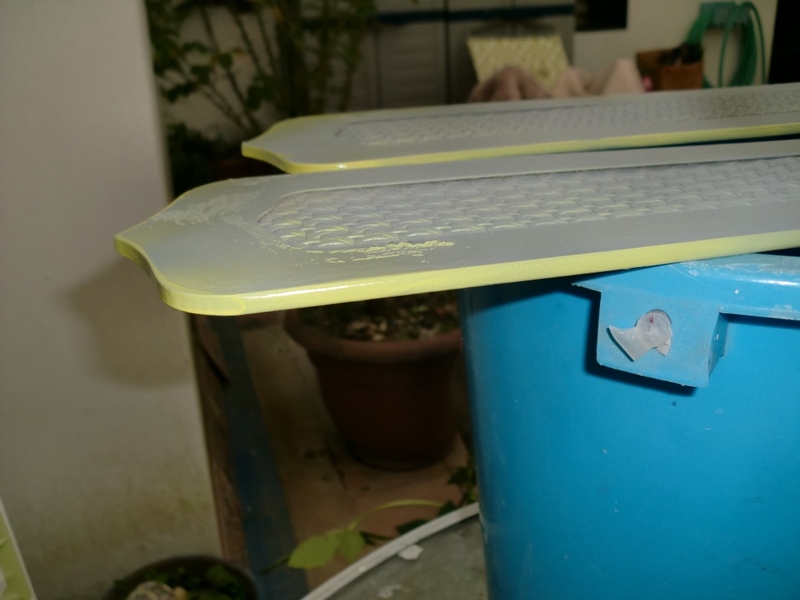 What I had initially planned on doing was to simply paint the blades a bright color. I unscrewed the 8 little screws that held them in place and took them down. 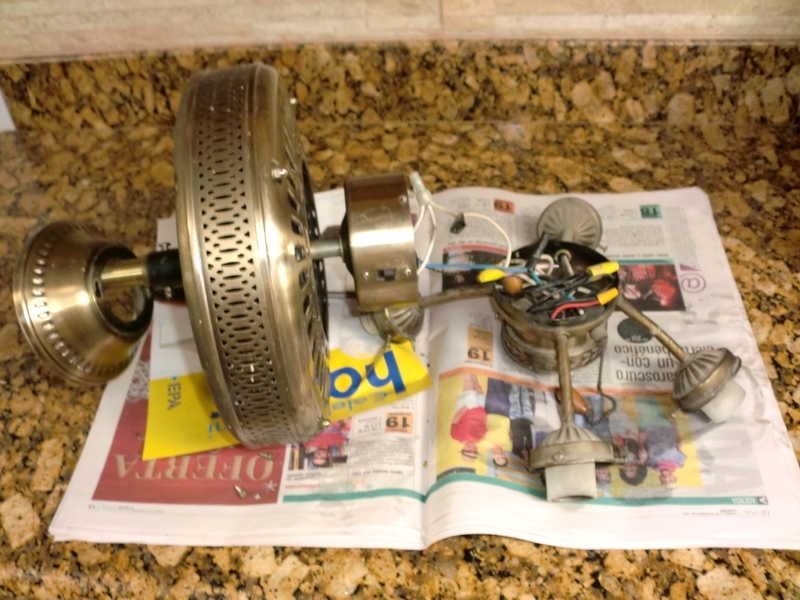 After cleaning them up (isn’t it amazing how grimy kitchen fixtures can get?) 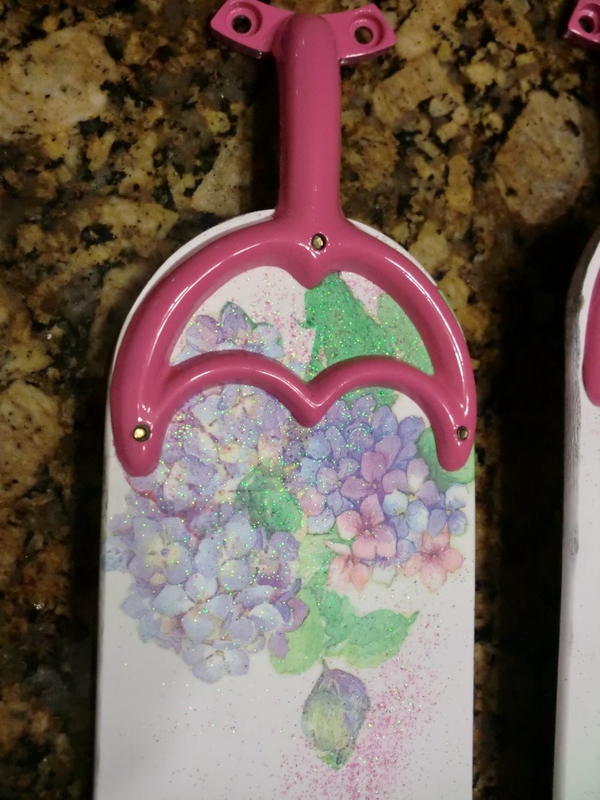 I remembered the bottle of Mod Podge that was lurking in my crafts box and I figured I could decoupage something on the blades rather than just painting them. 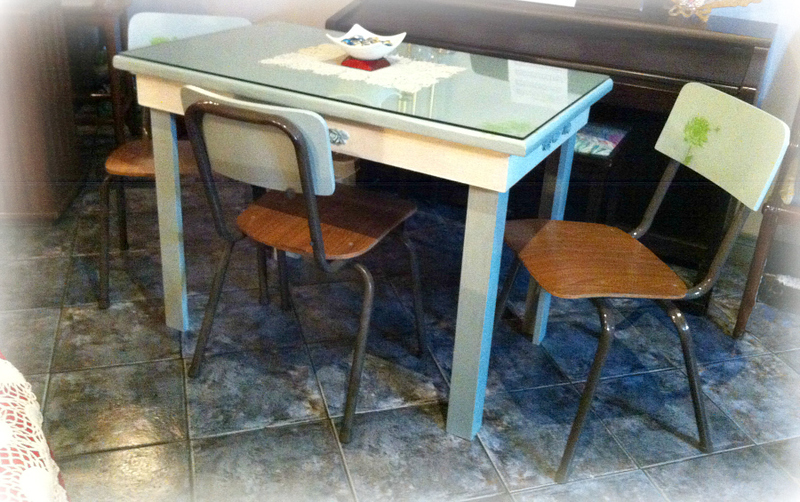 I ended up using some left over fabric from the dining room chairs. 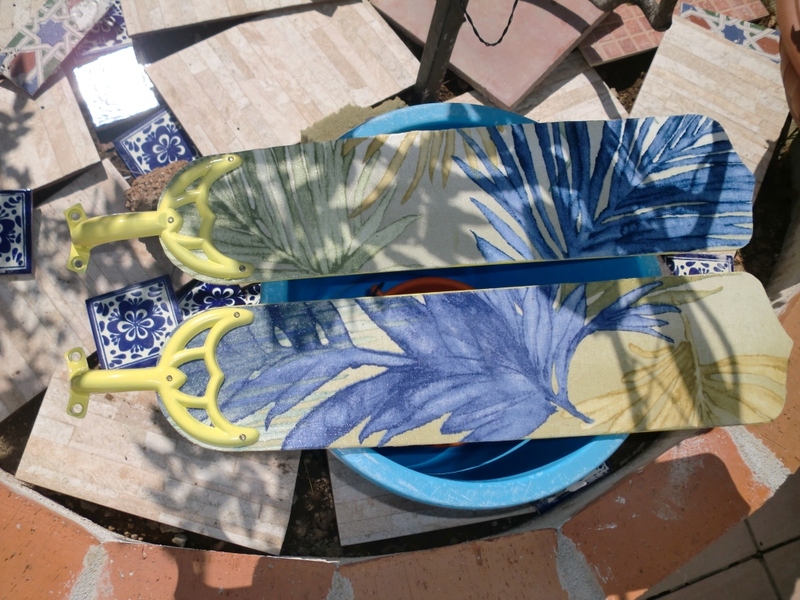 After spraying on a primer, I spray painted the edges yellow because I didn’t want to extend the decoupage fabric up over the edges of the blades. In order to get a smooth finish I turned the blades over and glued the fabric to the non-wicker side. 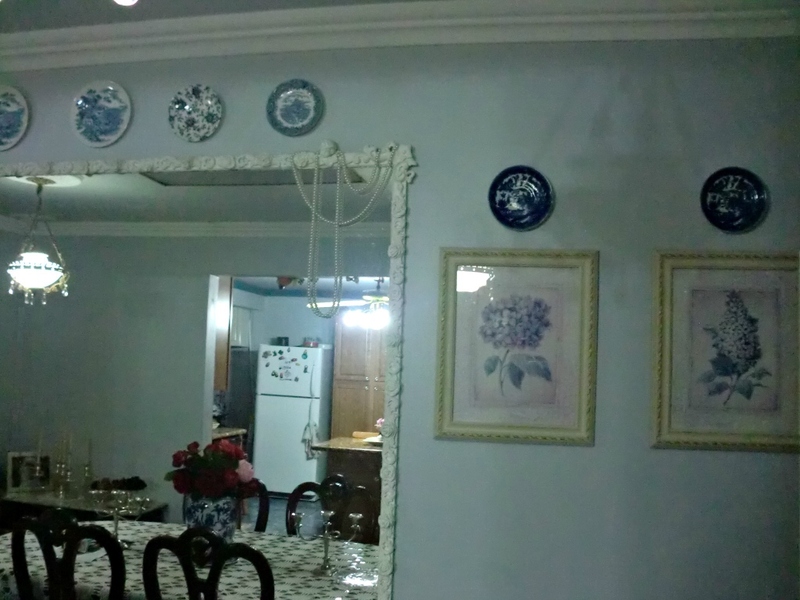 Now the woven wicker part faces the ceiling and is not visible. 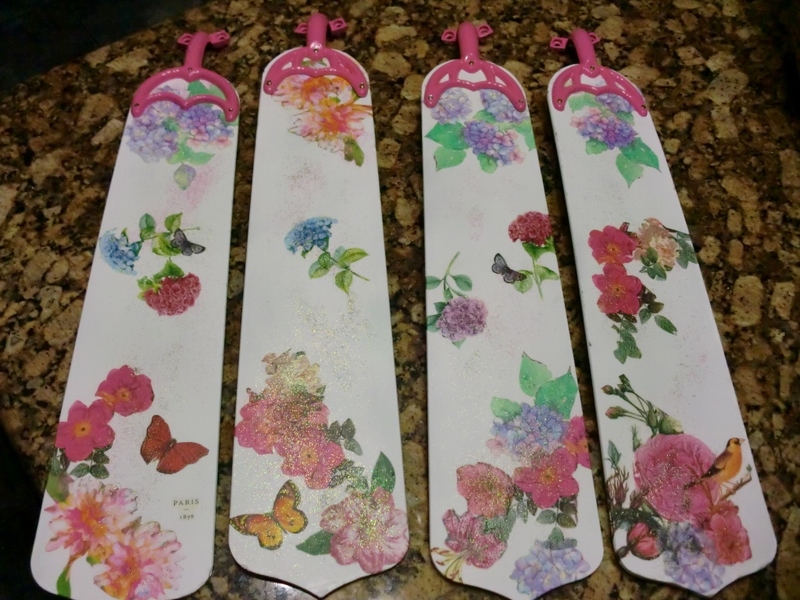 I used Mod Podge as glue to decoupage the fabric onto the blades, adding a couple of generous coats of it on top of the fabric too. 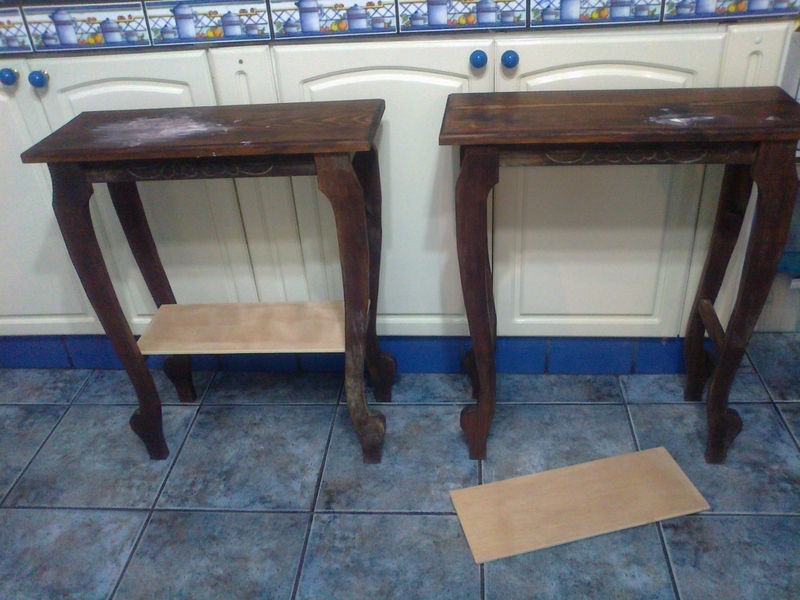 After the blades were dry, I sprayed on two coats of clear varnish. 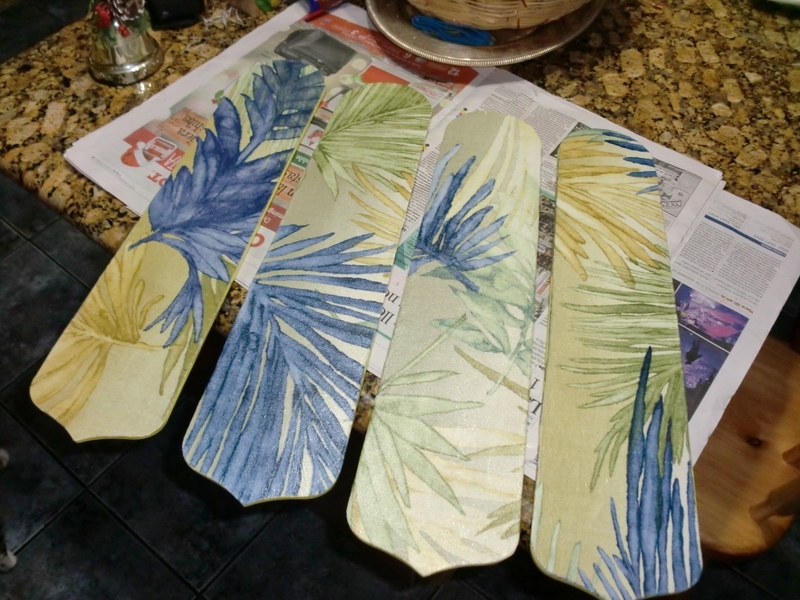 The blades ended up looking like they were actually hand painted and they even fooled hubby who complimented me on my artistic skills. If he only knew that I can’t paint anything more advanced than a stick figure, hehe. 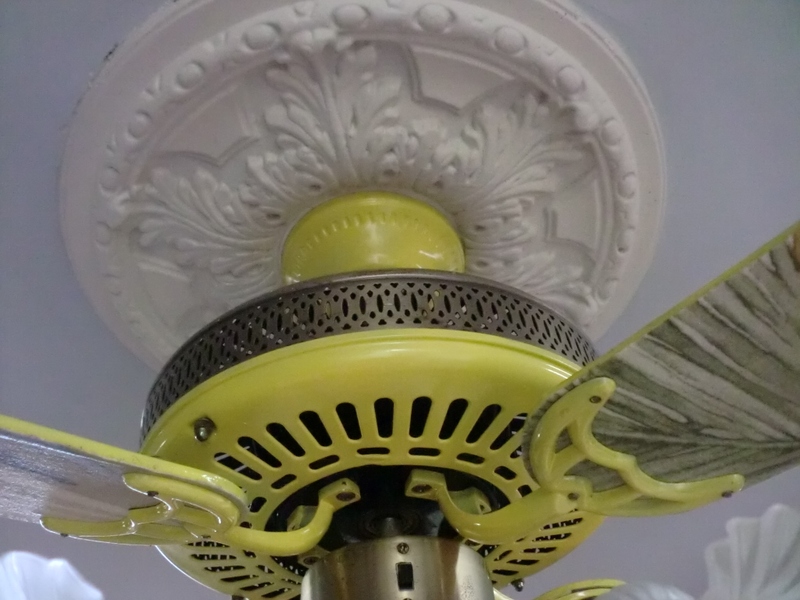 After checking out a couple of blogs and a few websites I realized that it was also possible to spray paint the metal face plates on ceiling fans. Alot of people had done it and it looked really cool. 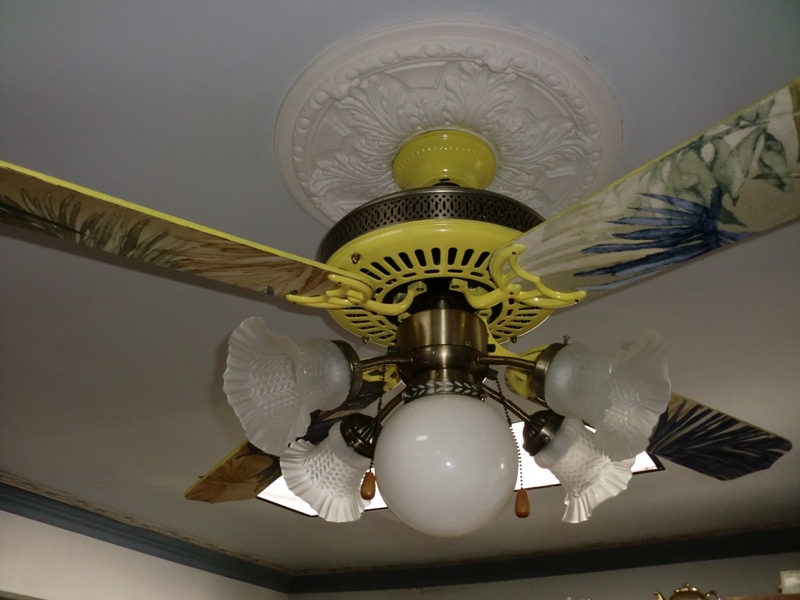 I wanted to camouflage the outdated brass tone on the body of the fan and paint was the perfect solution. There were only four screws holding it in place and it was simple enough to remove them and slide the face plate off. Easy peasy…right? Wrong. 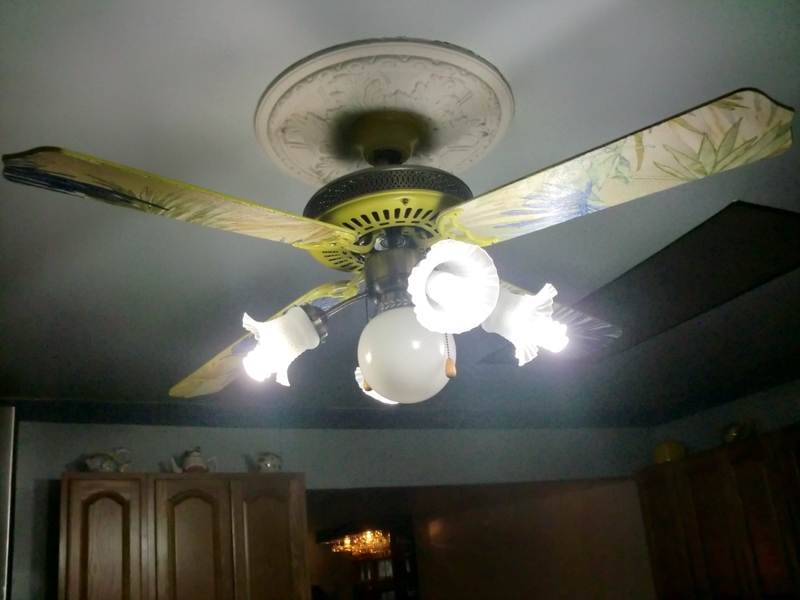 I didn’t realize at the time that all those online instructions for removing the face plate were meant for fans without lights. It wasn’t until I excitedly began taking out the screws that I realized that the middle hole of the plate would never slide down past the four tulip lights. I hate it when I do dumb things like that. 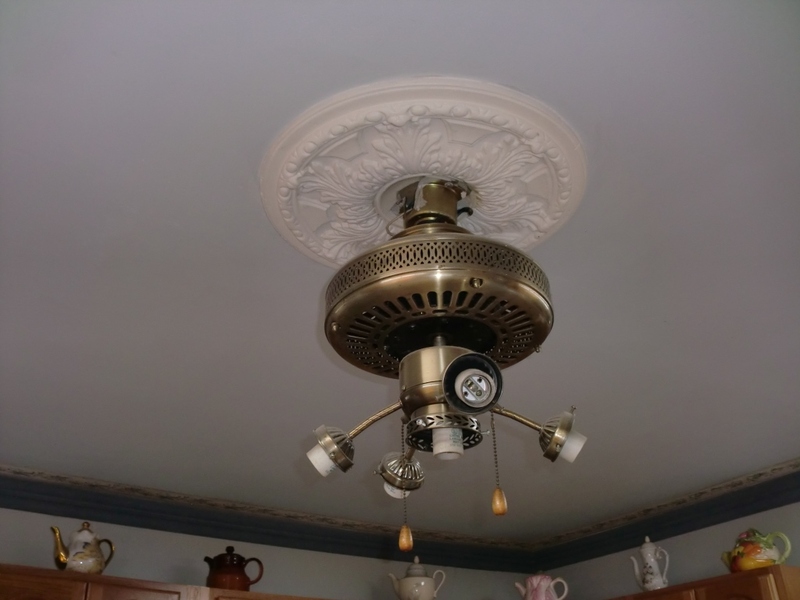 I ended up having to convince hubby to help me take the whole fan down off the ceiling and temporarily unwiring and separating the center portion in order to get the plate off. What a hassle. Thankfully he is very handy with these things. See that center opening? How in the world did I ever think that it was going to slide down past the four tulip lights that jut out to the sides? 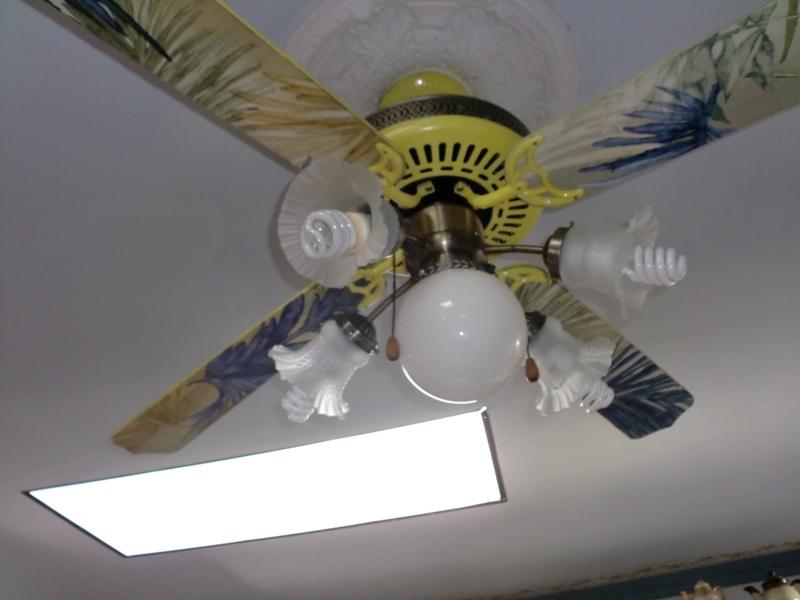 I had to separate the lights portion from the rest of the fan in order to get the face plate to come off. That meant separating two of the wires. 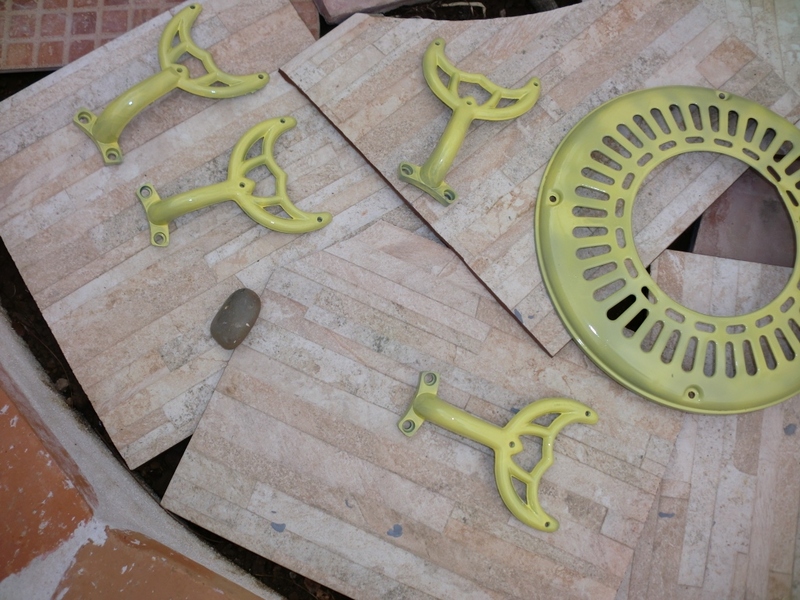 Here’s the faceplate and the hardware from the blades after their first coat of yellow paint. I also harvested some of the parts from the non working fan including the four blades and their hardware which I spray painted pink. 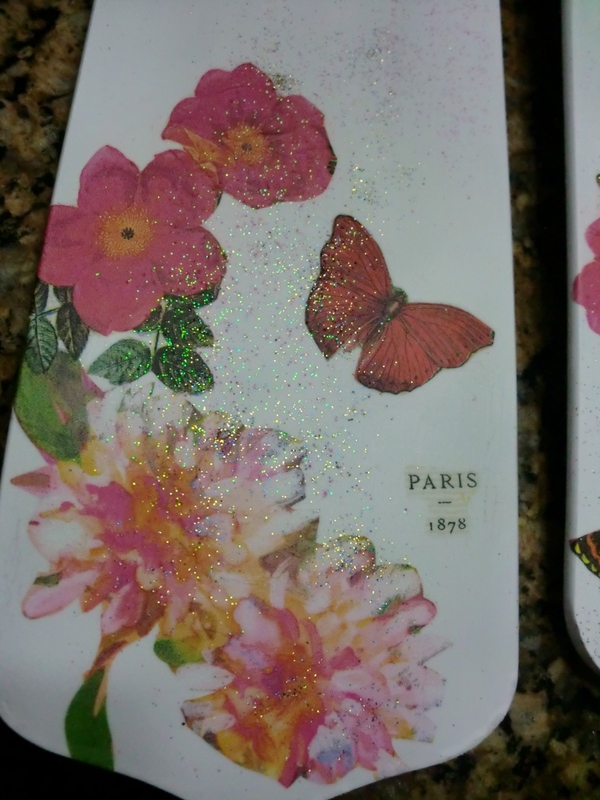 I decoupaged these in a different style and I can just change the blades whenever I want a whole different look. It’s just a matter of removing the screws and it doesn’t take more than 5 or 10 minutes. Admittedly pink doesn’t really go with anything in my kitchen but who cares? Who says fans have to match! 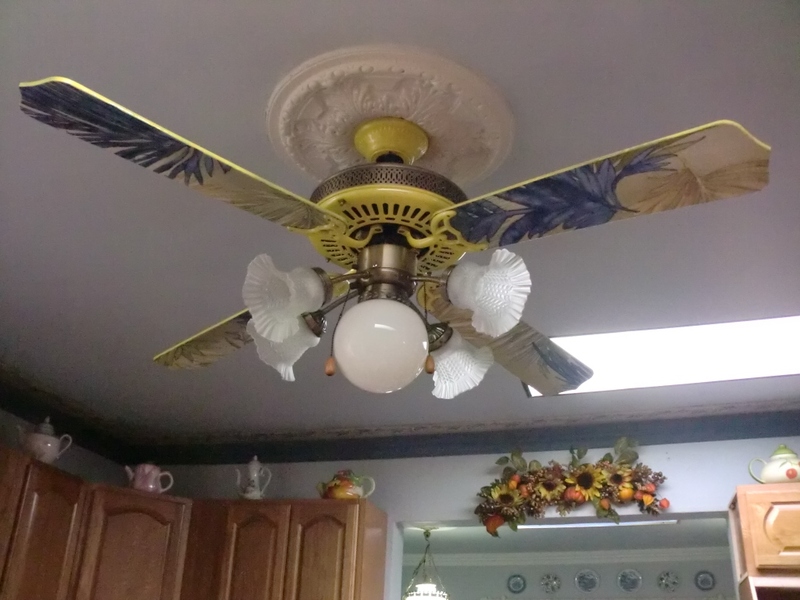 Four extra fan blades for a different look. These got a top coat of clear matte varnish. I didn’t want them as shiny as the other ones. 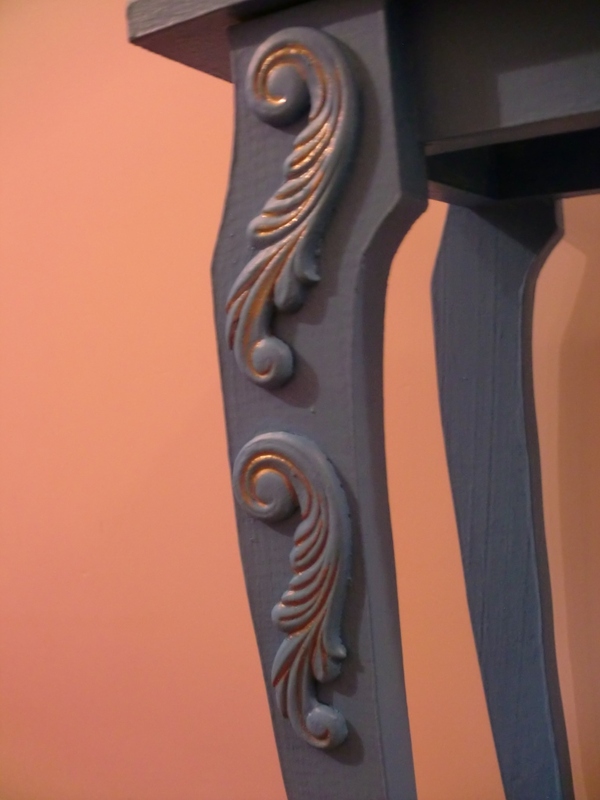 Fast forward to last month when I finally got around to painting an old bedroom set that used to be in my daughter’s room. That set has now replaced all the unmatched pieces that were in my bedroom at the mountain house including these two little tables. For some strange reason, I had become oddly fond of them after all this time and I didn’t want to throw them out or give them away so decided to find a new location for them. One table was placed on the stair landing and the other went in the downstairs hallway. But yellow just wasn’t cutting it anymore…they seemed a bit too pale for their new location. 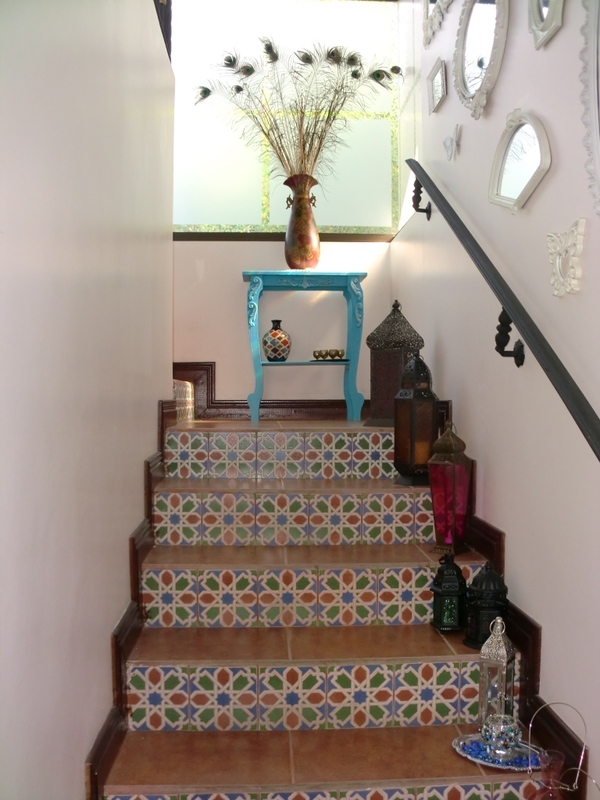 They didn’t really blend well with the Moroccan pattern of the stair risers. 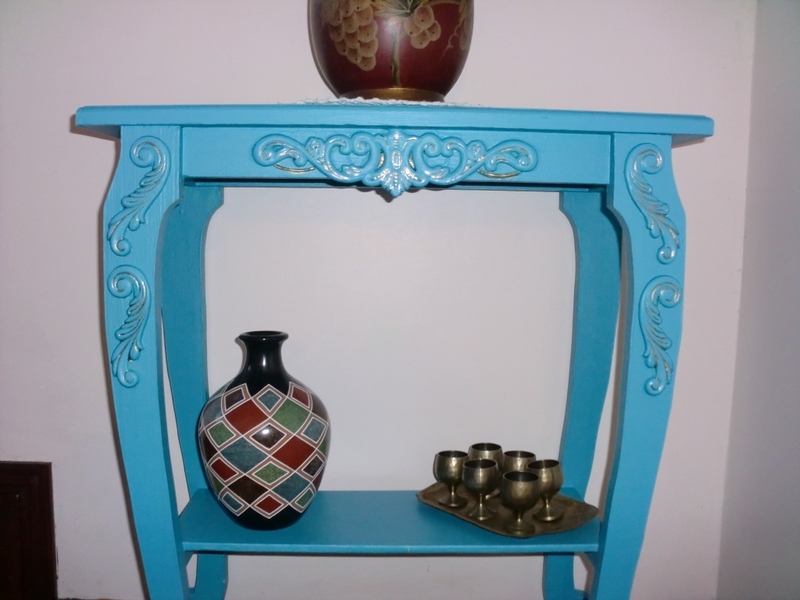 Now, I usually don’t like furniture in loud colors but on an impulse I went out and purchased a can of teal paint. And then crossed my fingers that I wouldn’t be sorry afterwards. 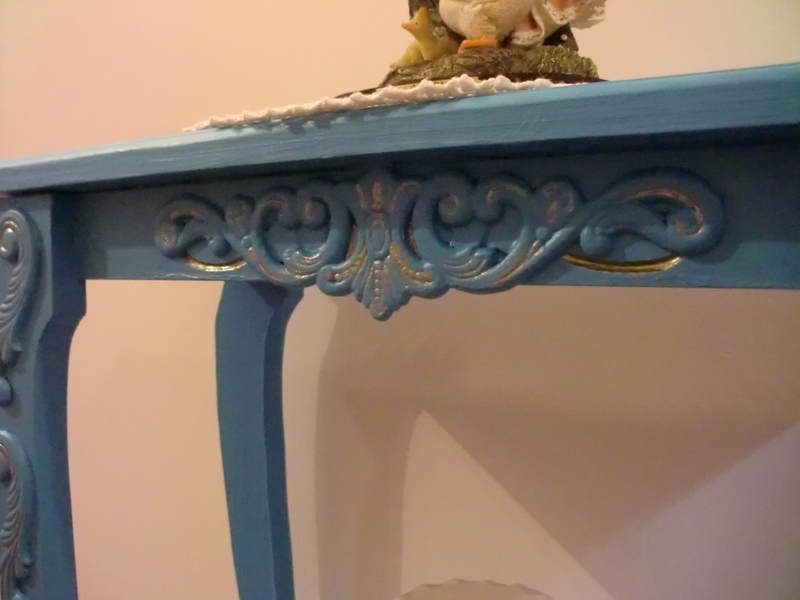 The only drawback to the teal paint was that the appliques seemed to become nearly invisible so I highlighted the deeper lines with gold paint to make them stand out a bit. 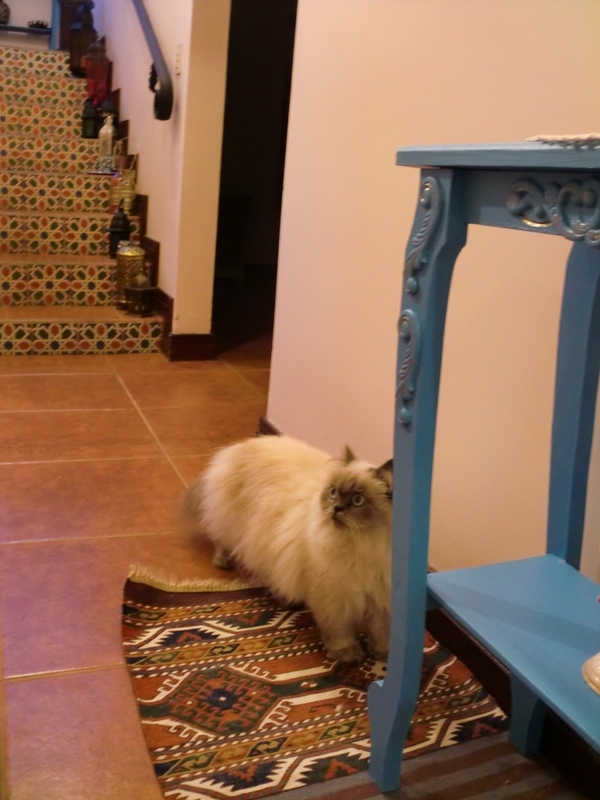 After a thorough inspection of the tables and their new color, Semsema has given them both her seal of approval. Religious art has always interested me. Not that we had much of it at home growing up. My mom thought it was tacky. 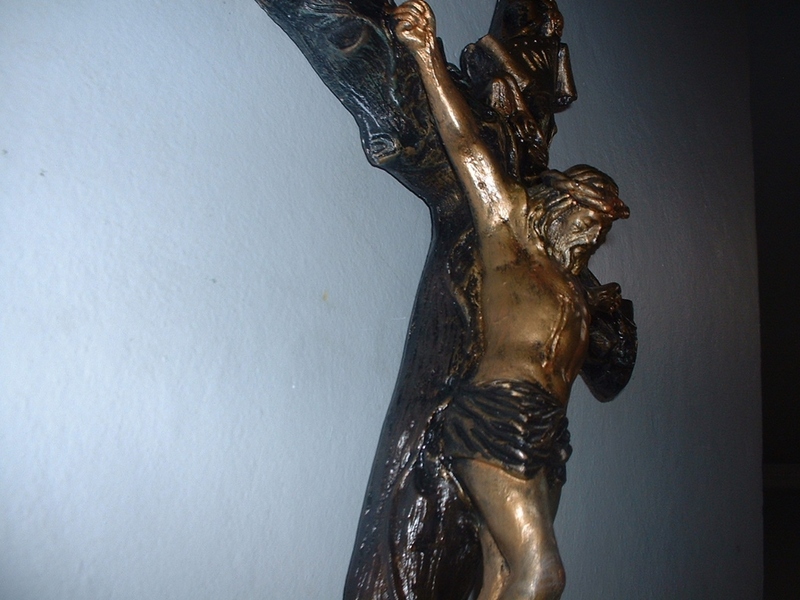 Aside from the mandatory crucifix above each bed and a large gilded Last Supper portrait that was a permanent fixture in my grandmother’s dining room, I can’t say that we really had much in the way of religious art. But I always loved the look of old Spanish and Mexican Colonial religious articles, particularly the large and ornate silver ex-votos and the beautifully carved wooden santos. 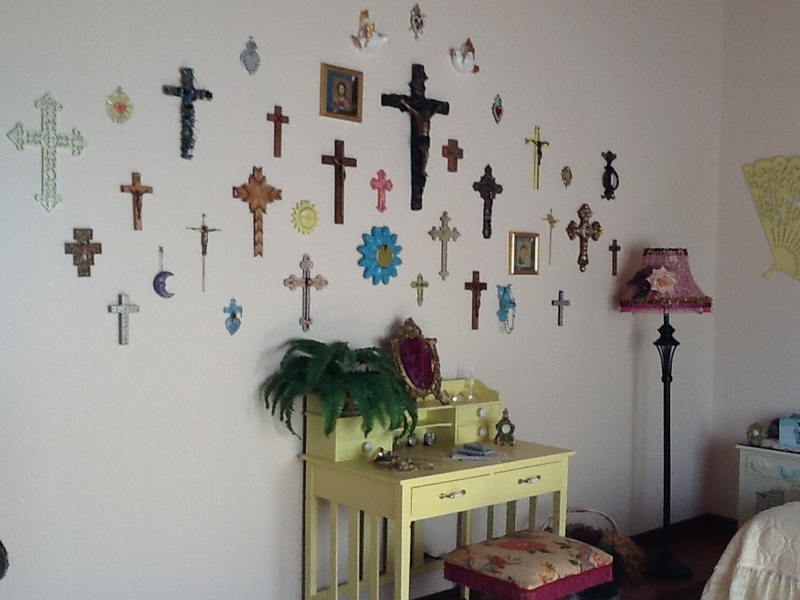 With this in mind and also because I couldn’t think of anything else to hang, I decided to fill my ridiculously large bedroom wall up at the mountain house with crosses and ex votos of different sizes and styles. I still have a long way to go before the wall is complete as the ceilings are about 20 ft. high in that room, but I think I’ve got a decent start. Now that my family knows that I’ve started collecting crosses from different countries, they’ve begun to contribute to the collection and have brought back some lovely ones whenever they’ve travelled…which fortunately for me is pretty often. 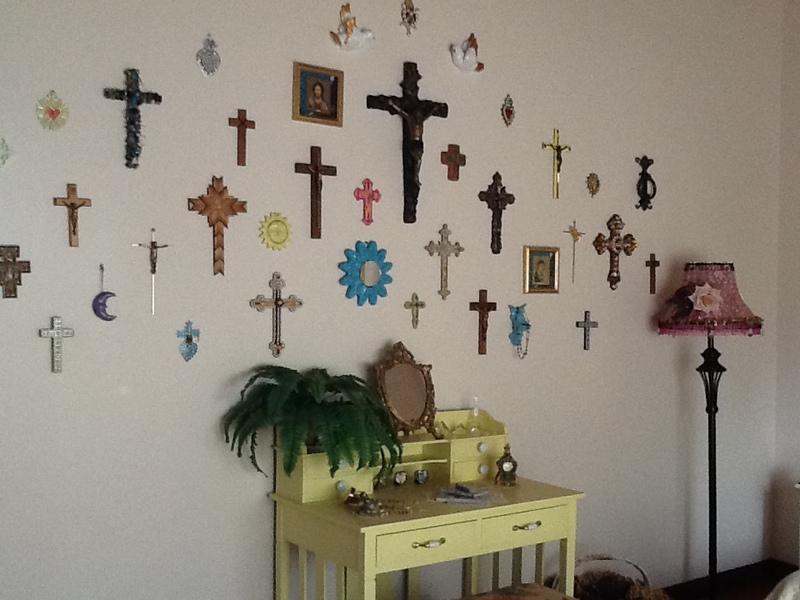 I have to admit that my kids think the wall of crosses idea is kind of weird and my daughter wondered if I was perhaps expecting a visit from vampires and wanted to know why I would collect such a thing as crosses? 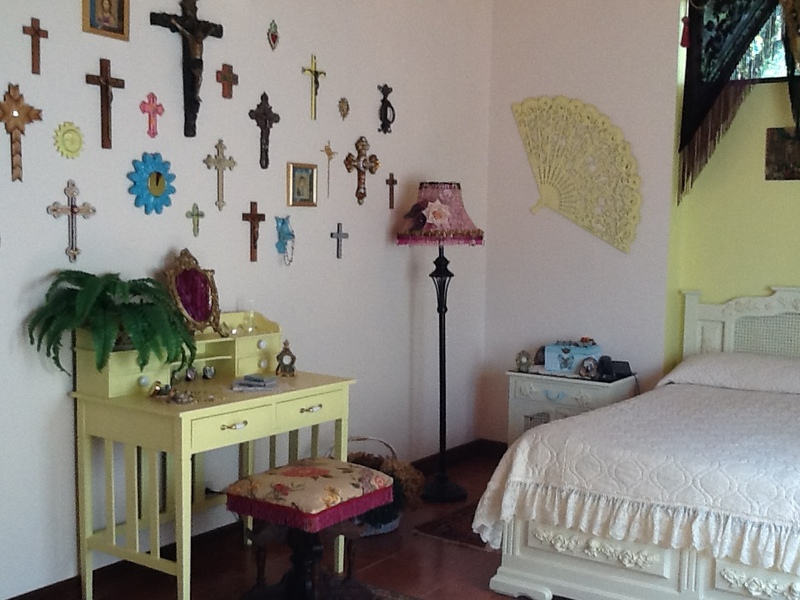 Daughter: WHY did you hang all those crosses on that wall??? Me: Because I like them. 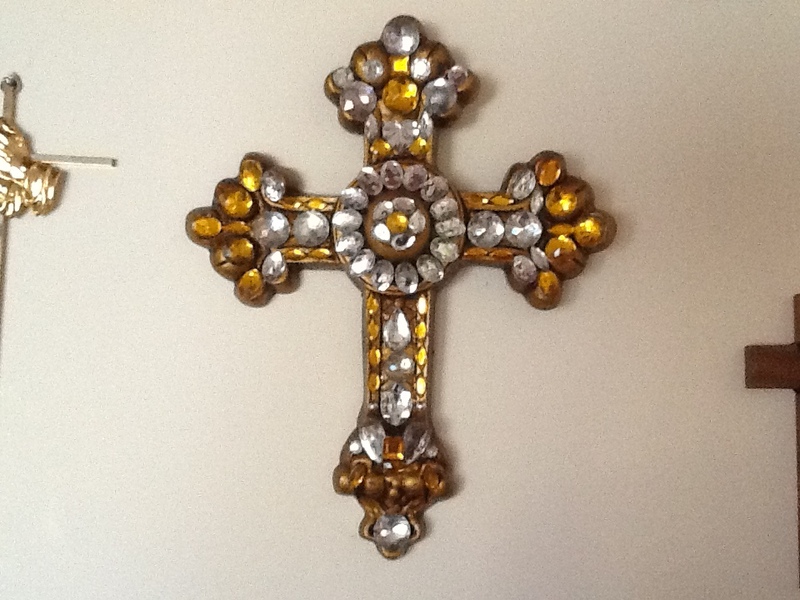 I particularly really like antique crosses. Daughter: Yeah but don’t you think it’s kind of weird? Me: Not really. I think it looks cool. Daughter: It’s creepy. My friend took a picture of it. Me: Hmmm. That weird huh? I think it’s actually grown on her at this point and I’m hoping she will bring me back a nice one from the vatican when she goes to Italy next week. 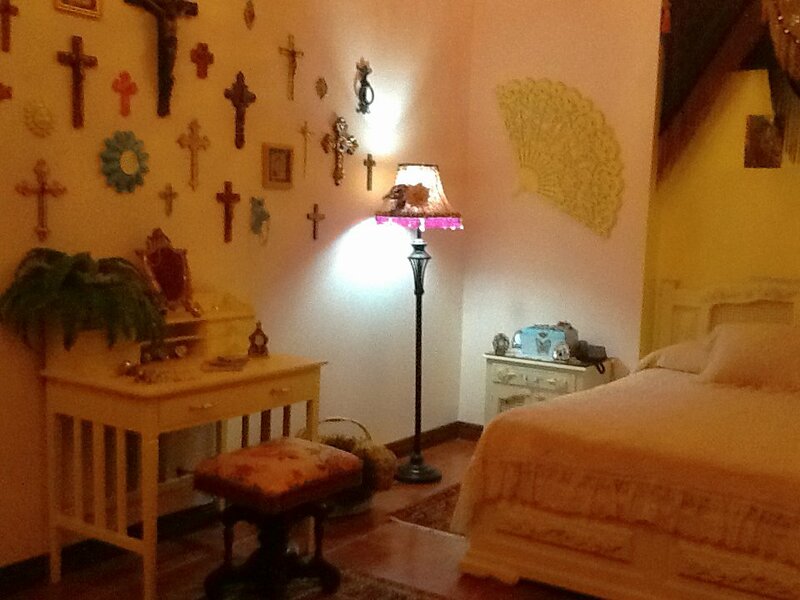 The largest cross in the center of the wall is a Mexican plaster cross. 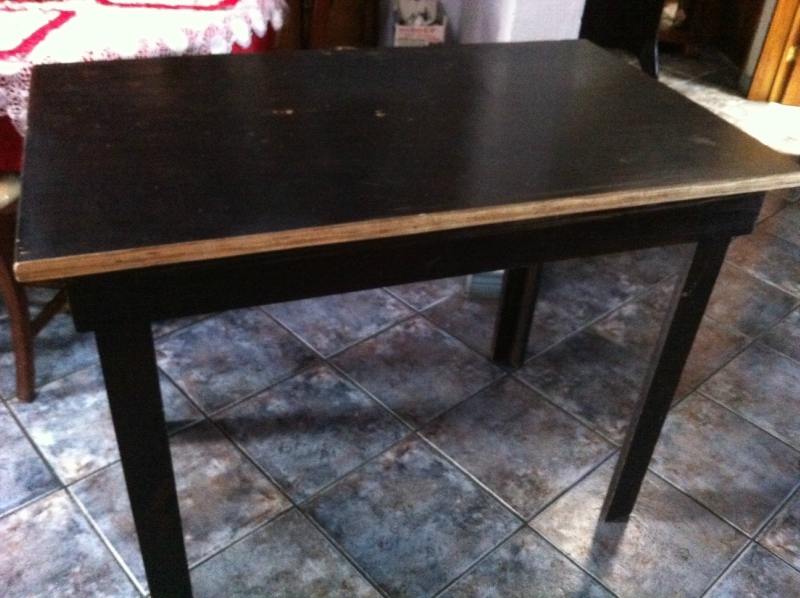 It needed restoring when I bought it because it had several nicks and the paint was chipped. You can read about that here. 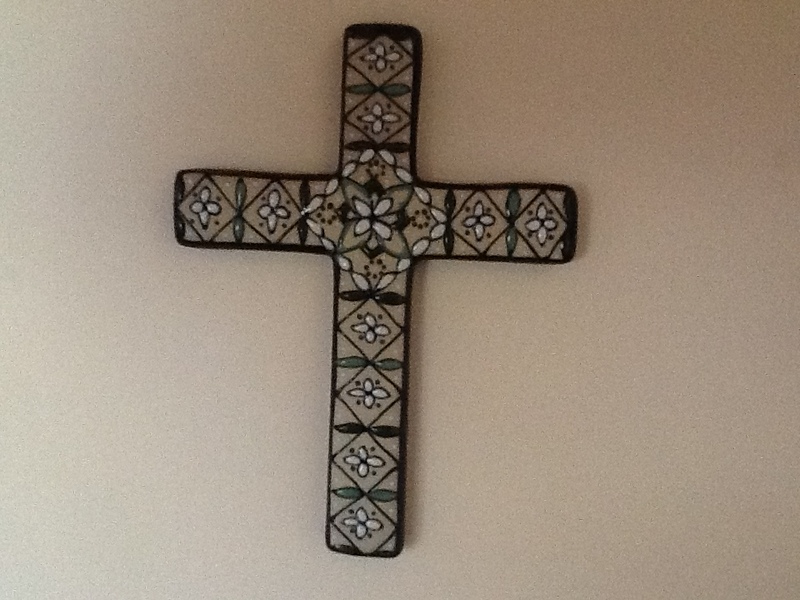 This little white cross is from Egypt and it’s all inlaid with mother of pearl. This type of inlaid work is typical of the Middle East and the technique reportedly dates back to Phoenician times. 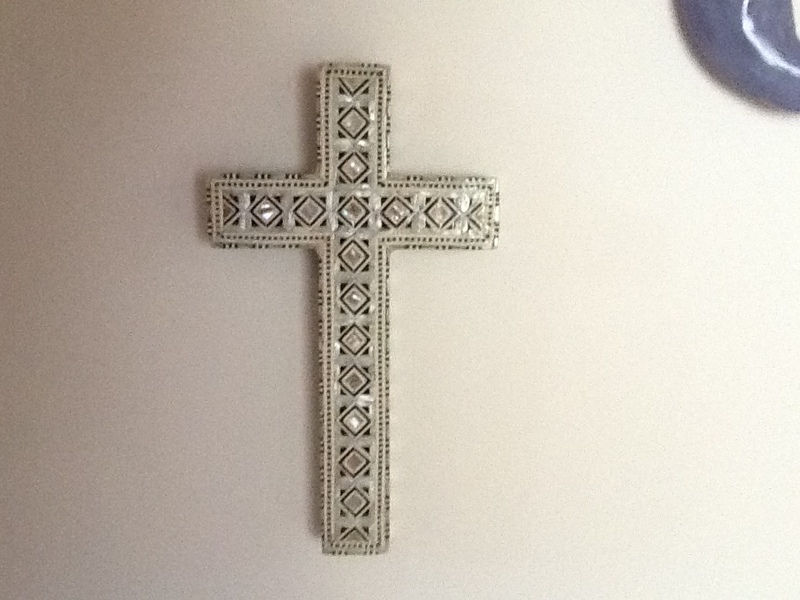 Here’s a jeweled cross. 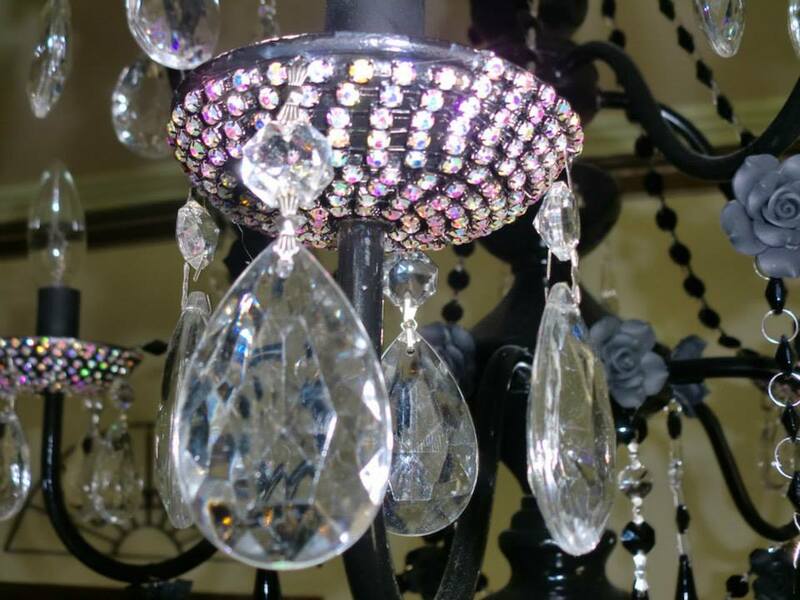 You can never have too much bling. 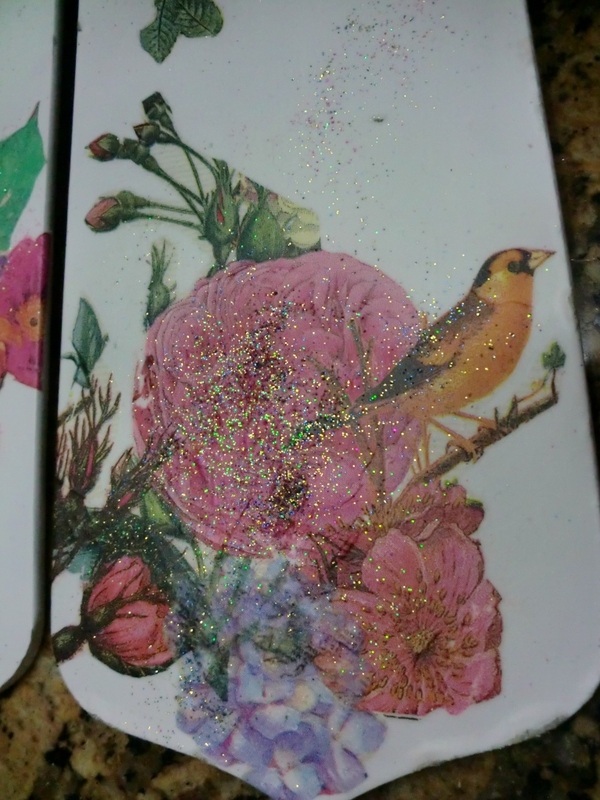 I’m a sucker for rhinestones and sparkly things. 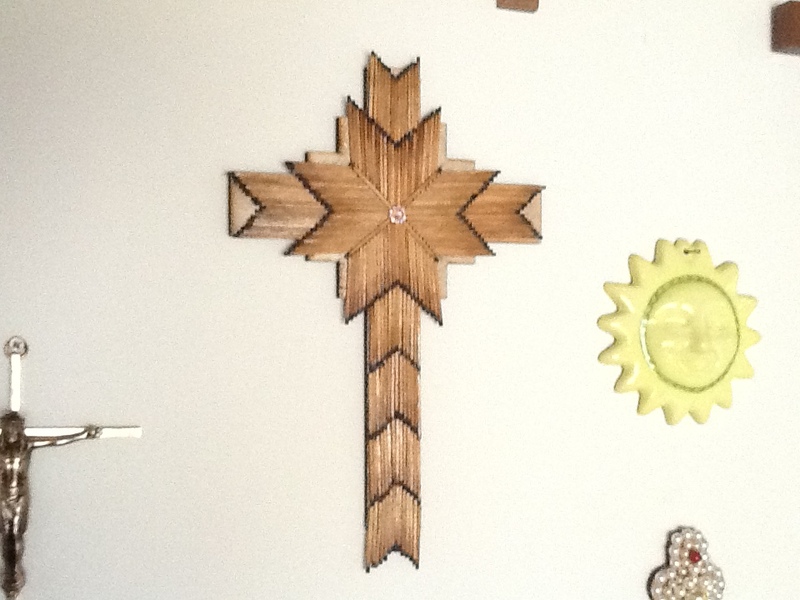 I made this one myself out of matchsticks on a plywood cross shaped base. 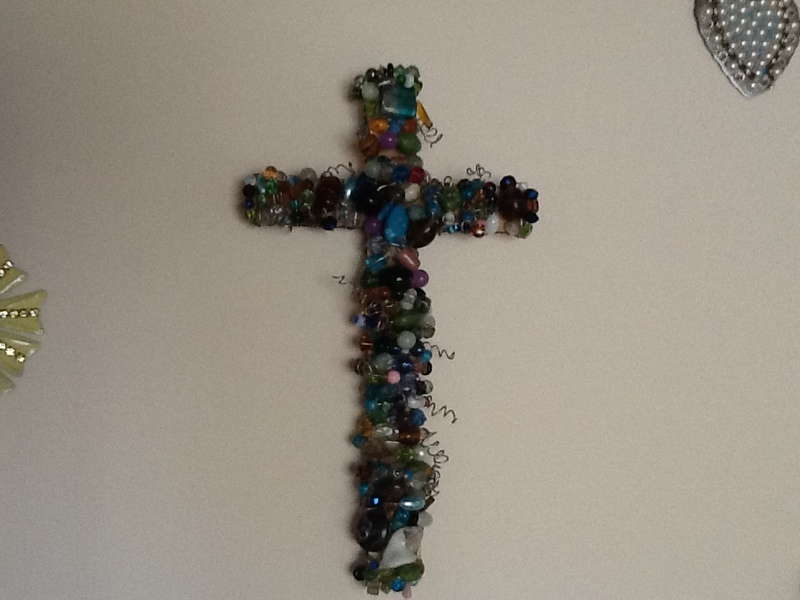 Here’s one I made with different colors and sizes of glass beads. My daughter in law brought me this cute little hand painted ceramic cross that she purchased during a trip to Mexico City. 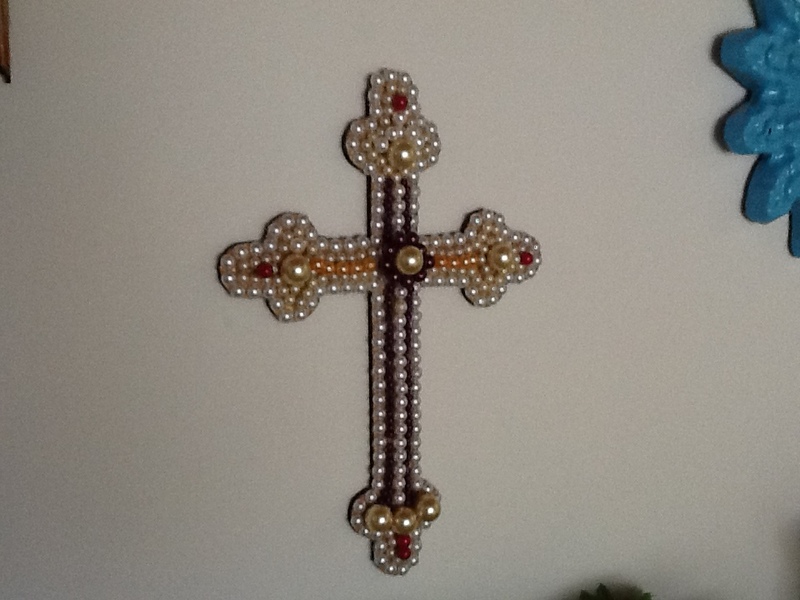 This one is made with different colored pearls. 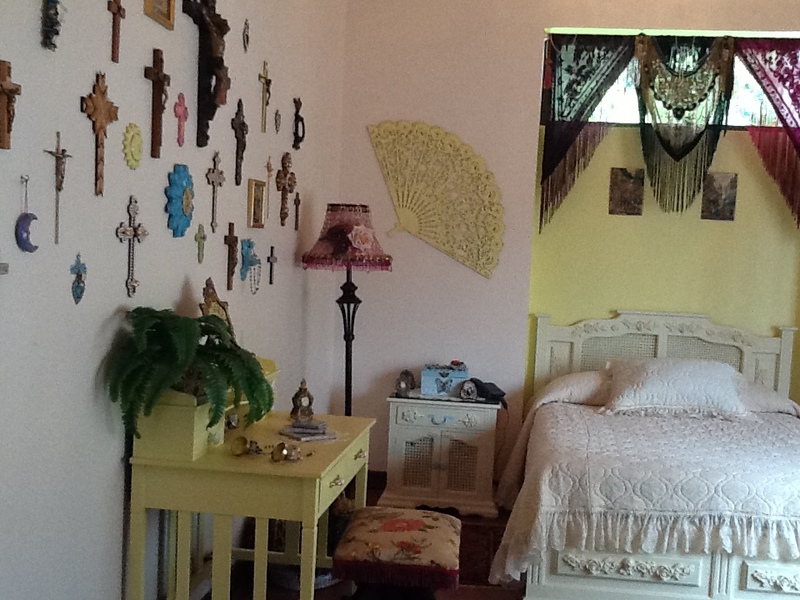 I did hang a few other things on the wall besides crosses and ex-votos including a hand made wrought iron door knocker that my other daughter in law gave me (made by her uncle) in an attempt to avoid a monotonous look. The orthodox icons in square gold frames are from Russia. There’s still quite a bit of wall to cover upwards and I’m always on the look out for antique or foreign religious art, even at the risk of looking like Carrie’s mother. After sanding the shiny finish off for what seemed like eons, I glued on the appliques with No More Nails and held them in place with masking tape just in case. Then I started painting. 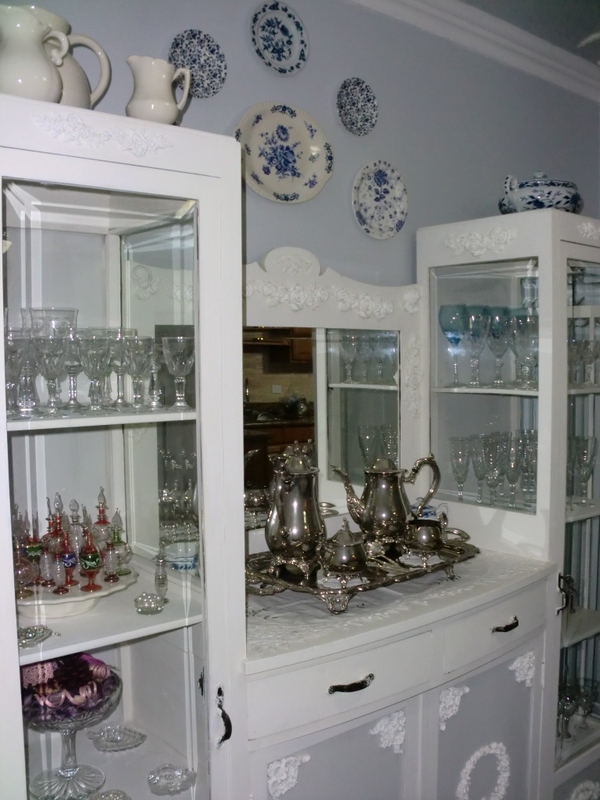 I must confess that I didn’t paint the cabinet in any particular order and I didn’t empty it of the crystal before starting on the outside. It took me about two weeks to finish it because I didn’t work on it for long periods at a time and I just randomly painted whatever part I felt like painting on any given day. I figured I wouldn’t get as bored or antsy with the project that way. It wasn’t without it’s problems however. 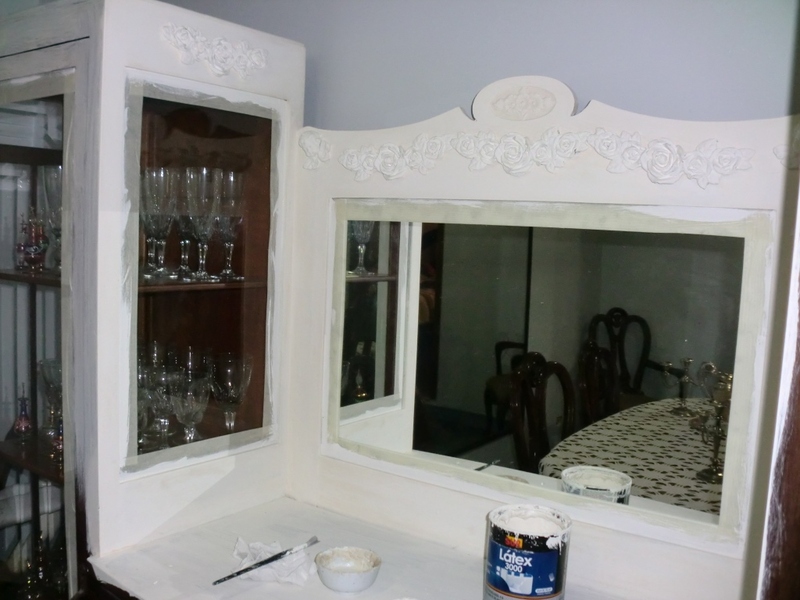 Even though I sanded it quite thoroughly, brown stains kept coming up through every single coat of white paint that I applied. 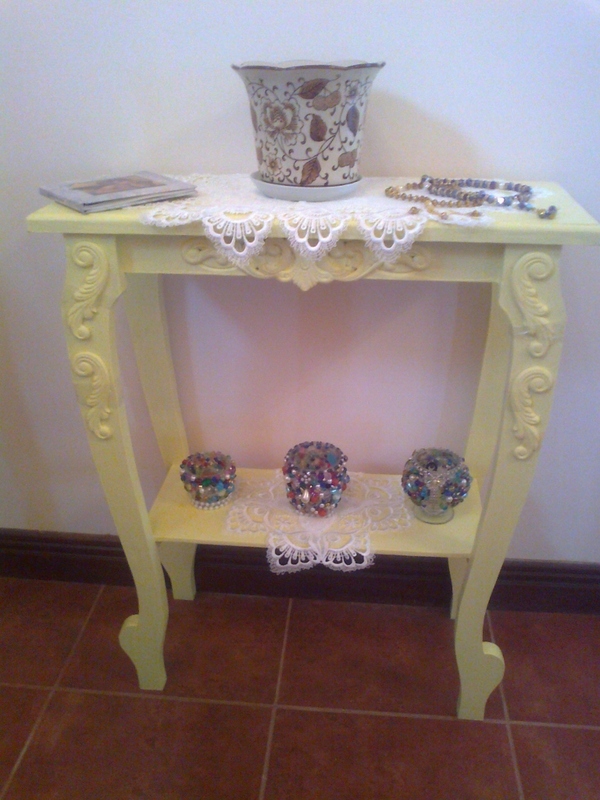 I have no idea why that happened, it’s never happened before on any other piece of furniture that I’ve painted. 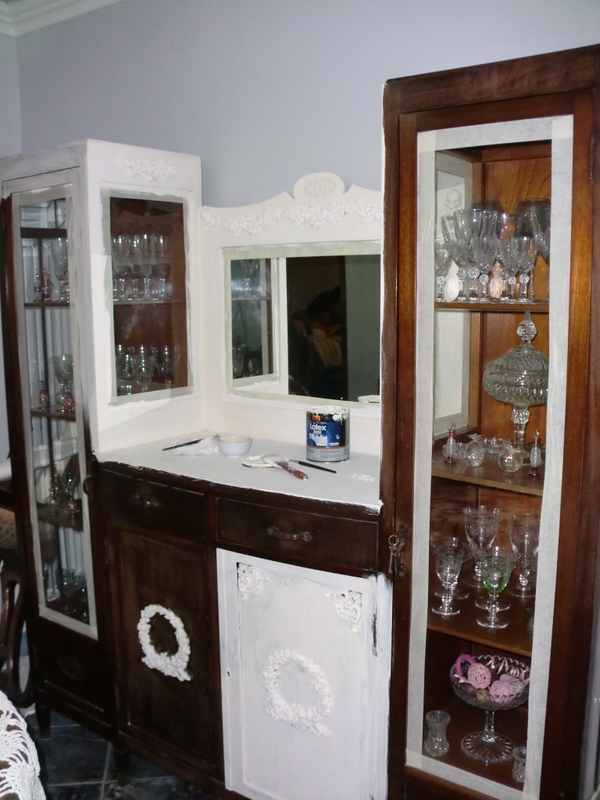 I have a feeling that whoever stained and varnished this cabinet all those many decades ago must have used some kind of really strong home mixed concoction that kept coming up to the surface as each coat of white paint dried. Who knows what they used. I was starting to feel like Lady MacBeth. 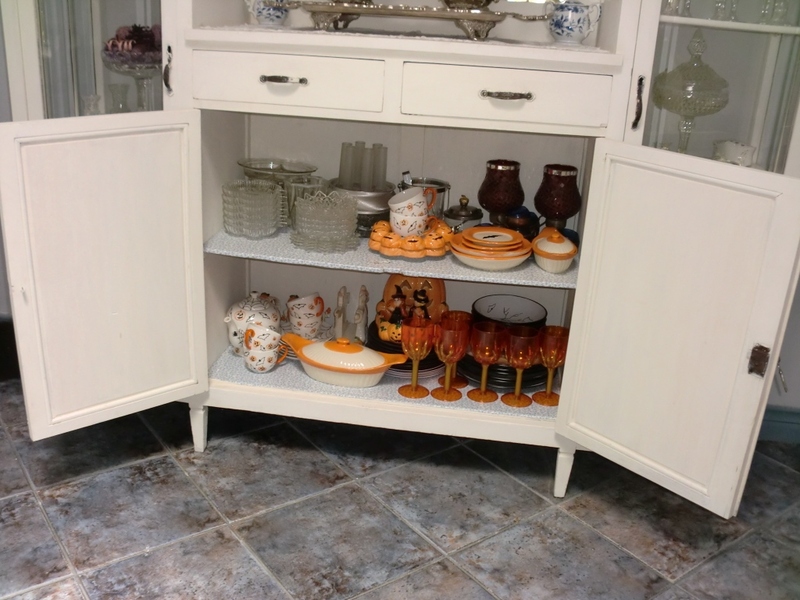 Had it not been for fear of breaking my toe, I would have kicked the cabinet right out the door and down the stairs at that point. 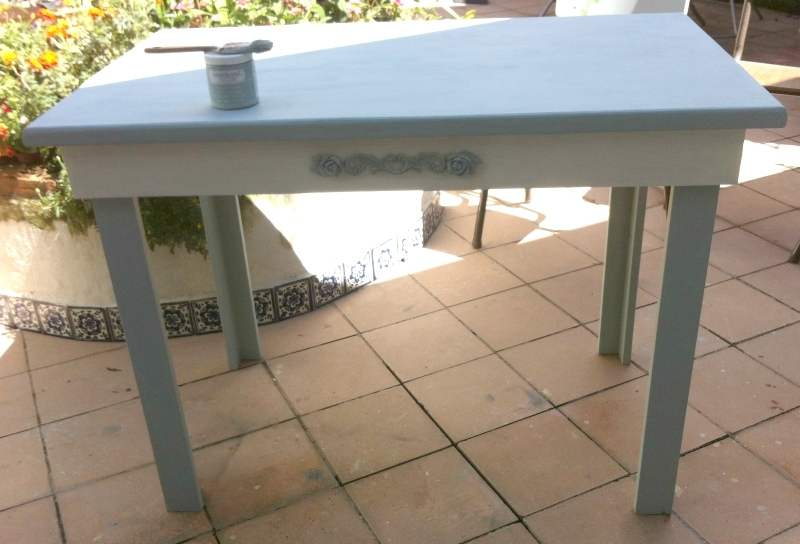 Finally I just painted over the stains with a really dark gray color and then applied more white over the gray. That pretty much solved it. 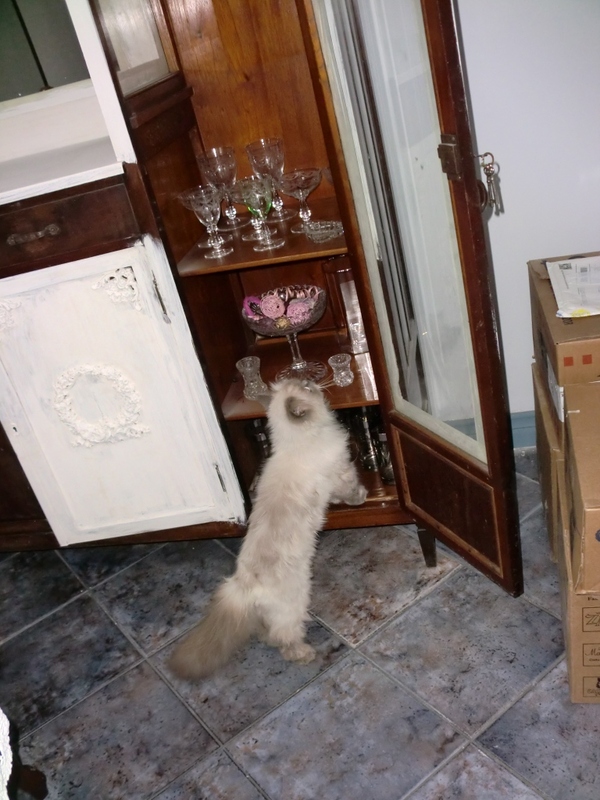 Semsema helped me out by inspecting the project regularly. She had to approve everything beforehand. 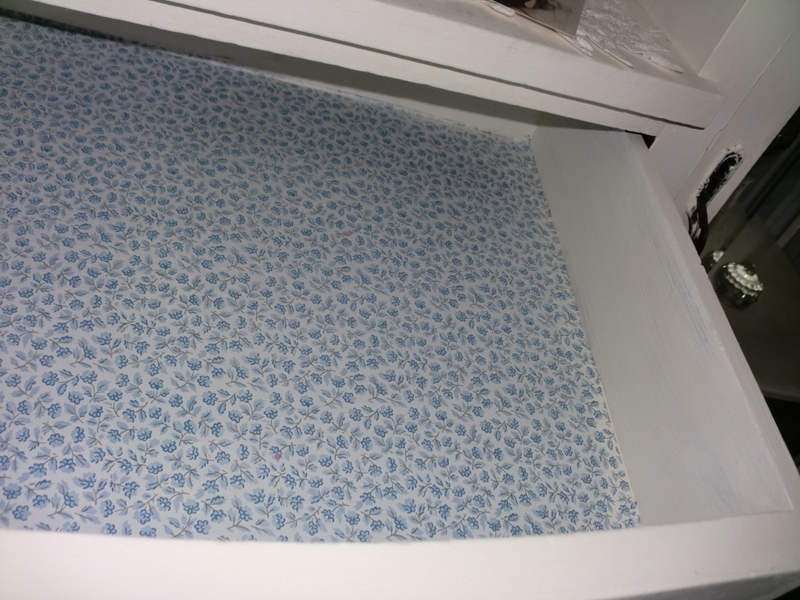 The inside middle section of the cabinet and the two drawers had been covered in a hideous beige textured shelf paper that had fused to the shelves in some spots. I removed it all and scrubbed the inside of the cabinet with Pine Sol. 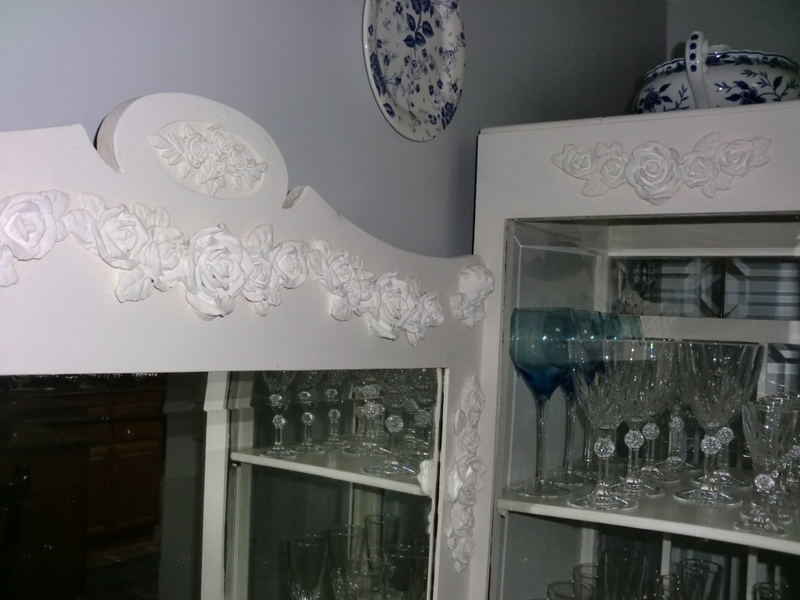 Then I painted it white and put new shelf paper in. 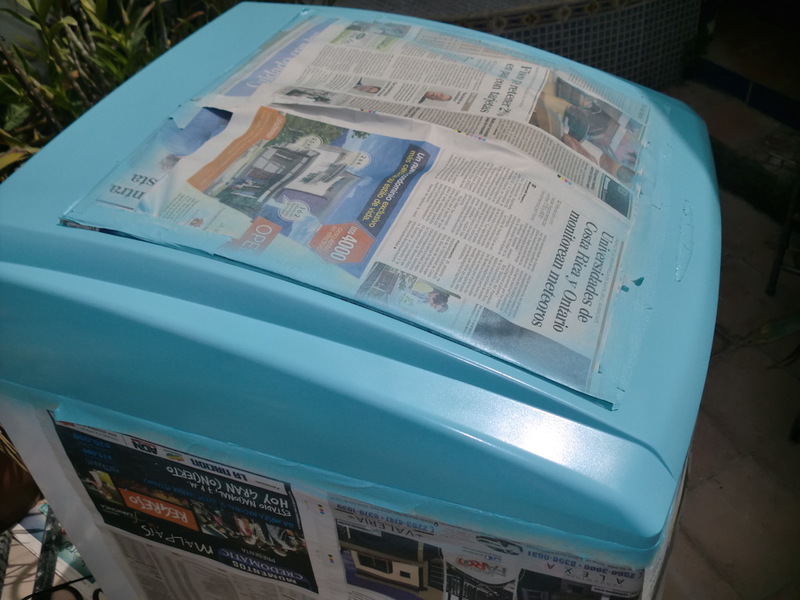 And finally after a couple of weeks and about 6 or 7 (or maybe 8) coats of paint….it was done. 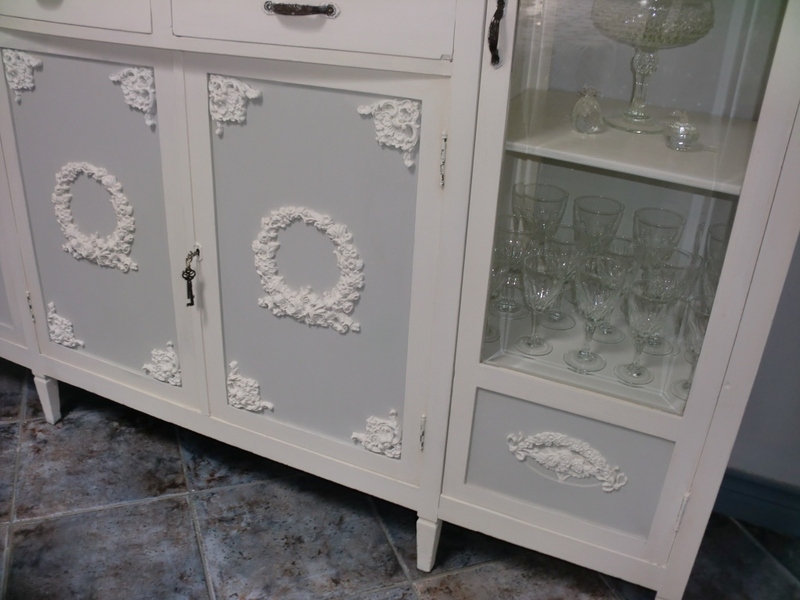 The gray doors seem to make the white appliques stand out. 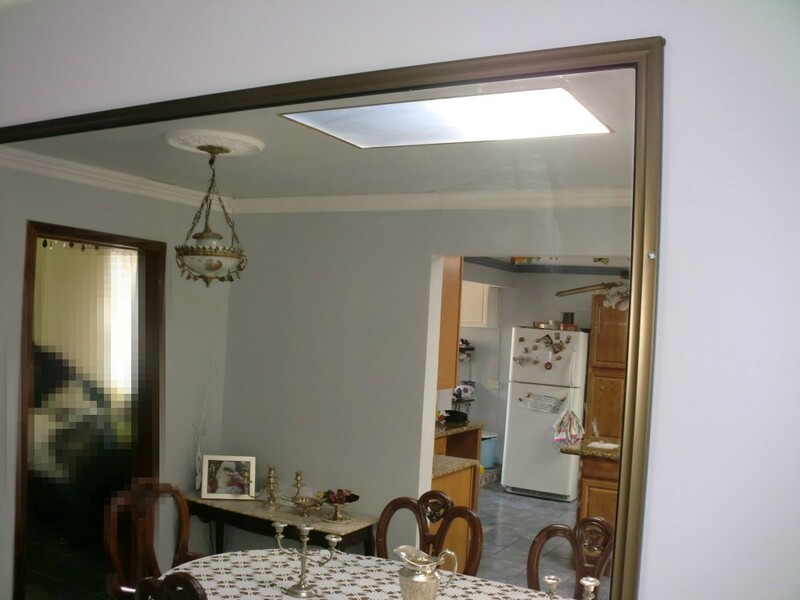 The back part of the glass enclosures are also painted gray. 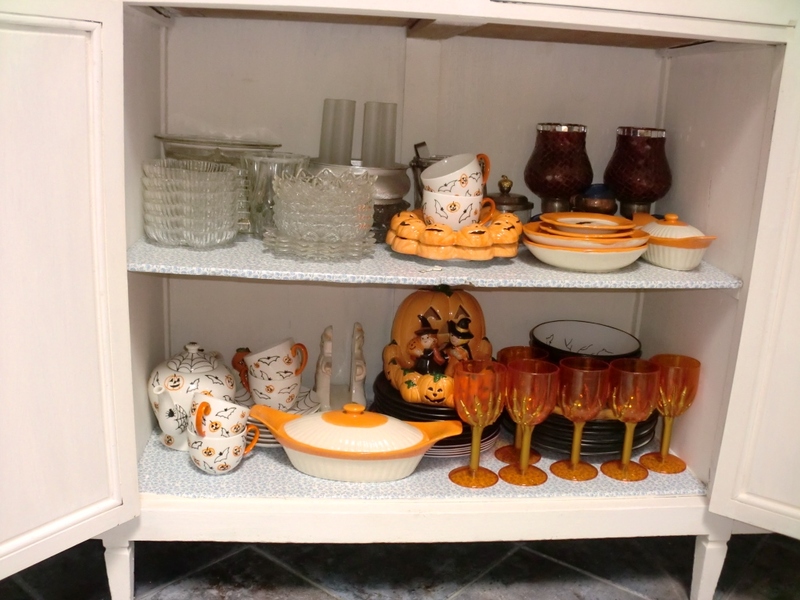 I finally found a place for my Halloween tableware which had previously been stored in cardboard boxes. 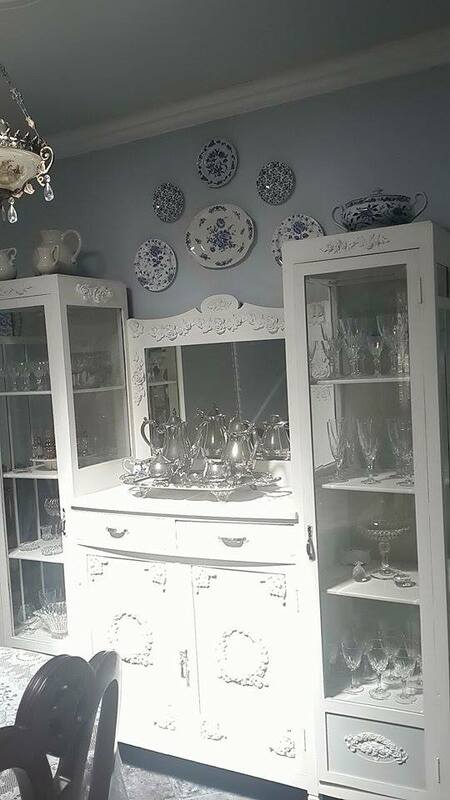 I shared a couple of pictures of the finished cabinet on my Facebook page and was surprised when a friend of mine who lives in France asked me if it was french. 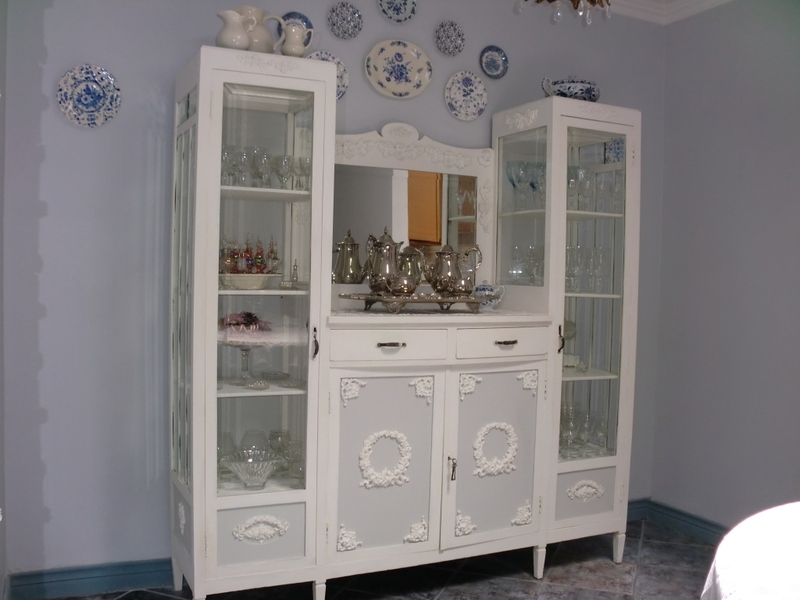 Just the fact that a french woman could mistake the cabinet for a french antique was compliment enough for me. I just smiled and said, Oui, cést francaise maintenant! Hello! 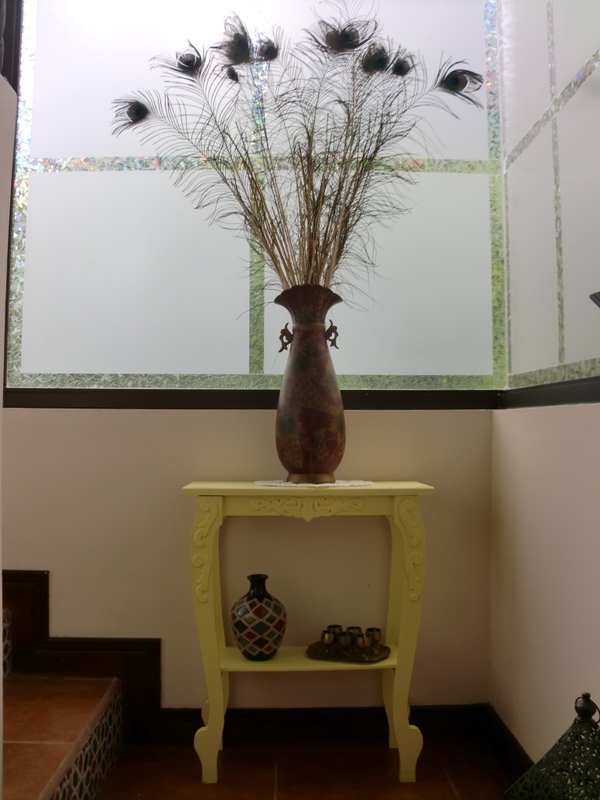 I haven’t updated this blog in quite a while because we have been going through a major renovation of our city house since December and I’ve barely had time for anything. Talk about stressful! This place has been a nuthouse for over three months and I actually ended up in the emergency room with a severe case of combined gastritis and colitis caused by the strain of having a houseful of construction workers making as much noise and mess as is humanly possible. 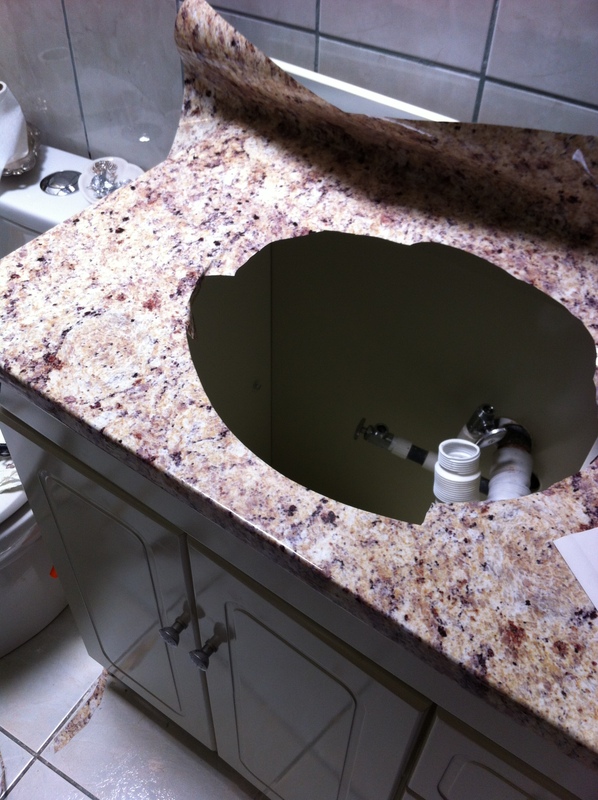 The doctor wasn’t really very encouraging and he sagely informed me that my symptoms would dissapear once the remodeling was done. Well, I have to admit that he was actually right. 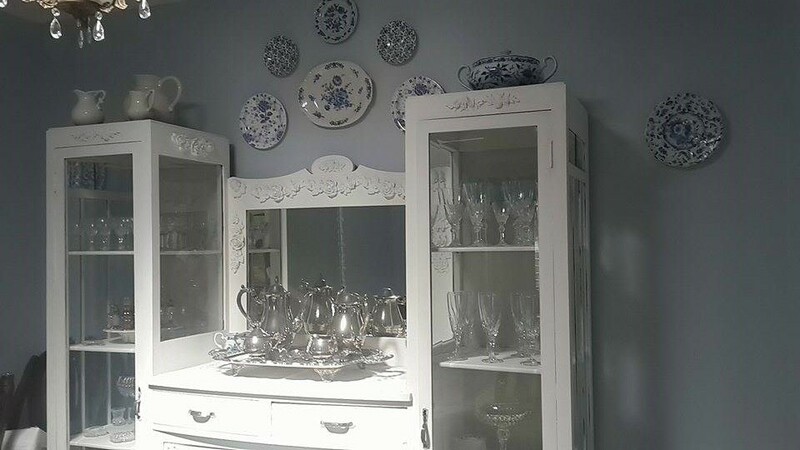 Even though there are a few things that still need to be finished up (I’m still waiting on the new granite counter tops to be delivered) and I am still washing the dishes in the laundry room, most of the remodeling is done, the workers are gone and I’m feeling much better. I had begun to despair that they’d never leave! 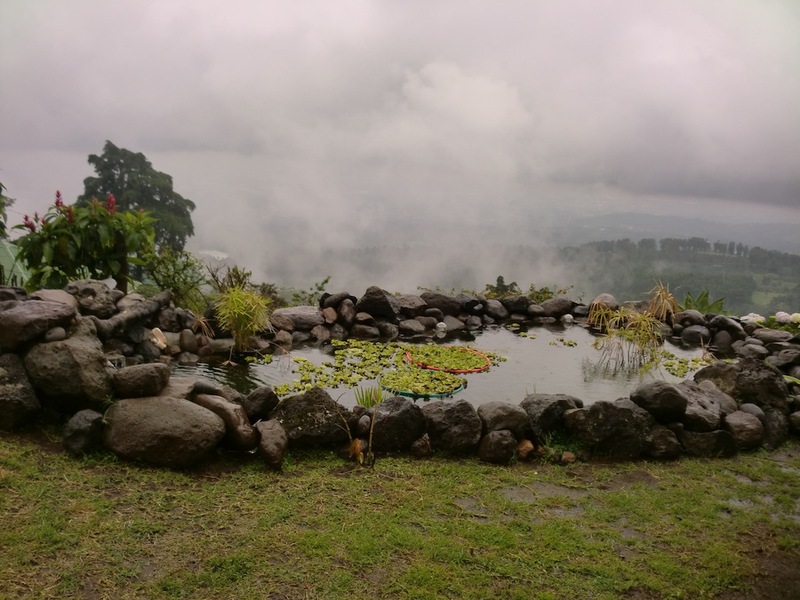 Anyone who has ever had any remodeling work done in Costa Rica knows that if they tell you they can do it in a month, you can count on it being at least three months. That’s if you’re lucky. 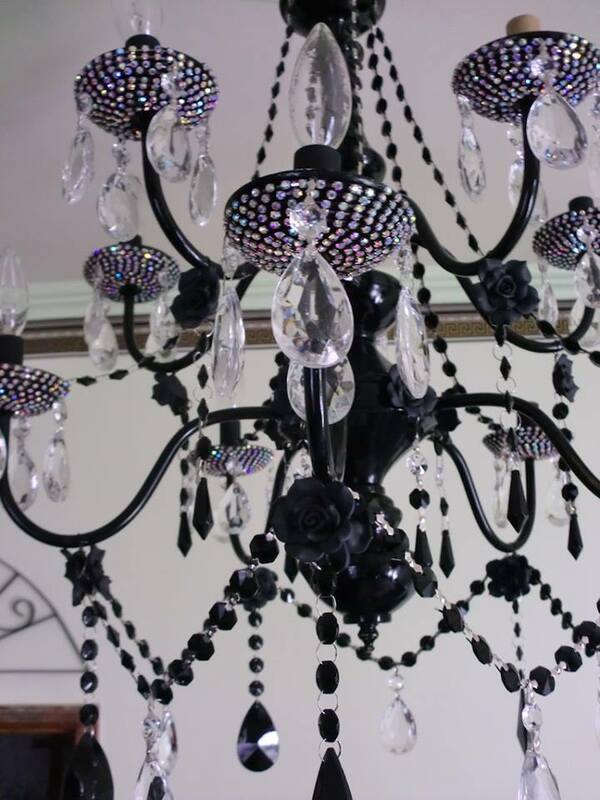 Now that things have settled down a bit, I finally had time to finish up a few projects that I had left on stand-by including this black and white chandelier that I’d started to work on last year. I bought it at a garage sale where it sat forlornly in an old cardboard box gathering dust under a table of books. 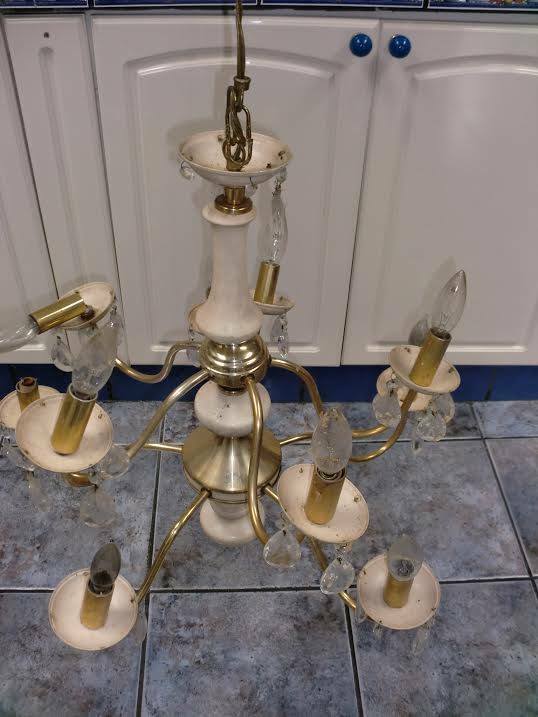 It started life out as an insipid beige and brass thing. It was quite ugly but it had good bones. 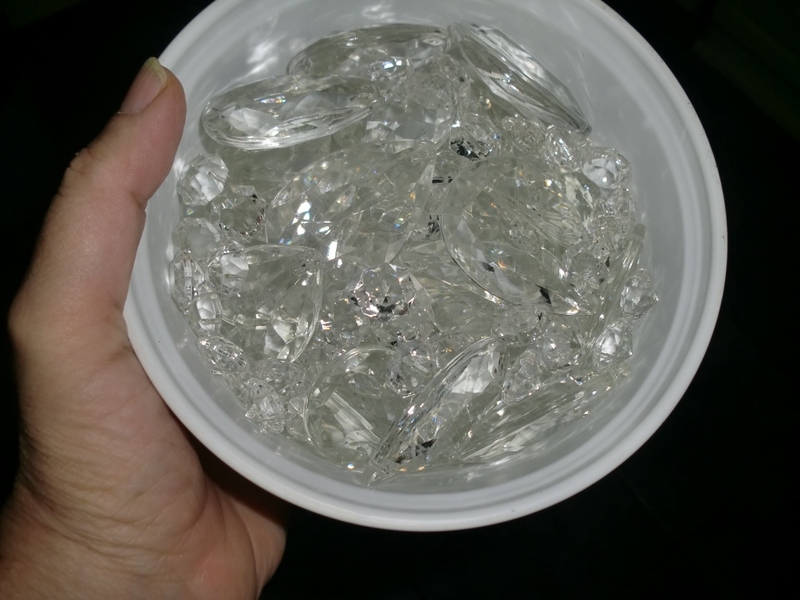 The plastic bobeches were beyond hideous and I had originally planned to replace them with sparkly lead crystal bobeches. 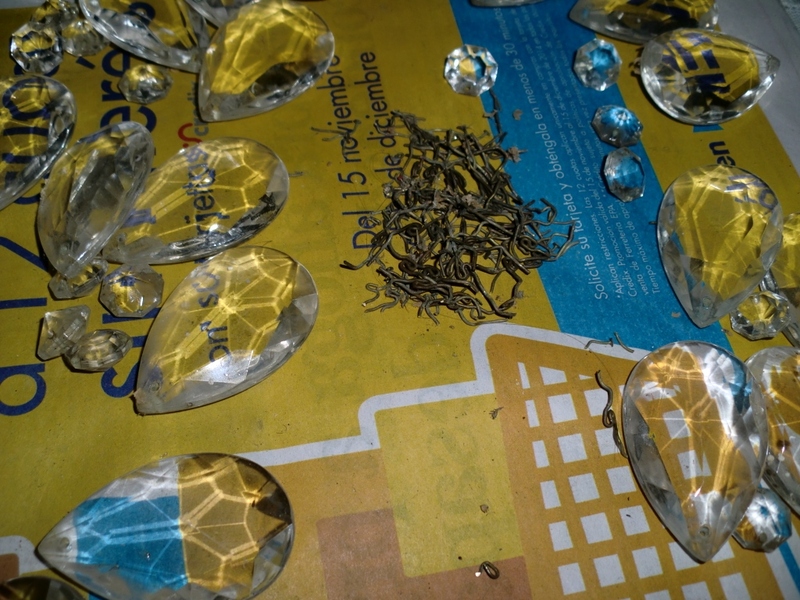 Upon removing them however, I discovered that the center hole was unusually tiny and I realized that I would be unable to find crystal bobeches with such a small diameter hole. I had no choice but to recycle them. 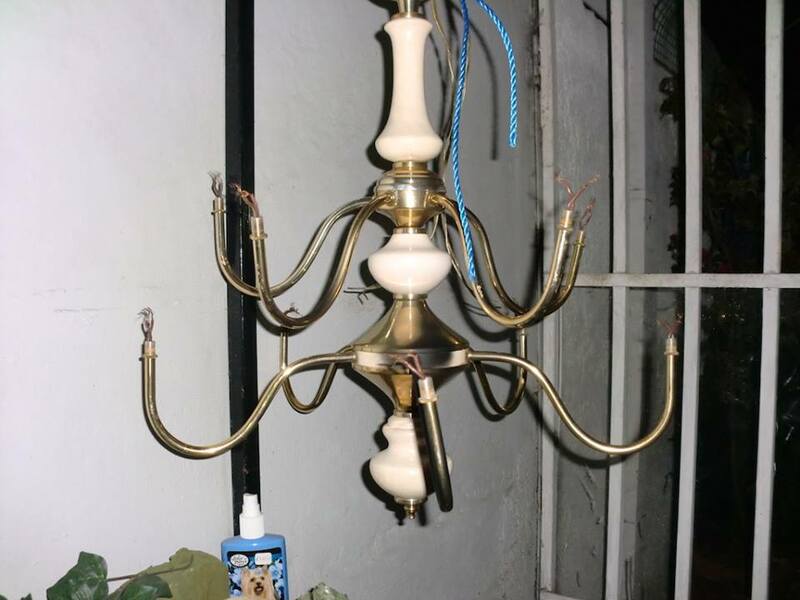 I stripped the lamp bare, removing the bobeches, the crystals and the bulbs with their sleeves. 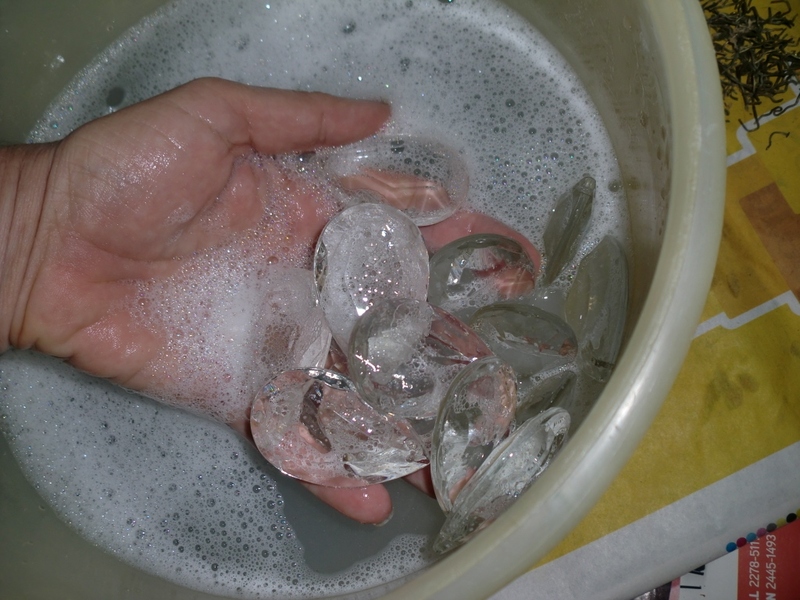 The crystals needed a good scrubbing with soap and water. 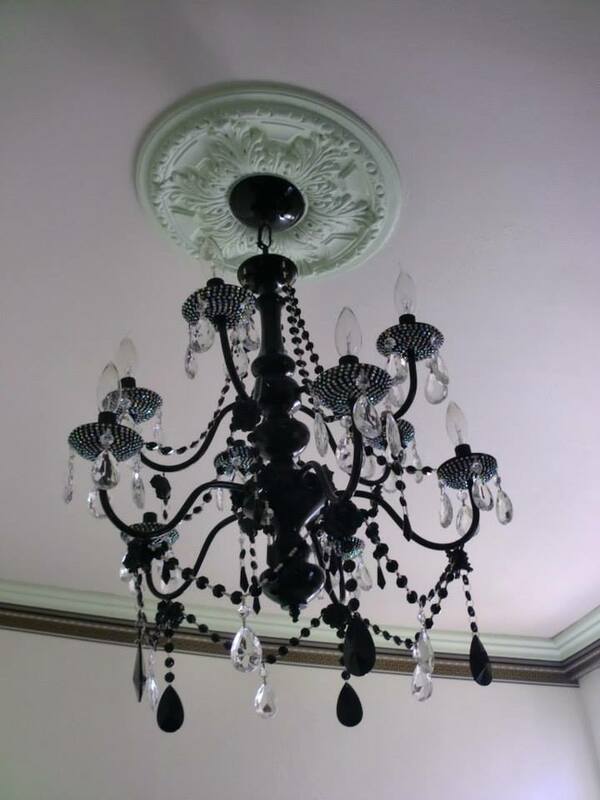 Then the chandelier got three coats of black spray paint. So did the plastic bobeches. 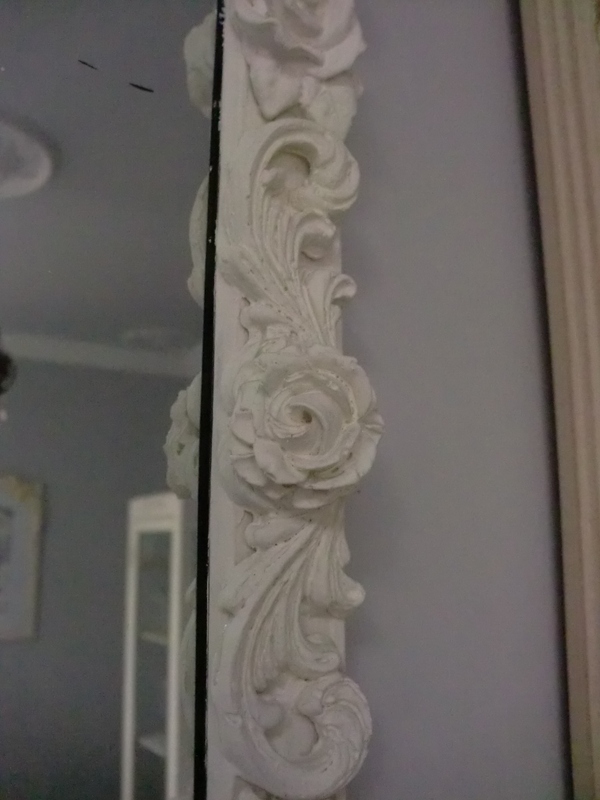 But even after I spray painted them they were still about as plain and uninteresting as they had been when they were beige. Since I was unable to replace them with lead crystal bobeches, I decided to make them as sparkly as possible so I covered them in aurora borealis swarovsky rhinestone chain. 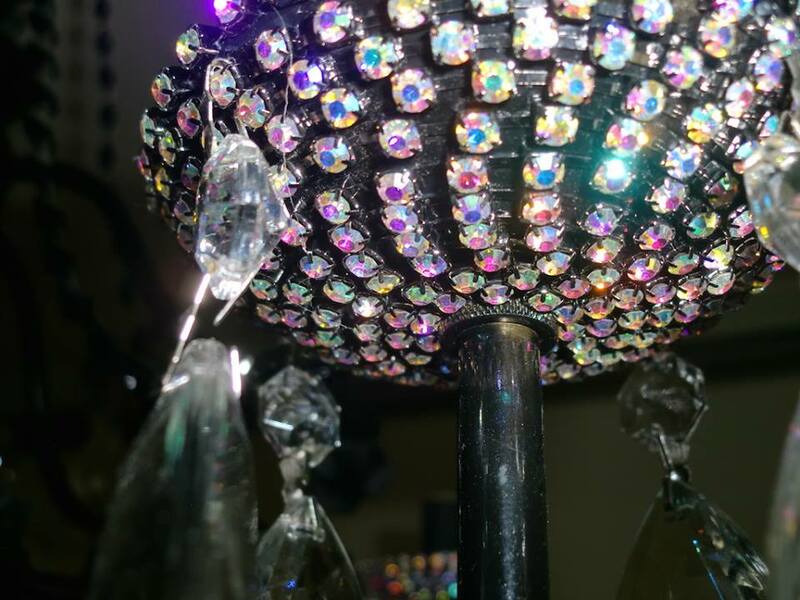 Then I hung the large clear crystal prisms back on. 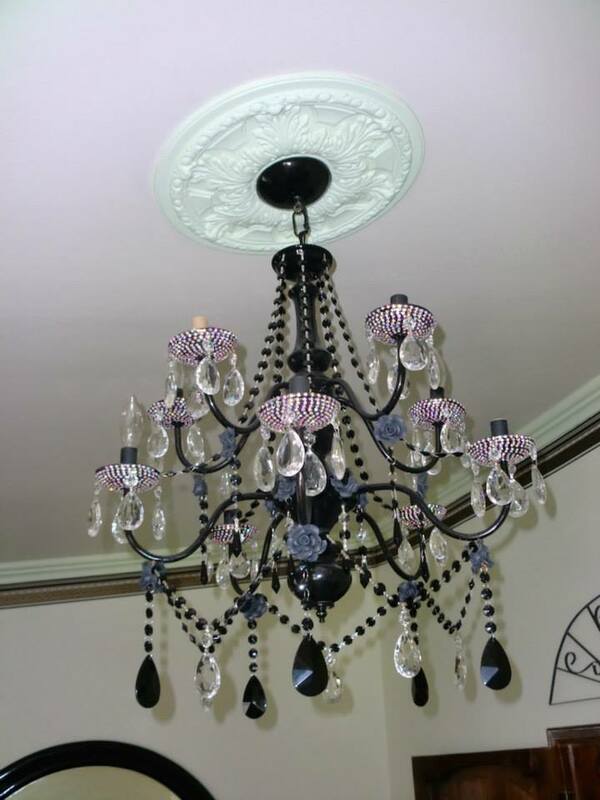 I also added black octagon crystal chain and large black teardrop crystals. 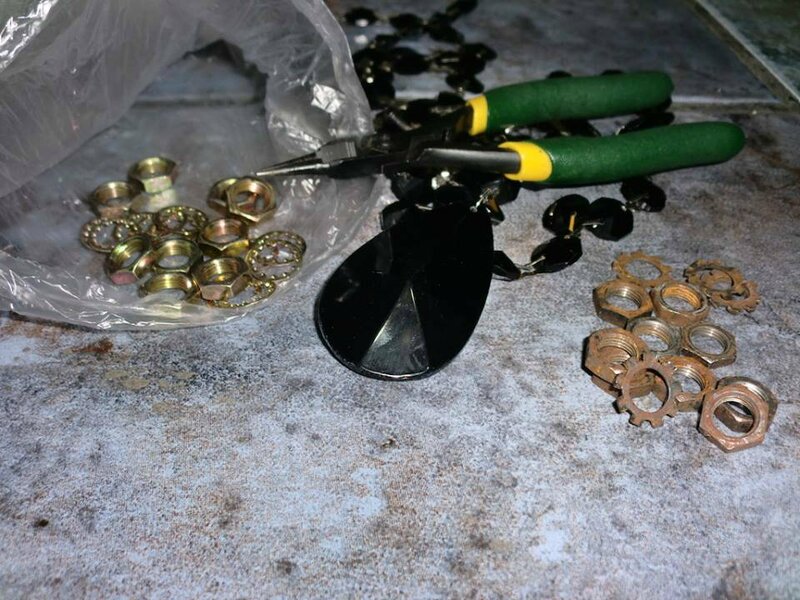 The old rusted nuts and bolts that held the bobeches in place were replaced with shiny new ones. 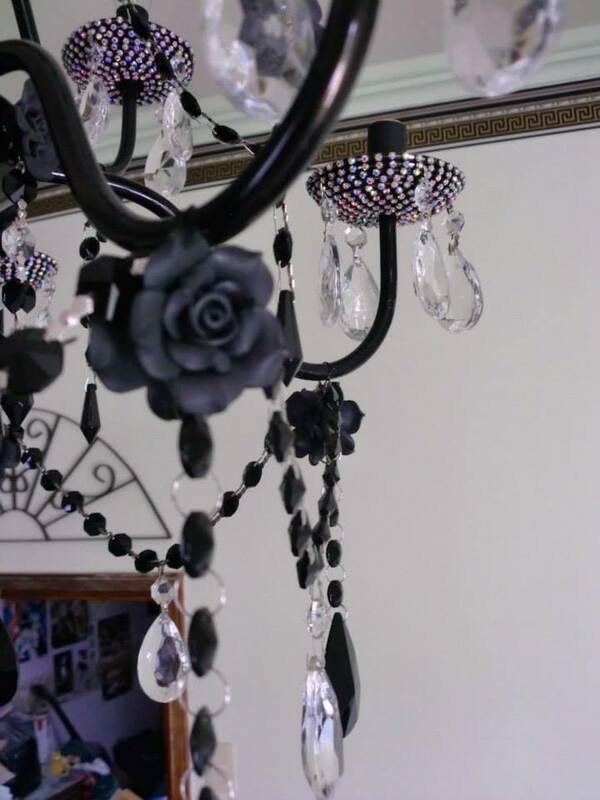 Handmade fimo clay roses topped each strand of crystal chain and I also hot glued some roses on to the center part of the lamp. 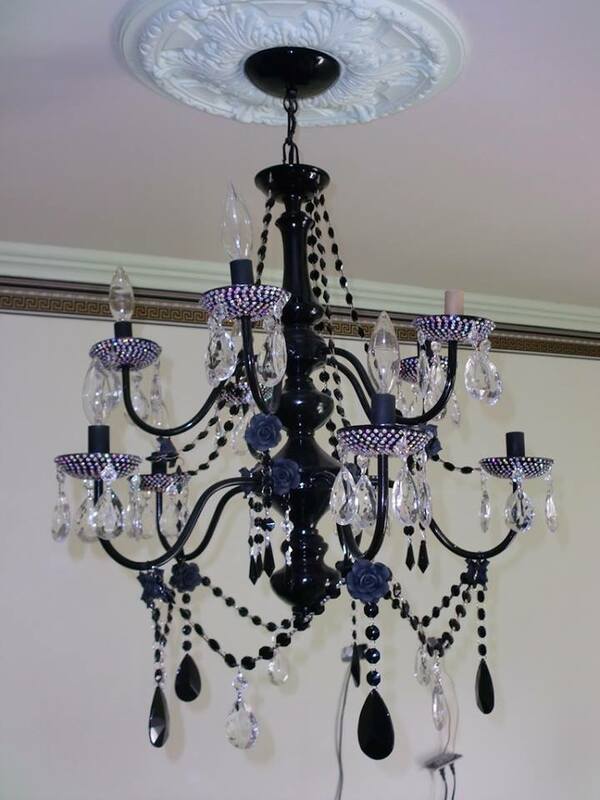 I usually don’t decorate in black and white because I prefer brighter colors, but I have to admit that I really like how this chandy turned out. Maybe it’s the sparkle factor that makes me like it so much. I hung it in my bedroom right over my bed so that it’s the first thing I see when I open my eyes in the morning, and the last thing I see when I close them at night. 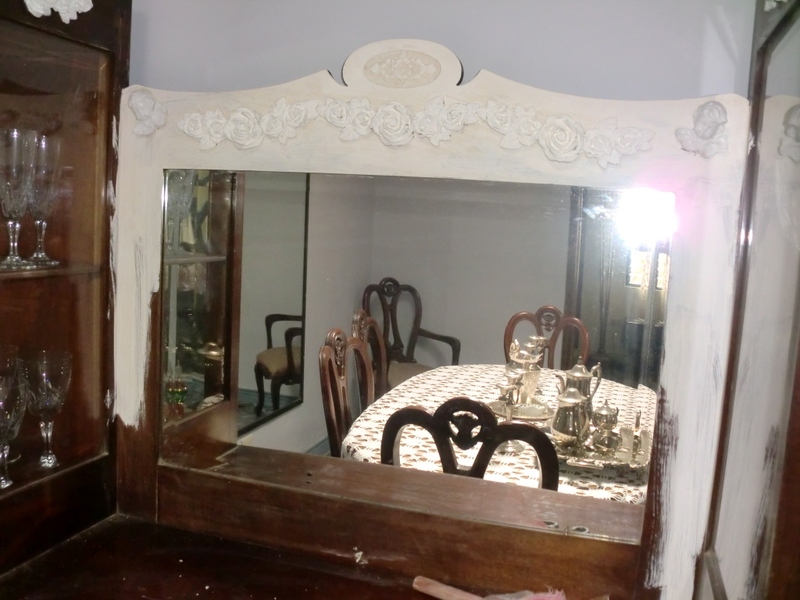 Our city house is going through a major and much needed renovation (finally!) We’ve lived in this house since 1996 when we bought it from the family who built it. 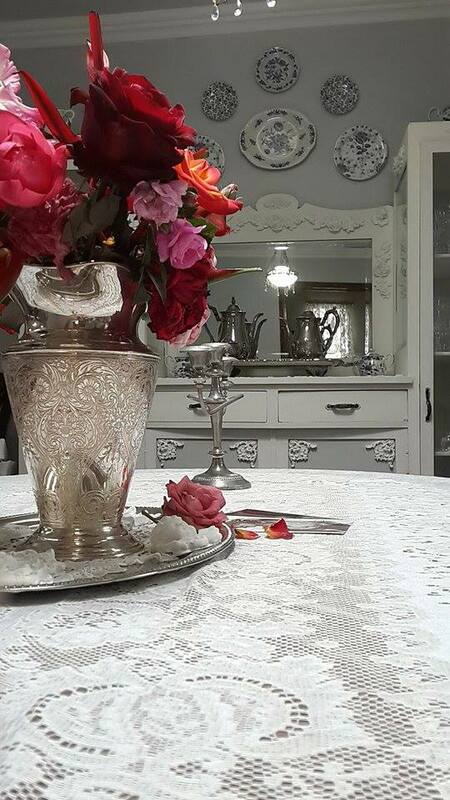 Even though we repaired and replaced many things during the first two or three years including the roof, the floor, the doors and the windows, we’d always maintained the house’s original layout. But all these years later I felt that I’d lived with someone else’s floorpan long enough and so, renovations began. 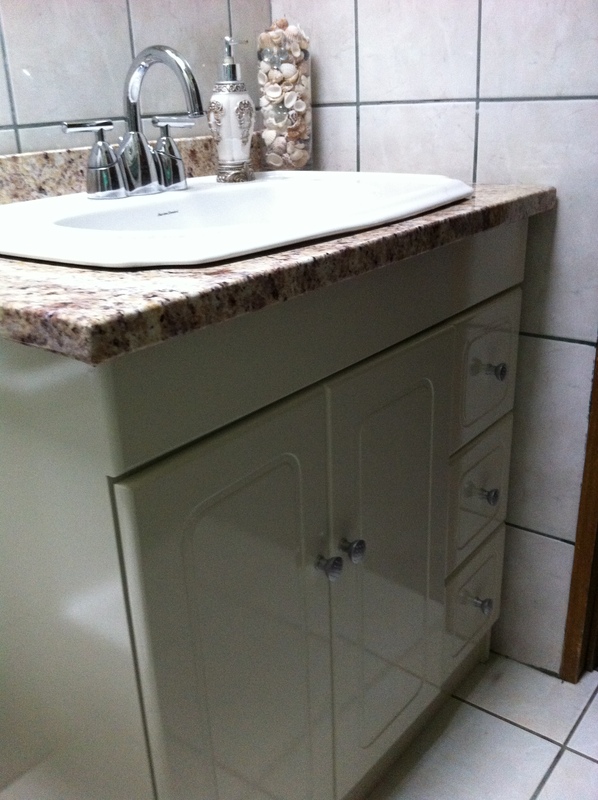 The laundry room was one of the first areas that we remodeled or I should say, relocated. It used to be out in the back which meant that I had to cross the back yard to get to it, often in the rain. 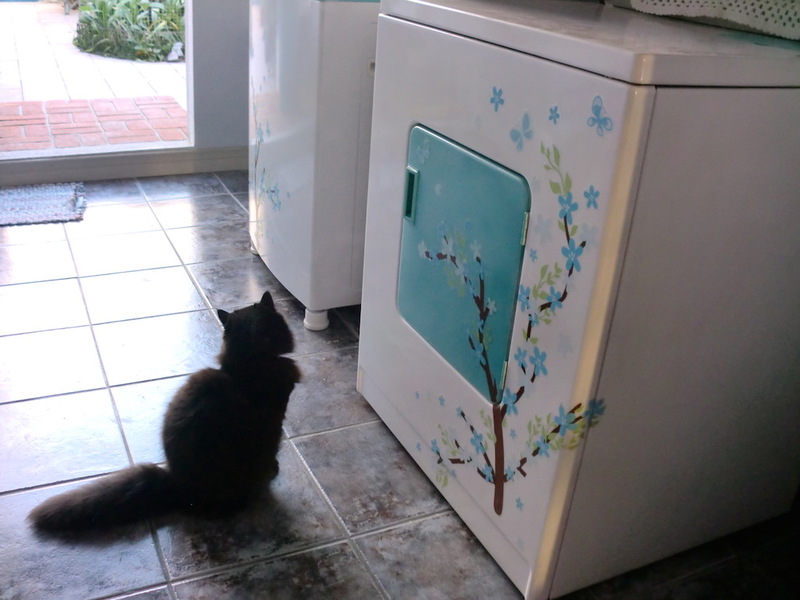 Now it’s conveniently situated off the kitchen. 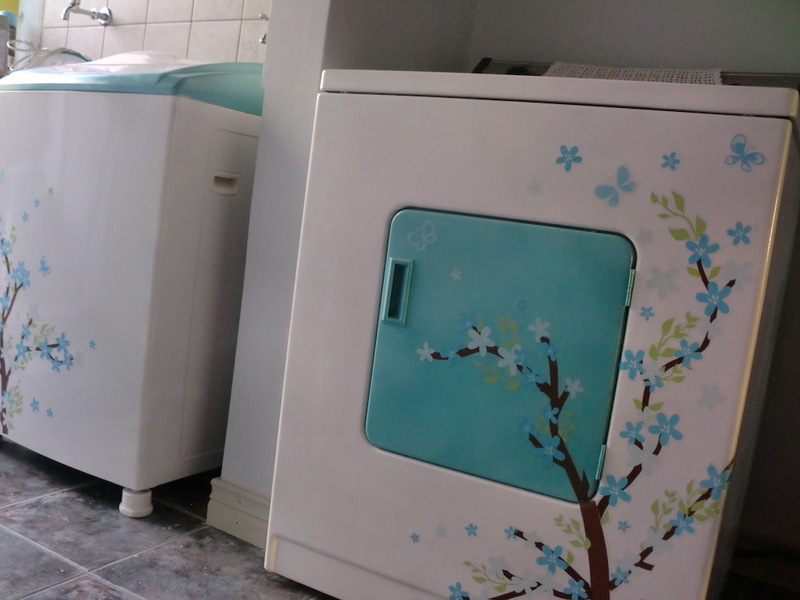 Hubby wanted to go out and buy a brand new washer and dryer set for the new laundry room but I honestly didn’t think we needed one, our washer was only four or five years old and our dryer was almost new. Well, ok, it wasn’t new at all but at least it was good as new on the inside. However, on the outside it looked about as old as Methuselah. 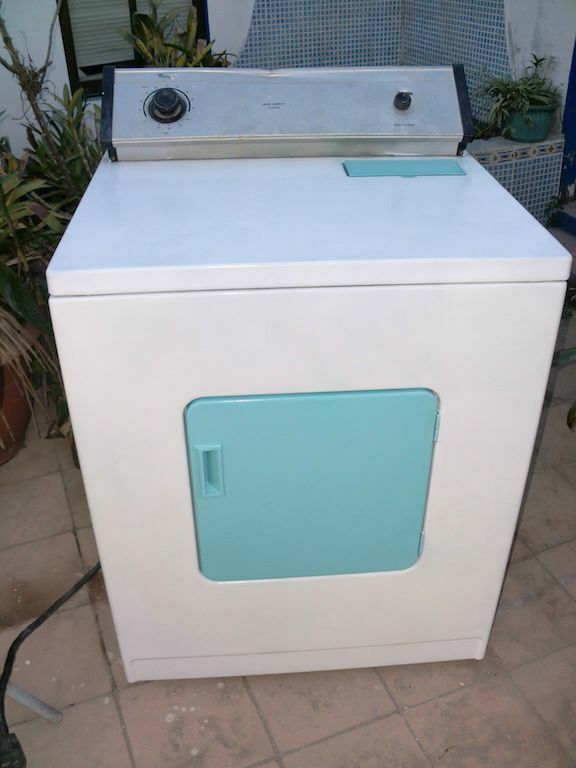 We had bought this dryer in the early 90s when we lived in Ecuador and we brought it with us when we moved to Costa Rica but I’d hardly ever used it in all those years. 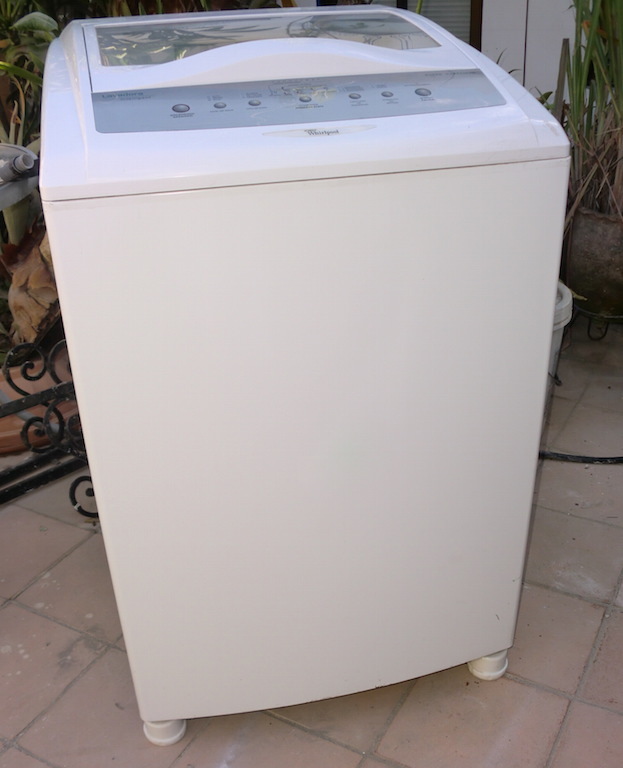 I always line dry my laundry and only use the dryer on those rare occasions when the sun hides out for several days. That’s not really too often. 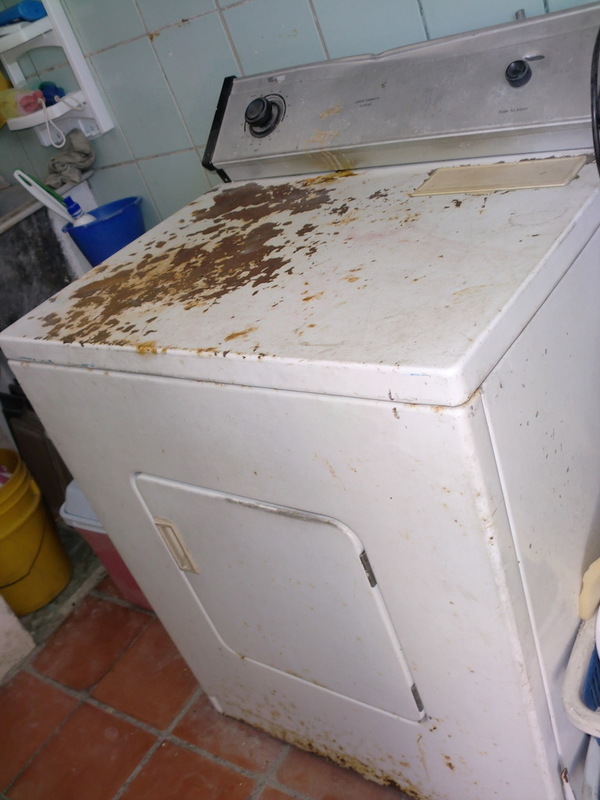 Unfortunately the elements as well as moving from place to place had taken their toll on the dryer’s exterior. 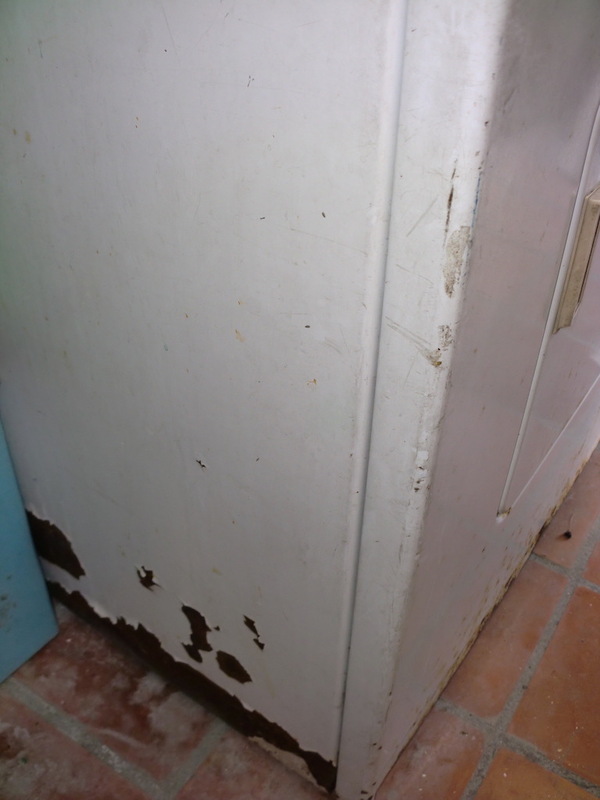 The paint had chipped and peeled and rust covered much of the top and sides. 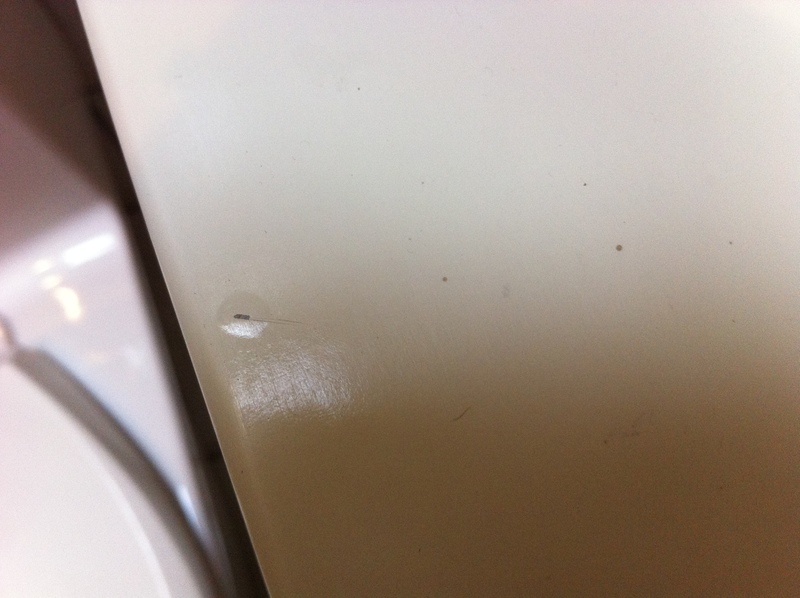 The control panel was stained and had a dent in it. 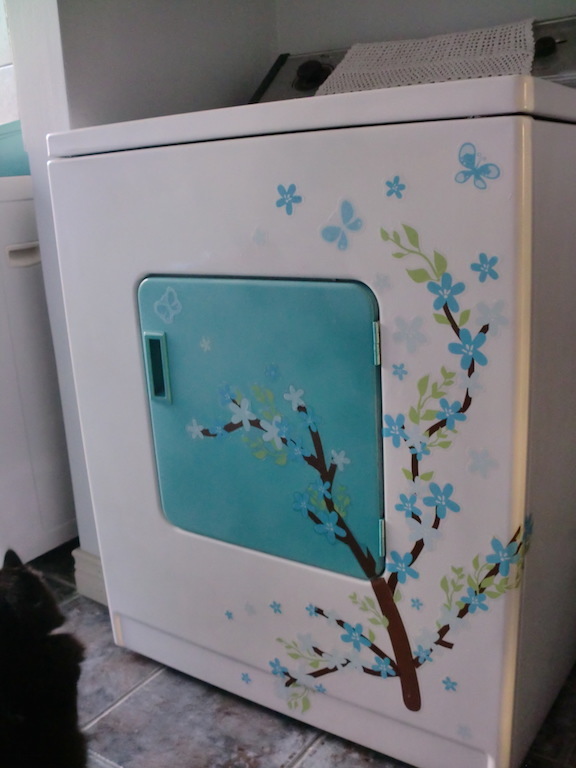 I figured that it was at least worth a try to repaint it even though I’d never attempted to paint an appliance before. 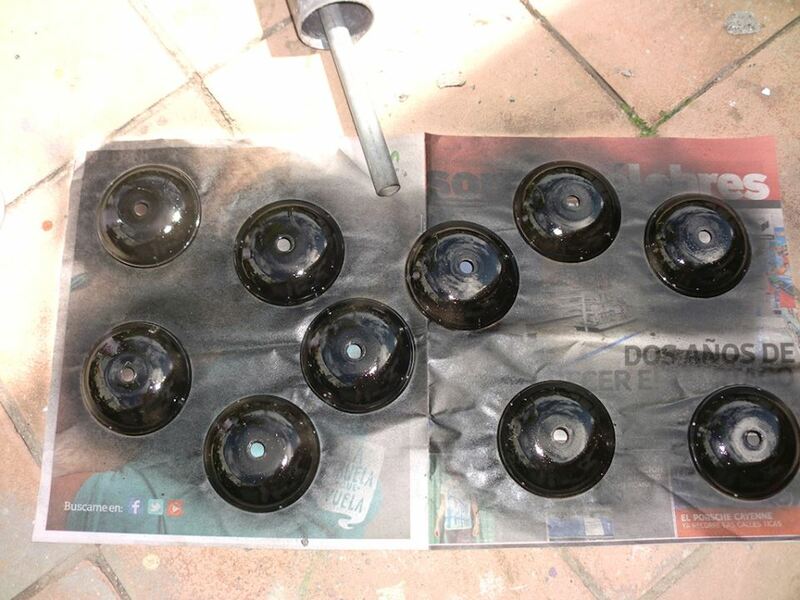 Fortunately there were several online sites that explained how to paint metal and it really wasn’t that difficult. Here’s what it looked like before I began. No wonder hubby wanted to buy a new one. 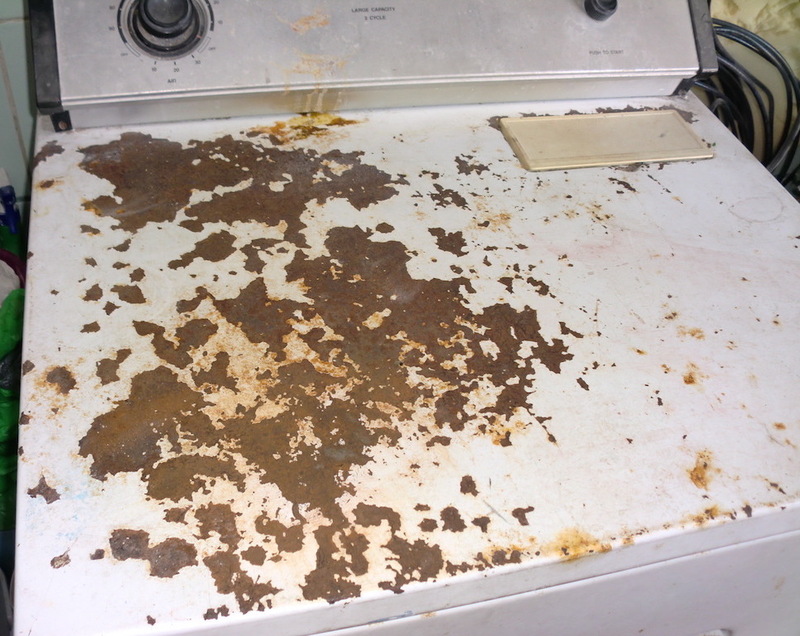 The first thing that needed to be done was to remove every trace of rust. That meant sanding. 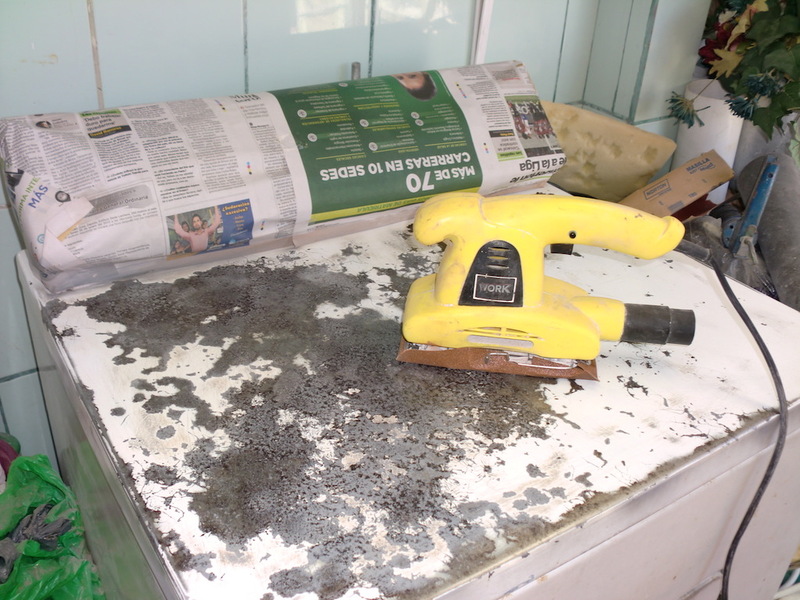 A lot of sanding. I think I must have sanded for hours until all the rust was completely gone and the metal gleamed. Next I sprayed the sanded areas with Sherwin William’s Self Etching Primer. I’d never used it before and I must say that that stuff is really great. It fills in the little pock marks and the uneven areas very nicely. After the primer dried I sanded yet again to smooth it out and re-applied another coat in the spots where it was necessary. 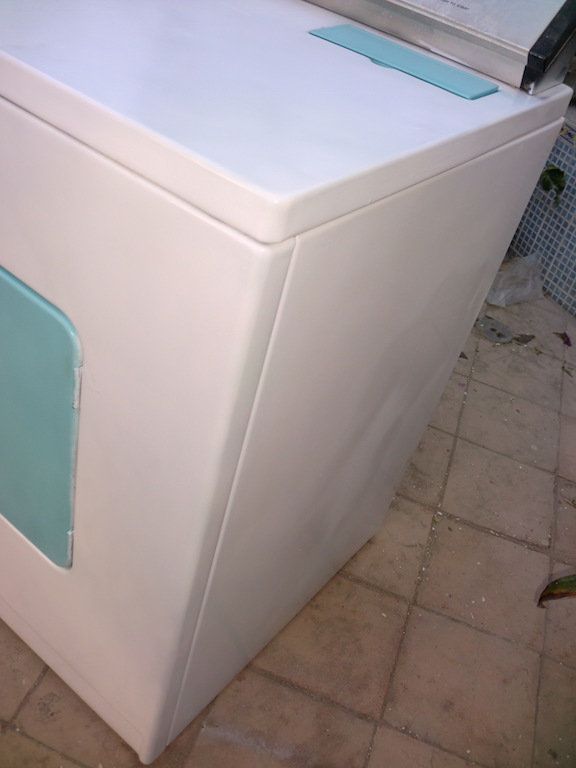 Once the primer had dried and was sanded and smoothed again, I sprayed the dryer with Bosny white enamel spray paint, applying three or four thin even coats until it was completely covered and the surface looked perfectly smooth. 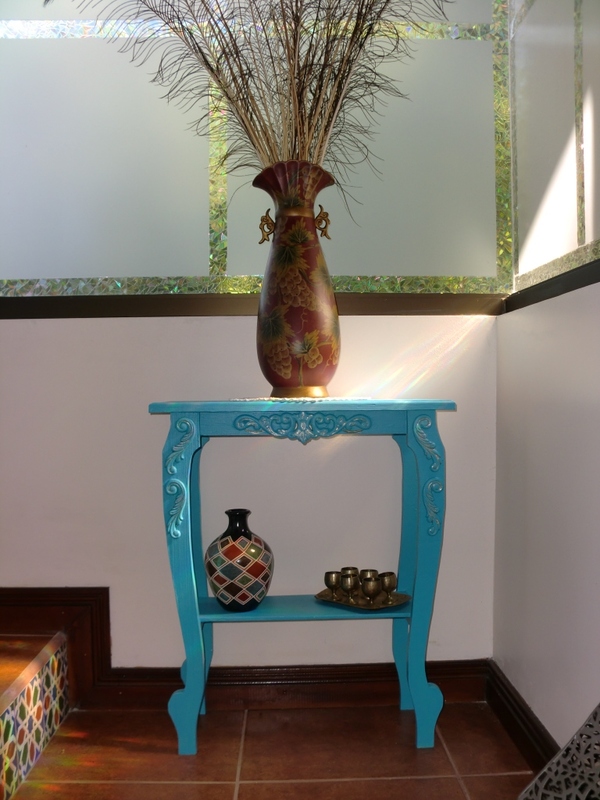 I painted the door and the lint catcher door in a retro turquoise color reminiscent of those bright appliances that were so popular back in the day. 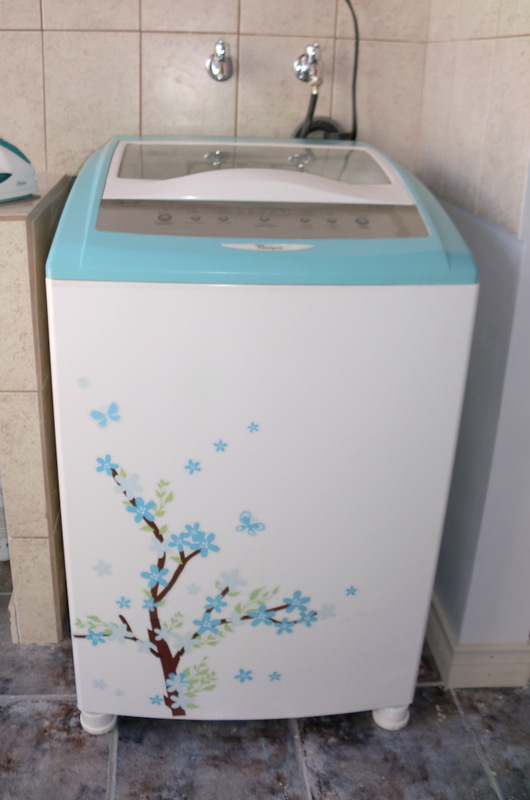 The only problem was that now the washer didn’t match. Well, not that it ever did….it’s a completely different style, but I figured a little bit of color wouldn’t hurt and it might tie it in just a tad with the dryer. 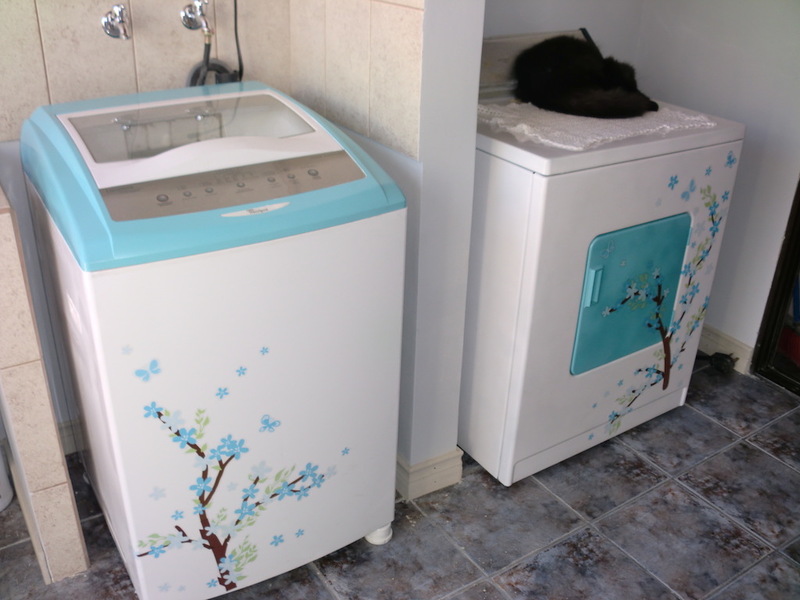 The washer was in good shape and it didn’t have any peeling or chipped paint so I just painted the top of it to match the dryer. My kitty Leyla thinks it’s a great place to sleep and it’s her new favorite spot to hang out. I put her little crochet blanket on top so she’ll be more comfortable. Since we won’t have to buy a new washer and dryer anymore and I saved hubs all that money, I’m thinking that now we can buy new living room furniture instead….muahaha. 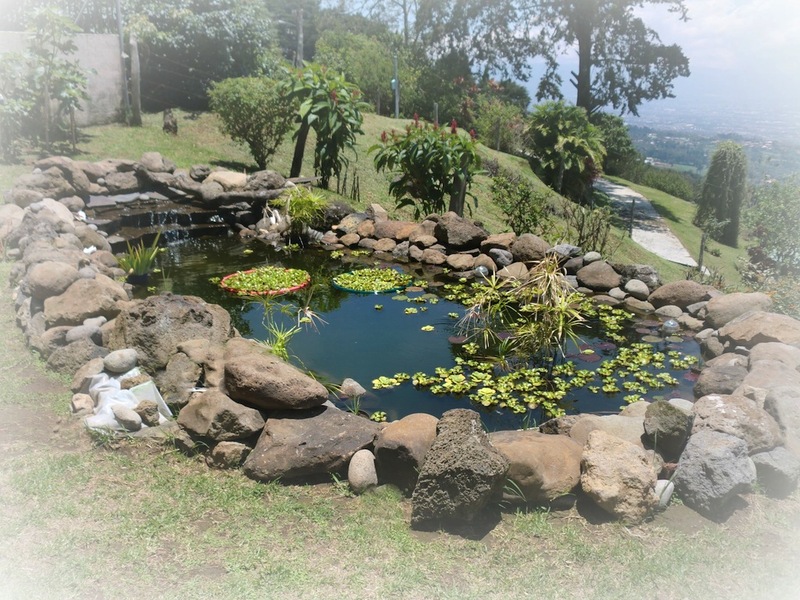 I’ve always had a fascination with fishponds and aquariums. Ever since I can remember, I’ve had fish. Sometimes just in a glass bowl and other times in large elaborate aquariums. 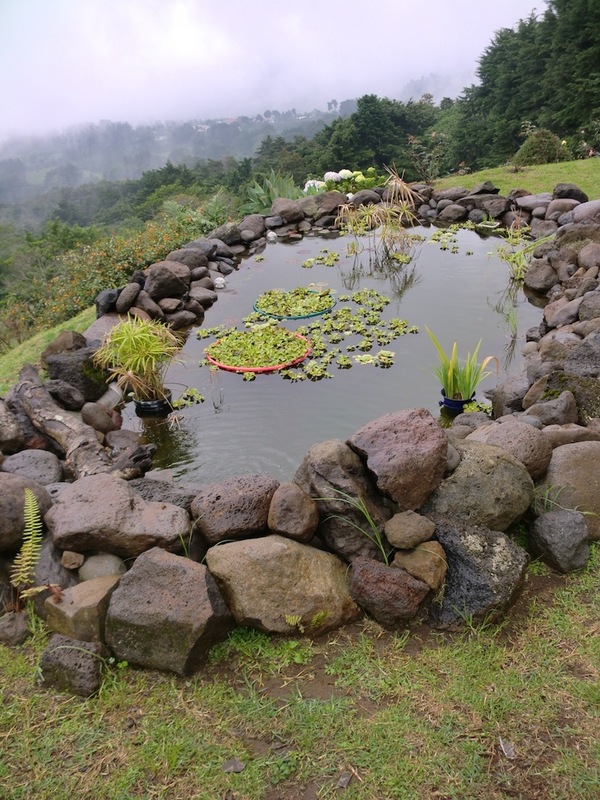 In our city house we have a small 150 galon tile pond that was built by a construction crew years ago, but it was only recently that I thought of putting in a larger pond up at the mountain house. 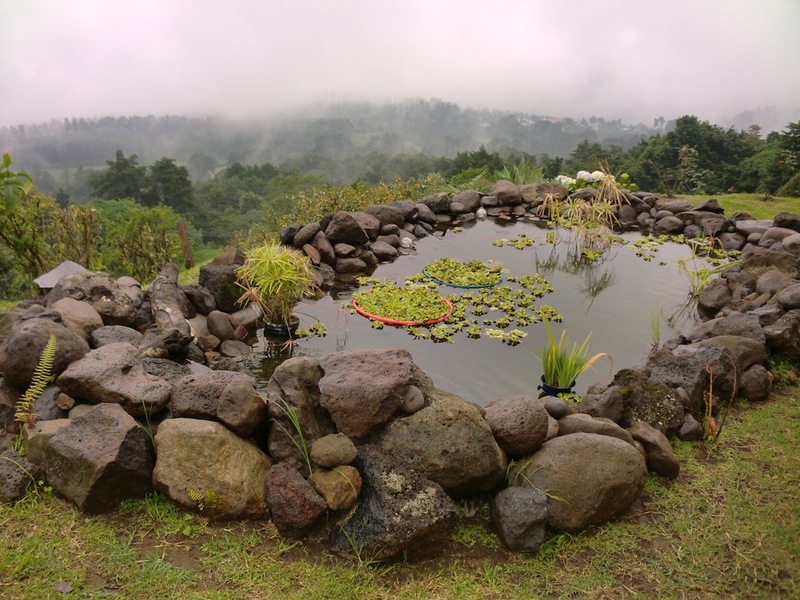 It didn’t turn out to be as easy as I had anticipated though, mainly because in Costa Rica few people have ponds and there are no pond supply stores anywhere so I had to come up with some creative substitutes for standard pond supplies. 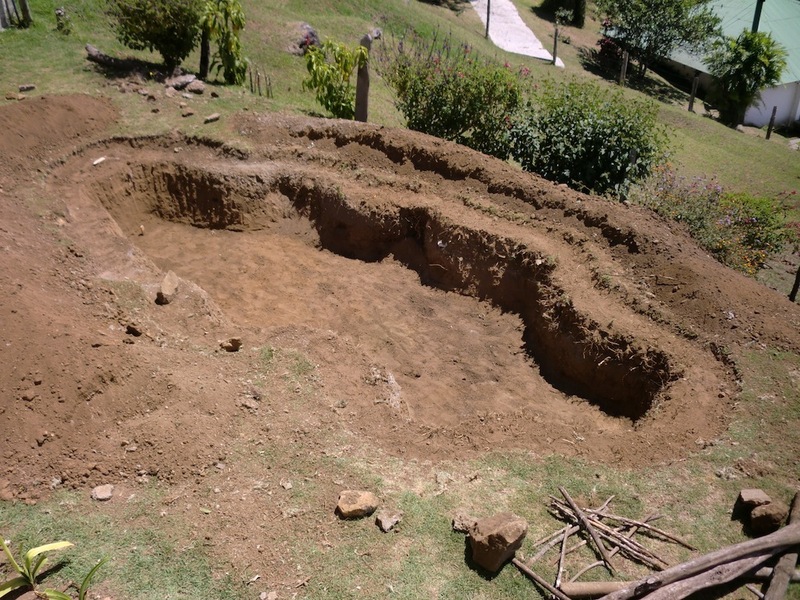 I knew I didn’t want another concrete pond because we’d had a few annoying leaks in the other one particularly after the last couple of earthquakes. I wanted something that looked a bit more natural and would blend in with the surrounding landscape. That meant that I’d have to use a rubber liner, which of course nobody sells here. In addition to this, rubber liners are so heavy that it would have been impossible to import one for less than a a couple of thousand dollars. 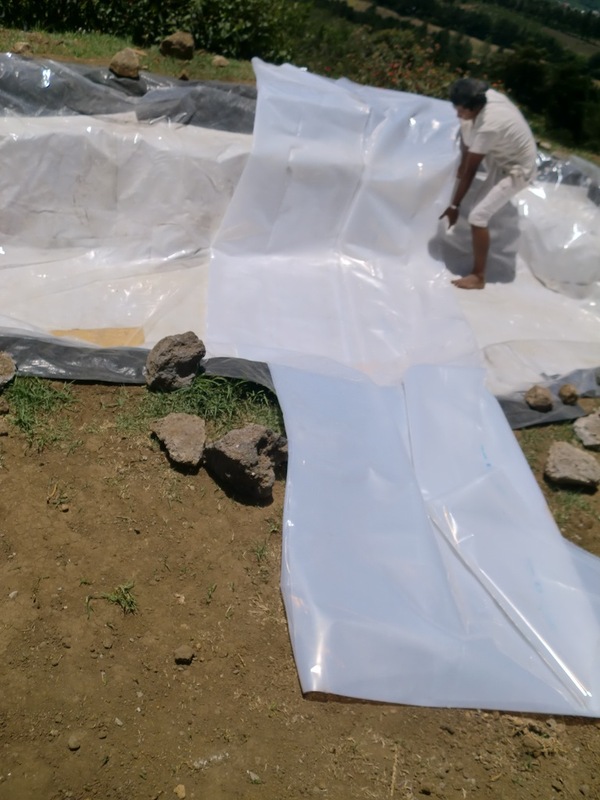 After asking around on some local pond forums I decided on a type of plastic that is normally used for greenhouse roofing, which is what locals use for ponds as well. 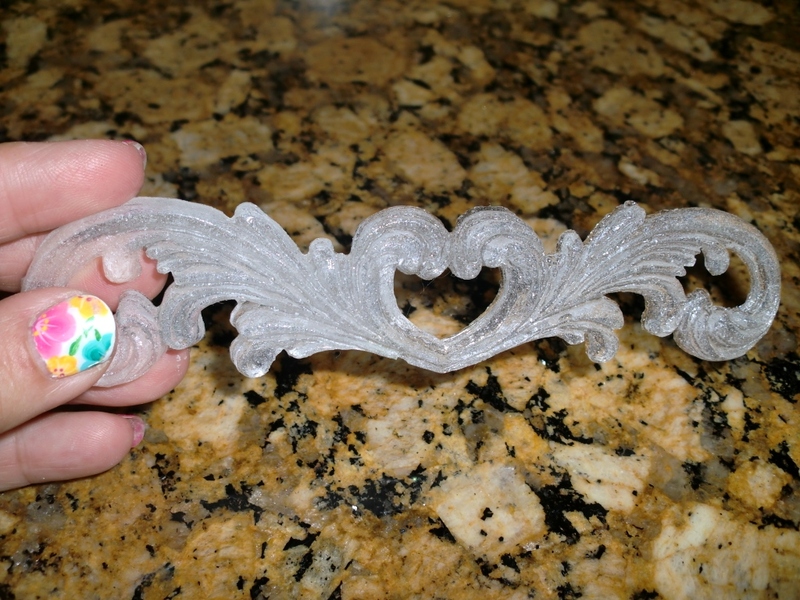 It’s UV resistant and quite thick, albeit very stiff and difficult to work with. On the plus side though, it only costs about 8 dollars per meter and it comes in 4, 6 or 8 meter widths, so I figured I could use it sideways and only buy about 4 meters lengthwise.The first step was to dig a hole. A big one. Fortunately our gardener helped me out with this project, bless his heart. He was my right hand man and I would never have been able to do it alone. He spent a couple of week-ends digging this huge hole. We left a ledge all around the edge to place plants on. Then I lined the hole with thick vinyl advertisement banners left over from our store. I turned them face down so the printing wouldn’t show. This was as a sort of extra protection under the liner to prevent random pebbles or anything else from puncturing the plastic liner. Then on top of the banners came the liner. 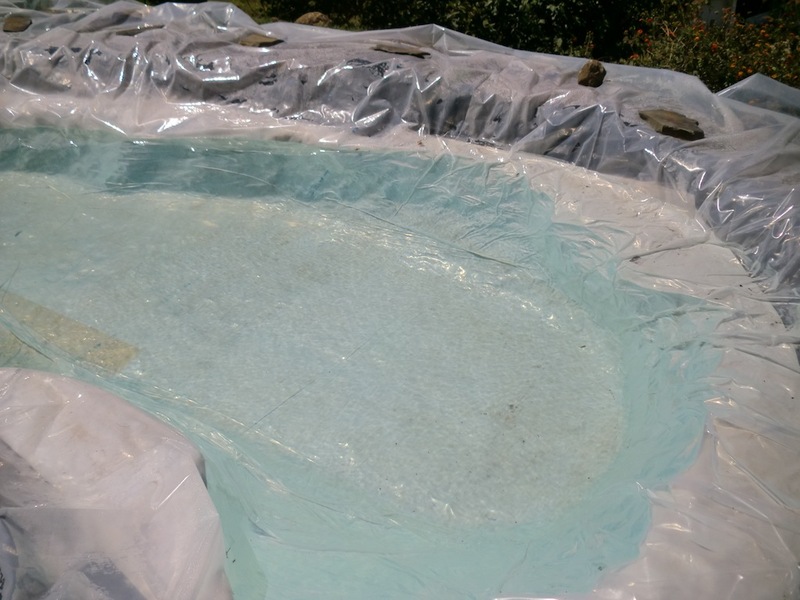 Actually I ended up using several layers of UV resistant clear plastic liner which ultimately turned out to be a nightmare because it was clearly not designed for lining ponds and it was susceptible to punctures. Boy is that an understatement. 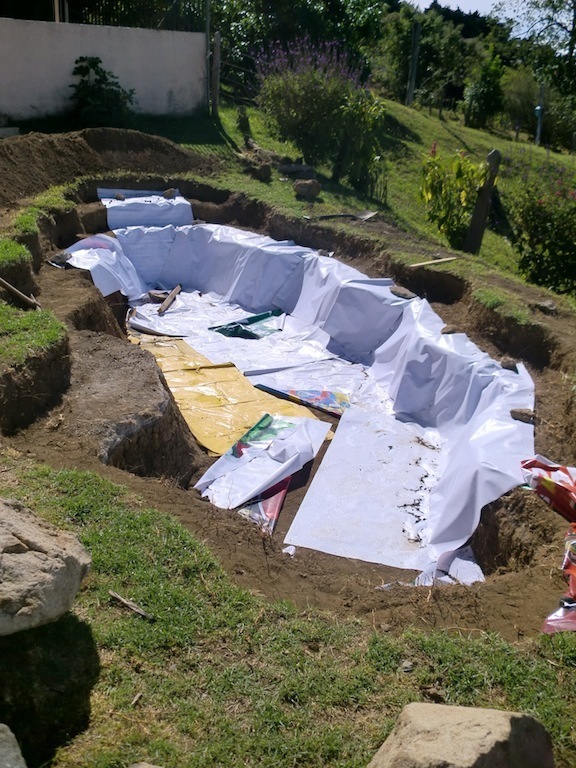 After laying out the first liner and getting it to lay flat without a single crease or fold, I woke up the next morning ready to fill it with water only to discover that deer had gotten inside and ripped holes in the liner with their hooves. So I bought a new liner and laid it on top of the first one. 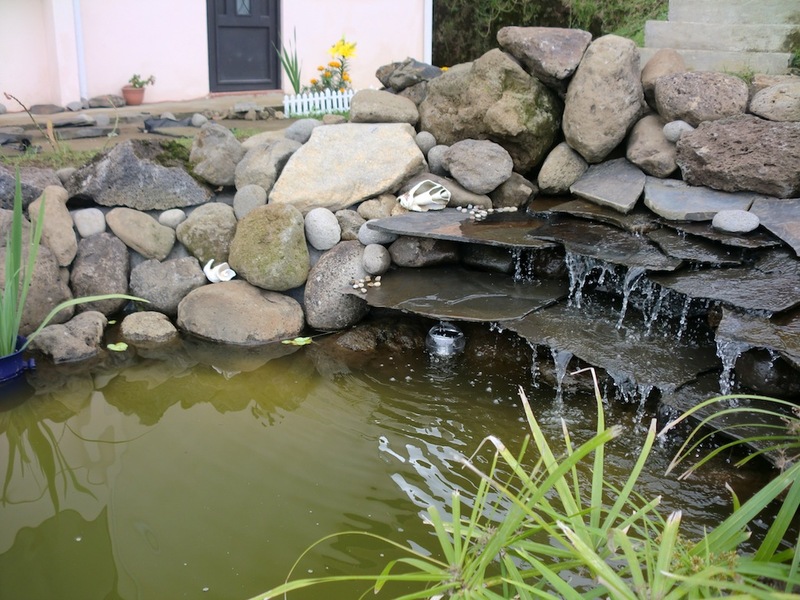 After filling the pond completely I was dismayed to discover that it was leaking water at the rate of about 5 inches per day. I had to empty it out and locate the problem area. Apparently the store had sold me a defective piece of plastic full of tiny holes. I won’t bore you with the details but suffice it to say that I went through six (count ’em, six) liners. I just kept placing them one on top of the other and I began to think it was jinxed. I guess the sixth one’s a charm because after that many liners it was finally water tight. 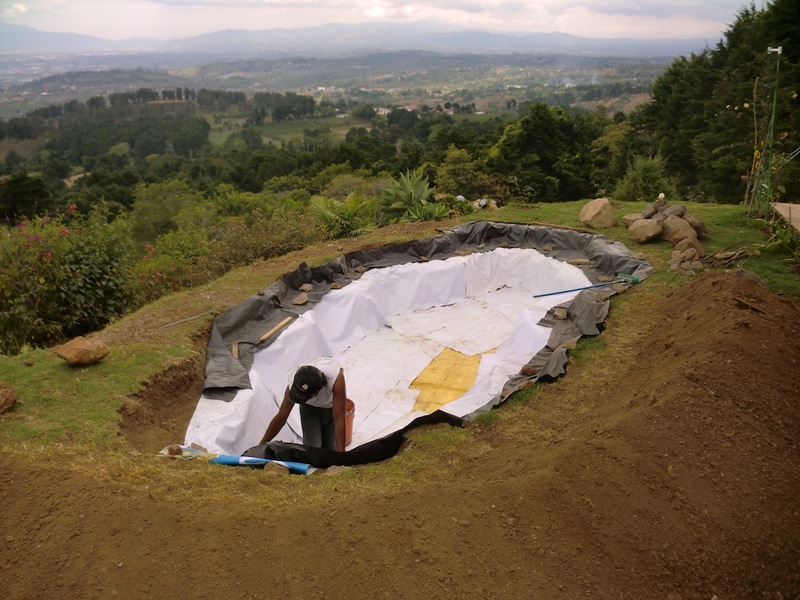 Here’s our gardener wrestling with one of the several stiff plastic liners and trying to unfold it. I’m calling it a liner but I think it would be more appropriate to say “makeshift” liner. 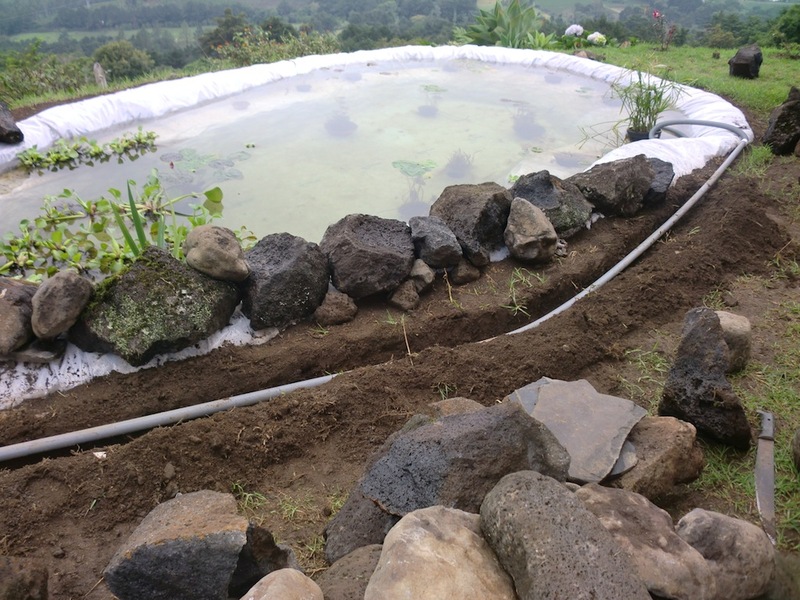 After cutting the excess liner around the entire perimeter and tucking the raw edge under into the soil, we dug a shallow trench all along one side of the pond to run the pvc tube through from the pump to the filter. A home made DIY filter, I might add. Heh. 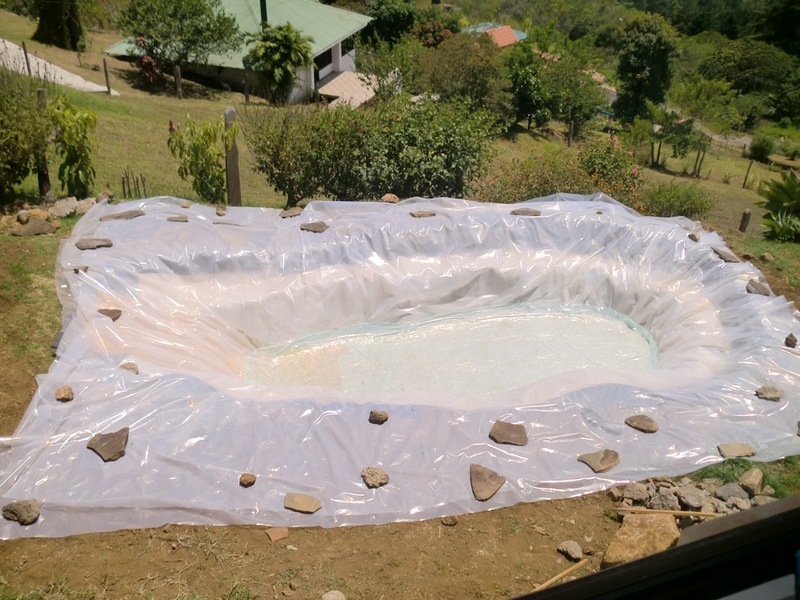 This is the filter, a 70 gallon plastic drum filled with volcanic rock, cut up sponge and thick quilt batting. Works pretty well. All the trenches were later filled in and the drum now has a cover. 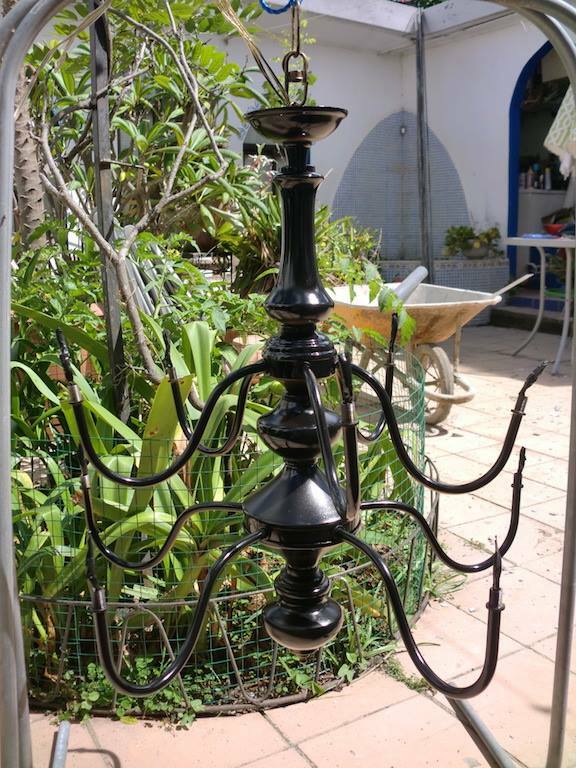 I also spray painted it green so it would blend in better among the shrubs. 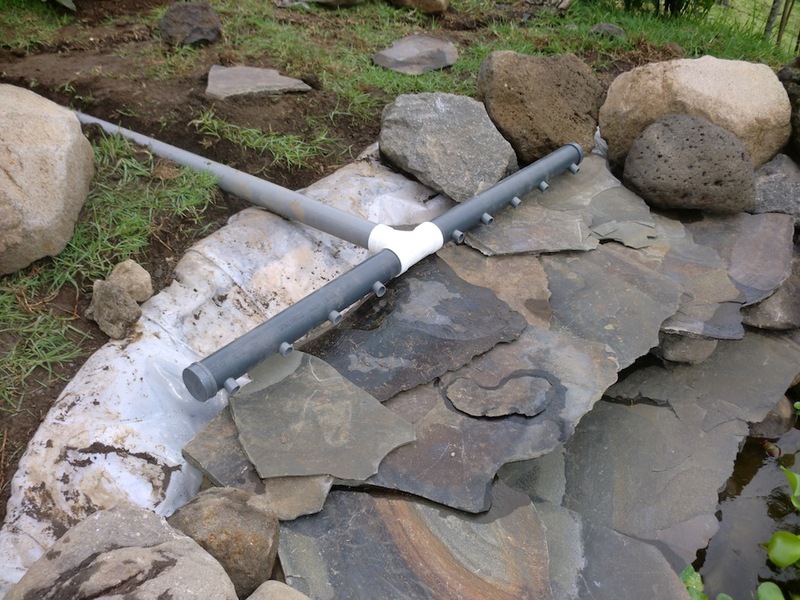 After I made sure everything was working properly and there were no further leaks, we began to build the waterfall. Most of the rocks were picked up at a local river. We made several trips and loaded up the van and lugged them back up to the pond. 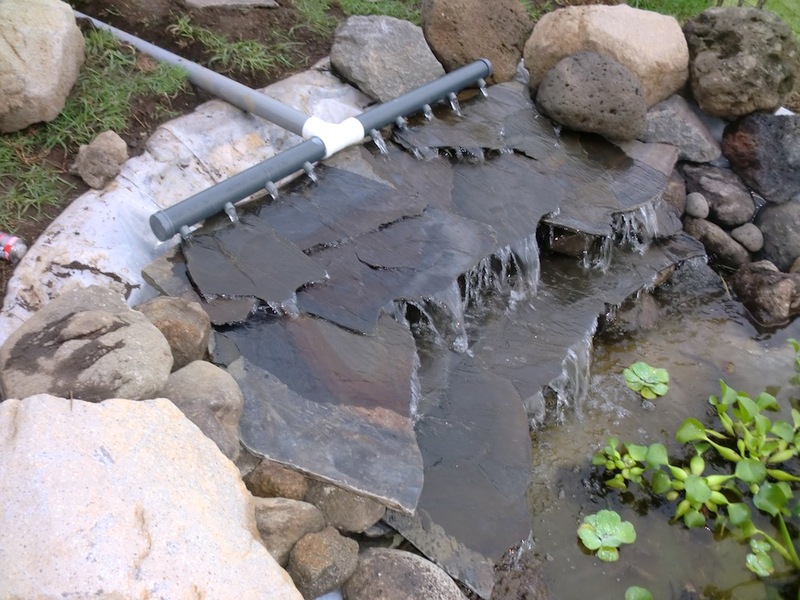 I wasn’t about to spend 200 dollars on a pond weir (plus shipping and customs tax!) so I made one from a 4 foot segment of 3″ diameter pvc pipe. I drilled several evenly spaced holes into this pipe and then inserted small segments of 1″ pvc pipe which would distribute the water evenly. It works quite well at a fraction of the cost. 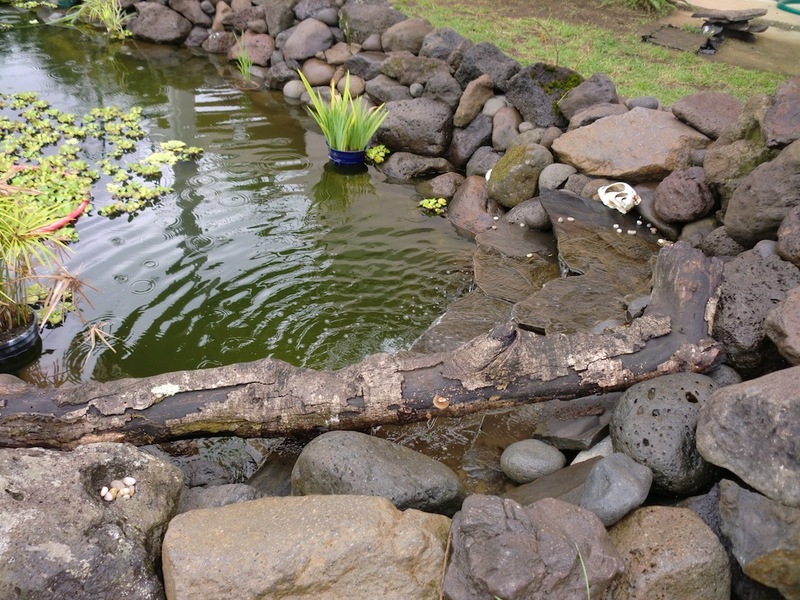 The part that took the longest was the arranging of the rocks around the pond. It seemed that we only covered a couple of feet at a time and then it was off to the river again to haul more rocks. This took us a few weeks. 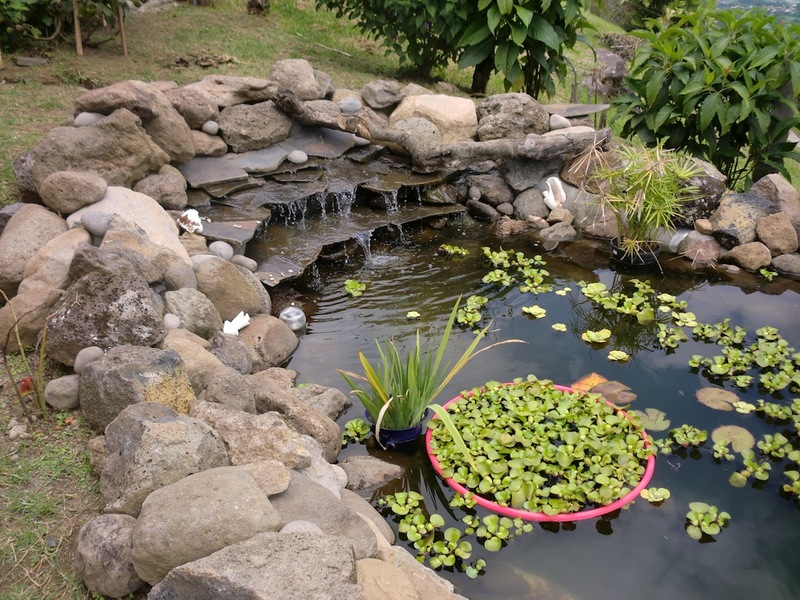 Yes, that is indeed a fuchsia hula hoop you see in the middle of the pond. 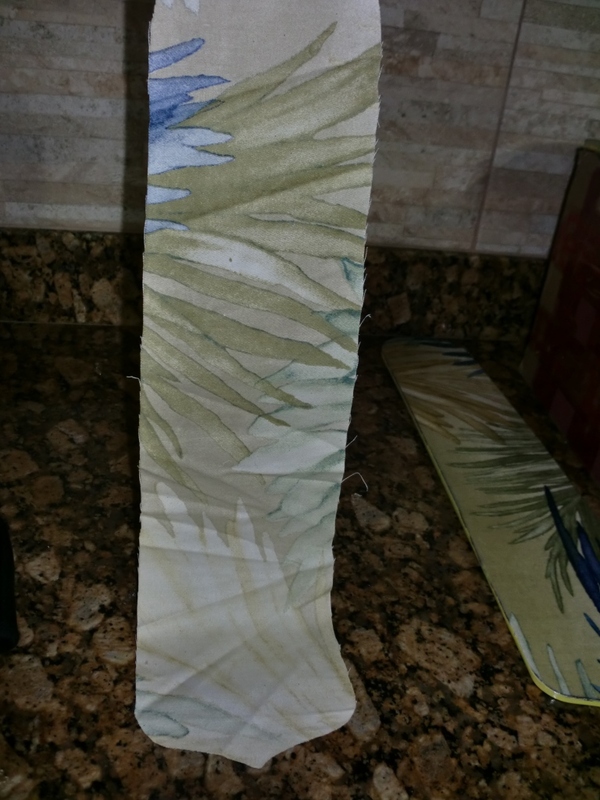 I swiped it from my daughter’s room and threw it in there to hold the water hyacinths in place. The wind kept blowing them all over the pond and they’d end up on top of the water lilies almost smothering them. So to keep them under control I confined them inside the hoop. 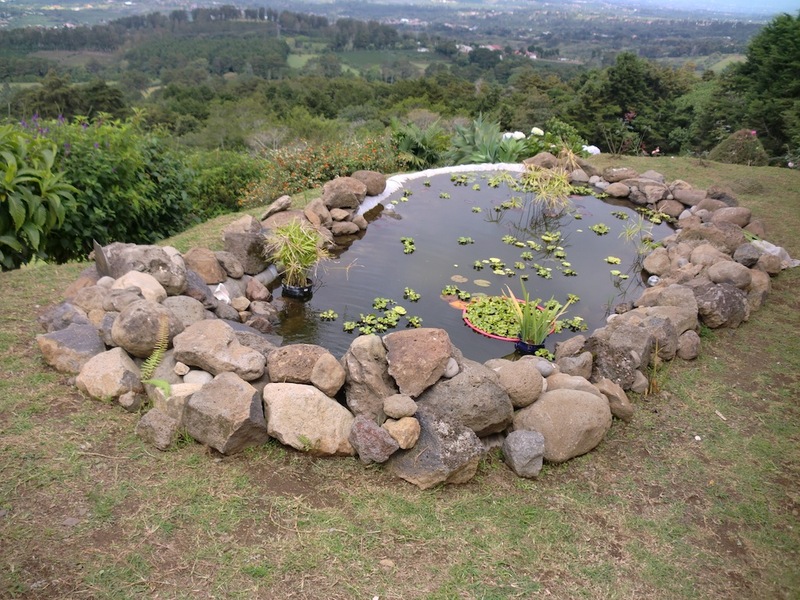 Water hyacinths multiply so fast that I now have two hoops in the pond. 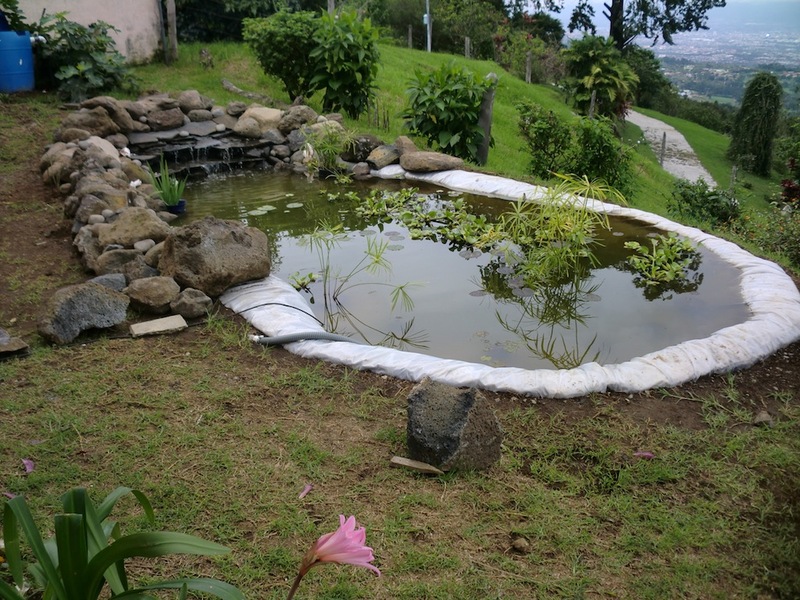 I also put in a couple of large Koi fish just to keep the mosquito population in check but much to my surprise, within a week they’d had about 300 babies. So now the pond is teeming with fish. 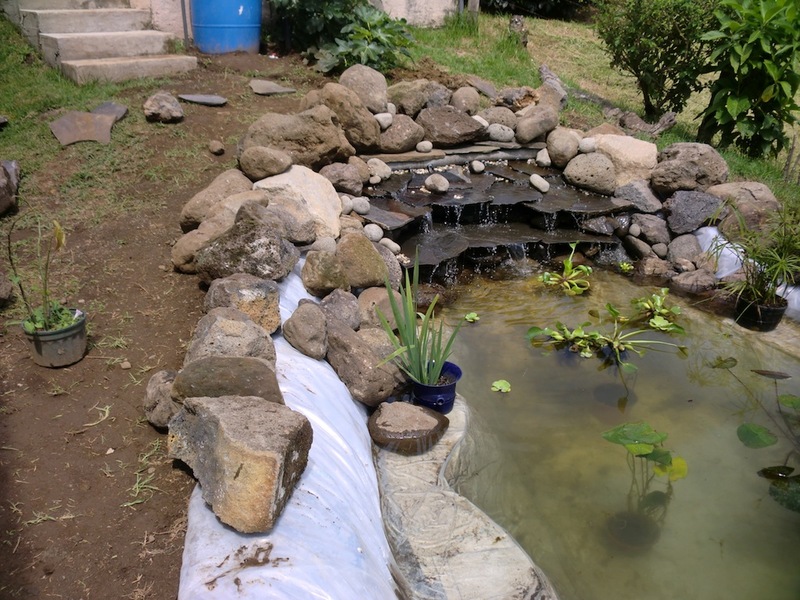 It was a lot of work for sure, especially because neither the gardener nor I had any sort of experience building a pond. We pretty much learned as we went. But now I can sit back and enjoy it. I have a nice view of it from my upstairs window as well as from my kitchen window and I find the soft trickle of the waterfall very soothing.